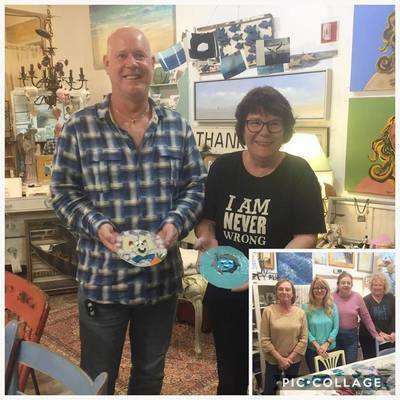 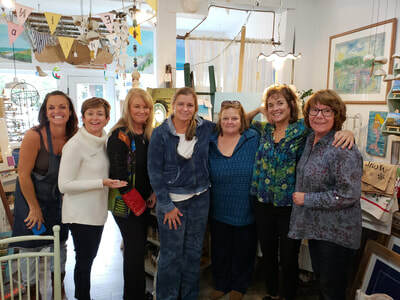 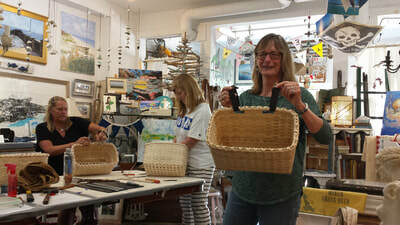 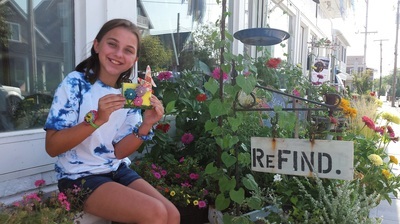 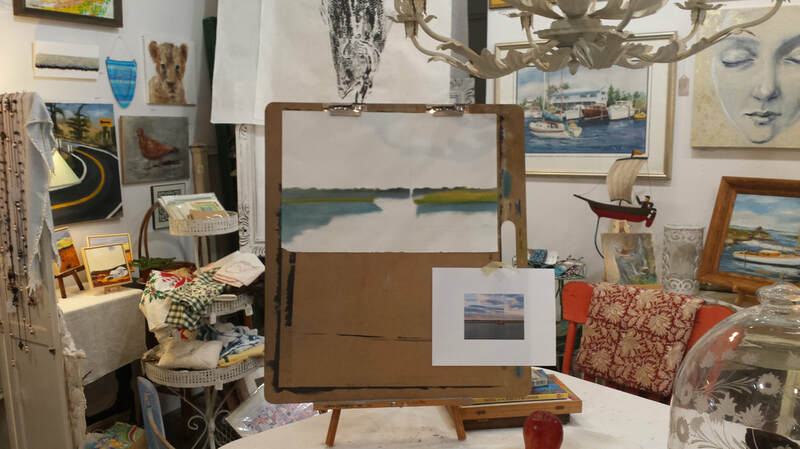 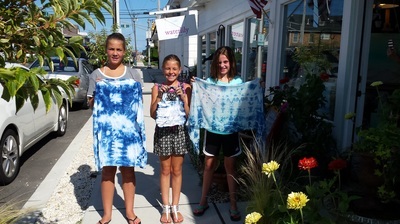 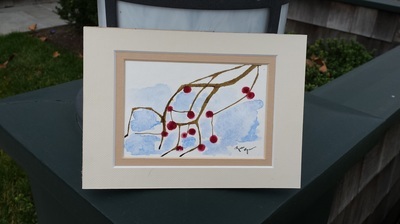 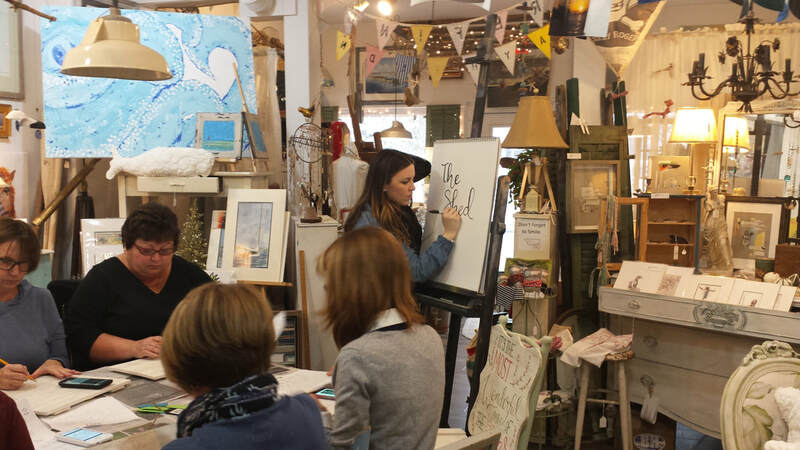 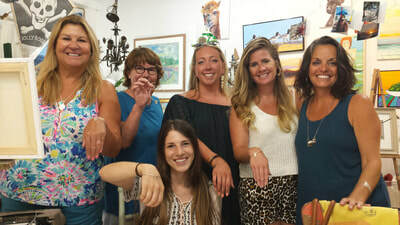 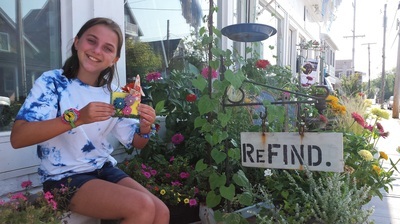 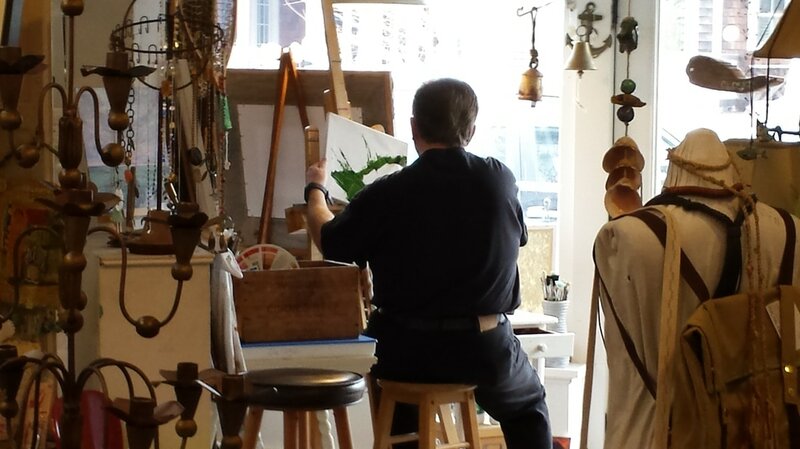 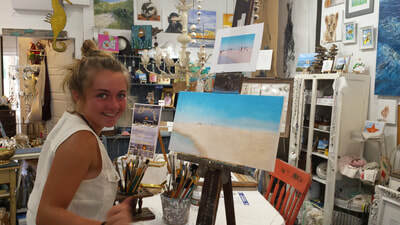 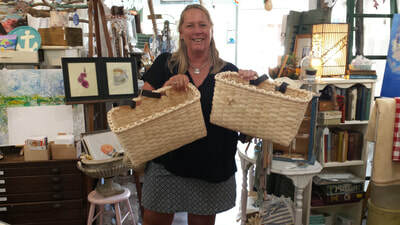 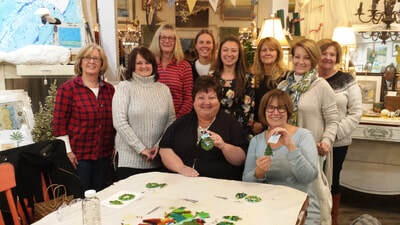 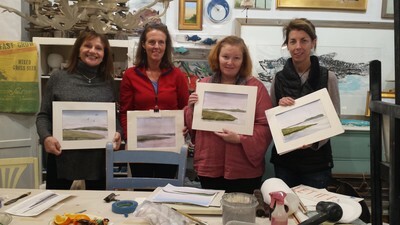 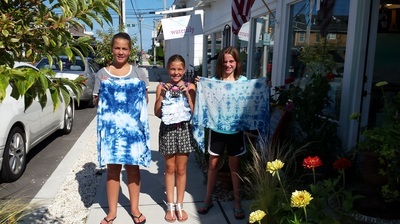 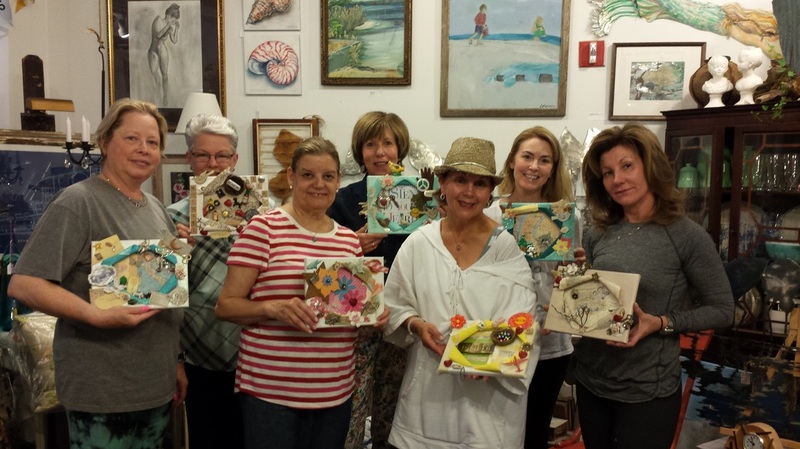 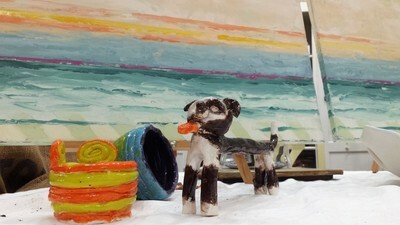 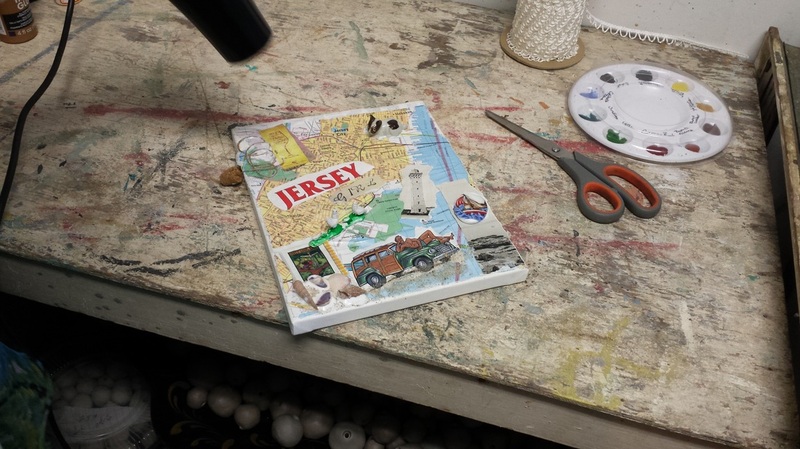 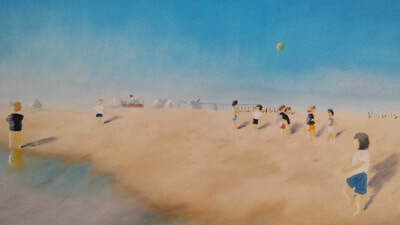 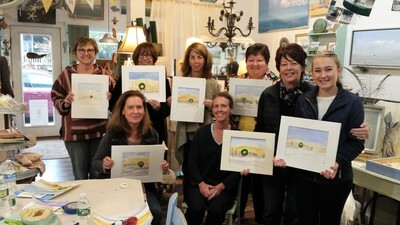 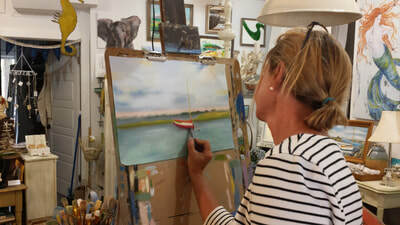 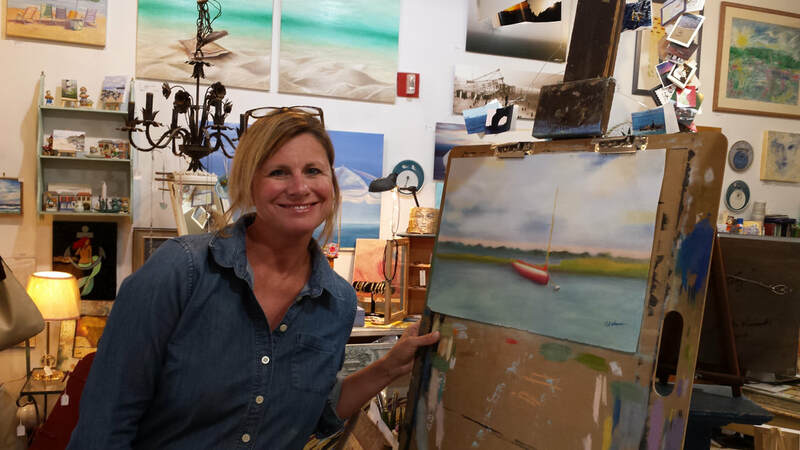 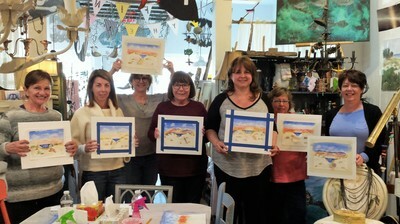 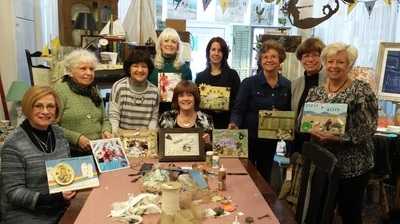 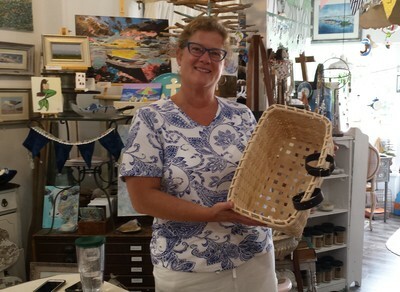 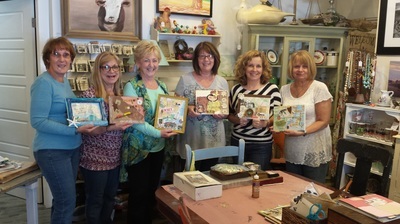 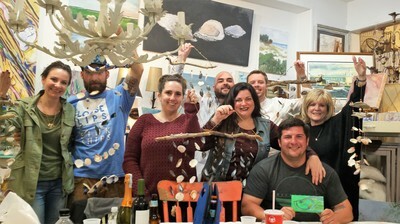 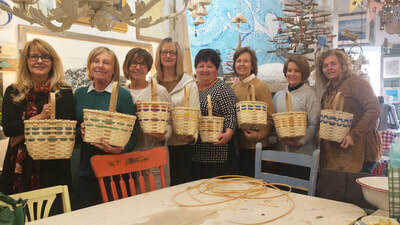 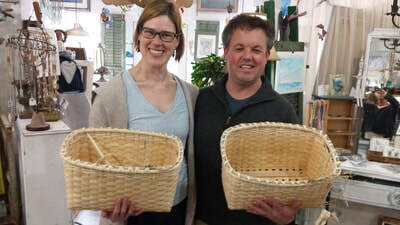 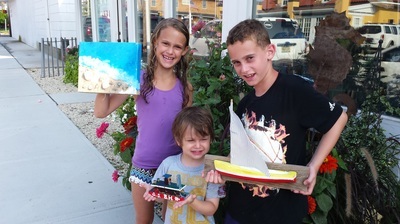 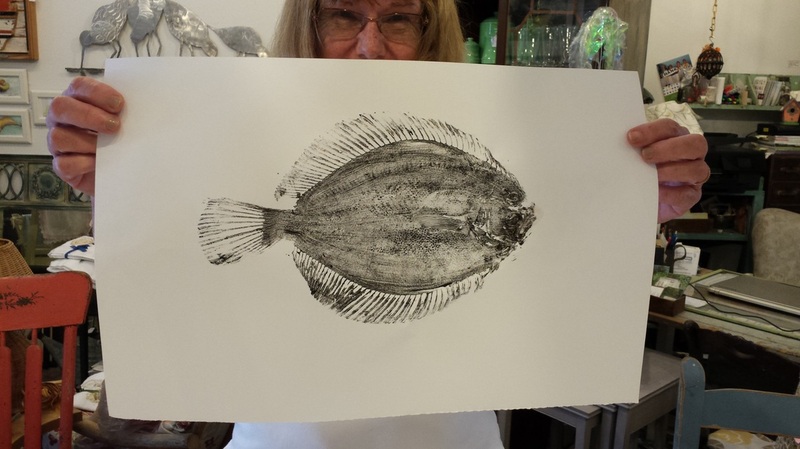 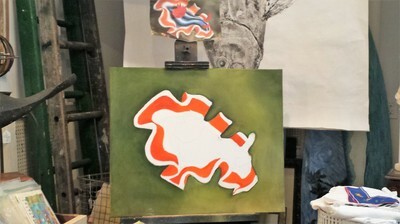 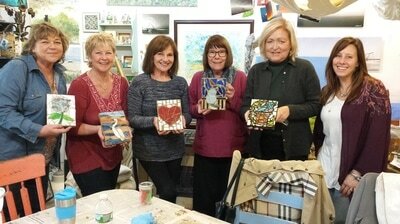 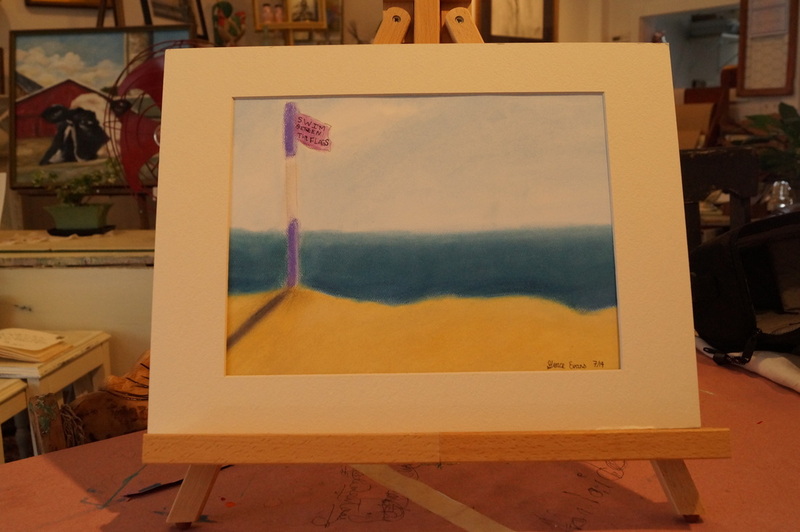 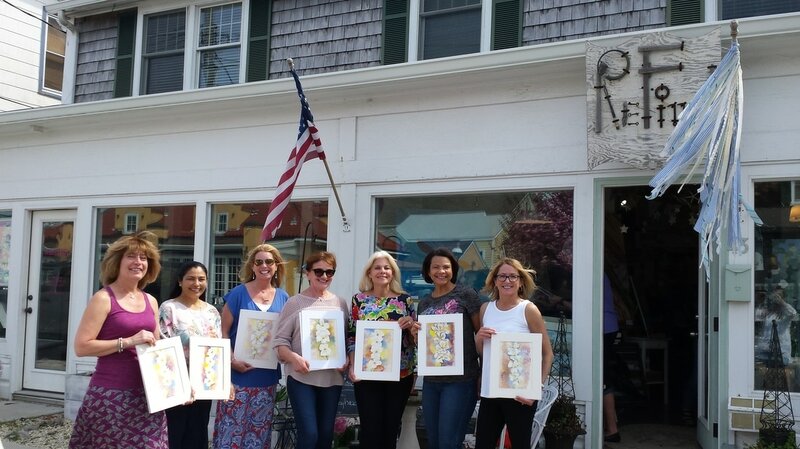 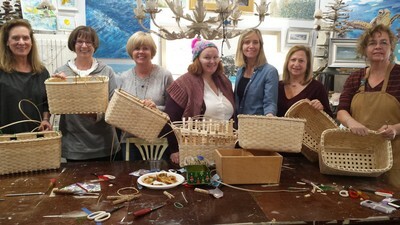 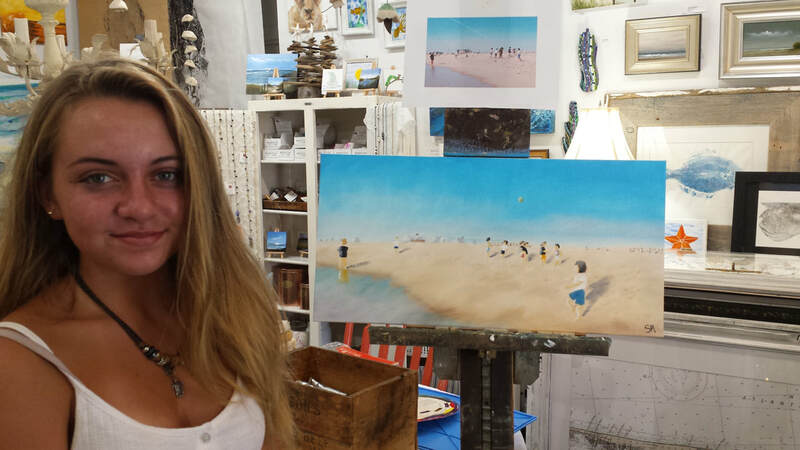 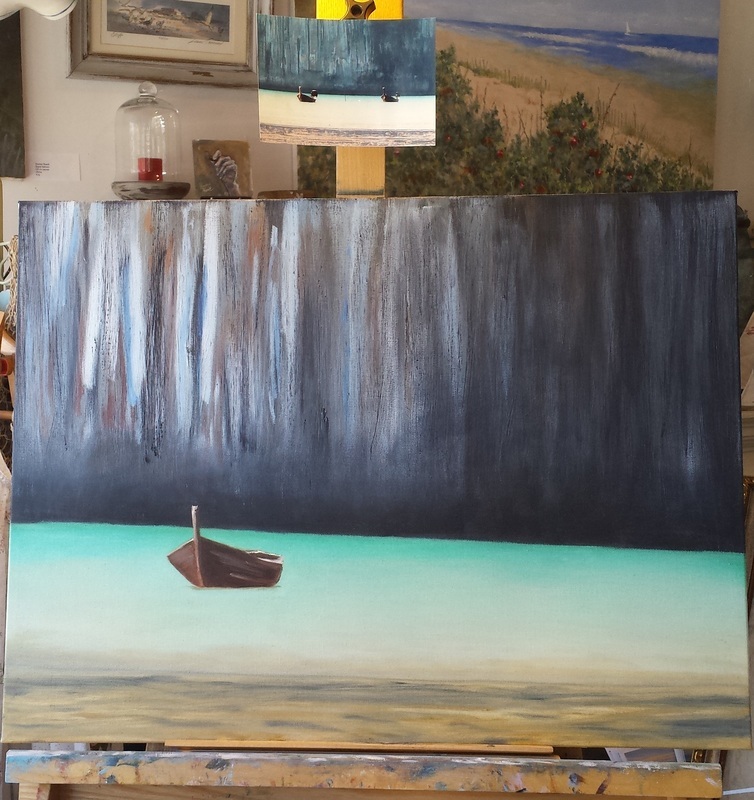 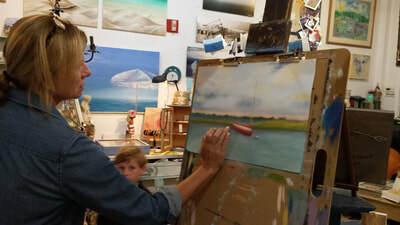 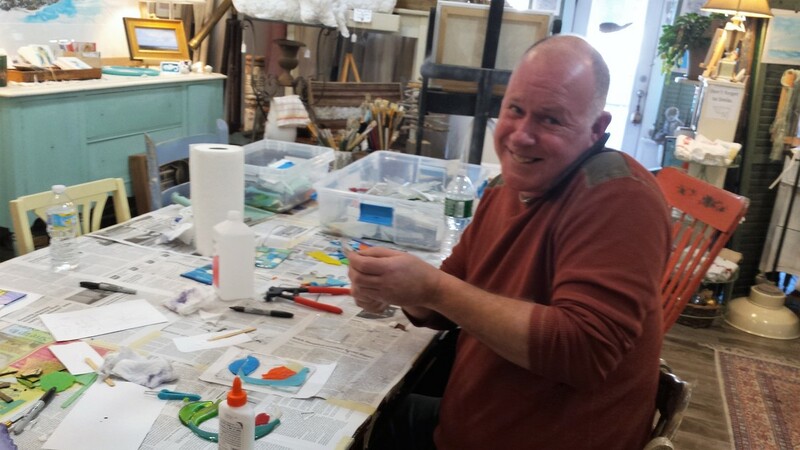 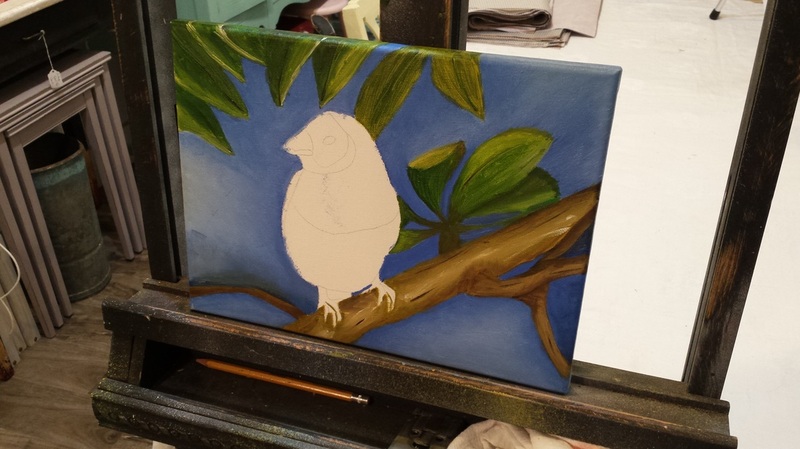 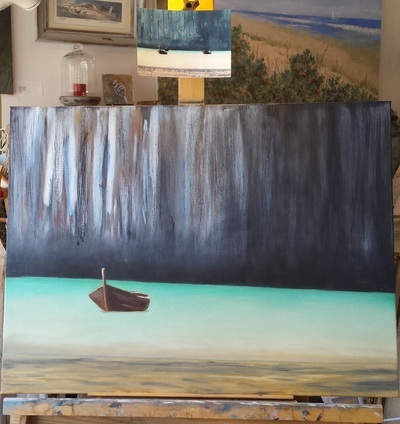 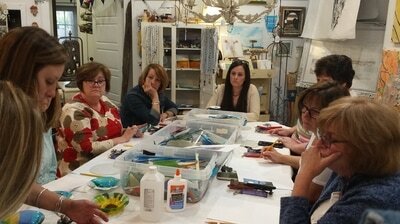 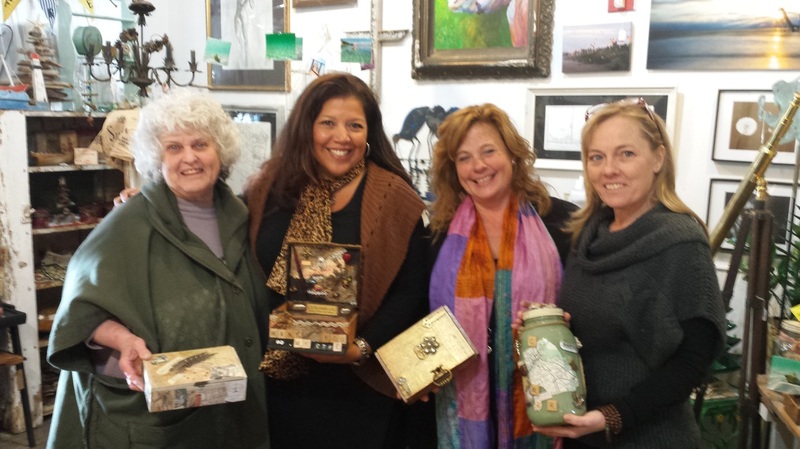 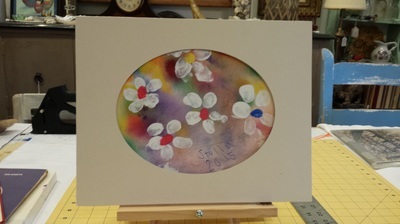 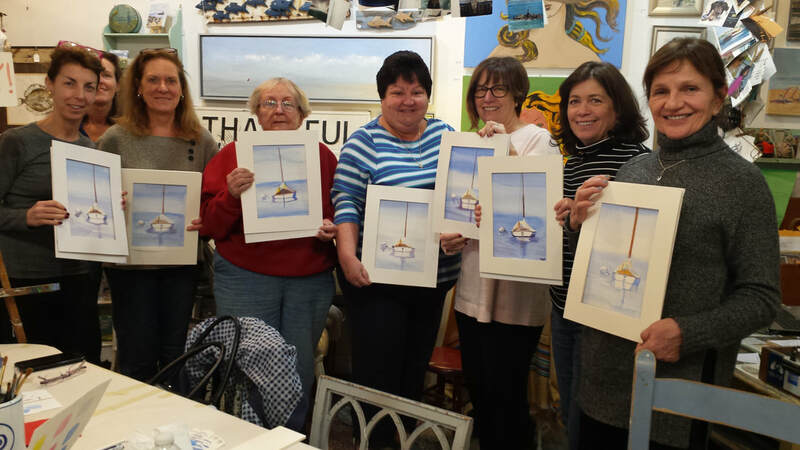 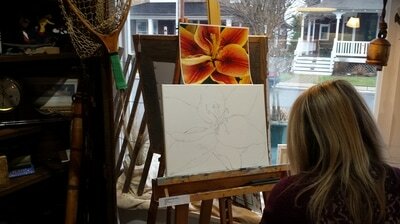 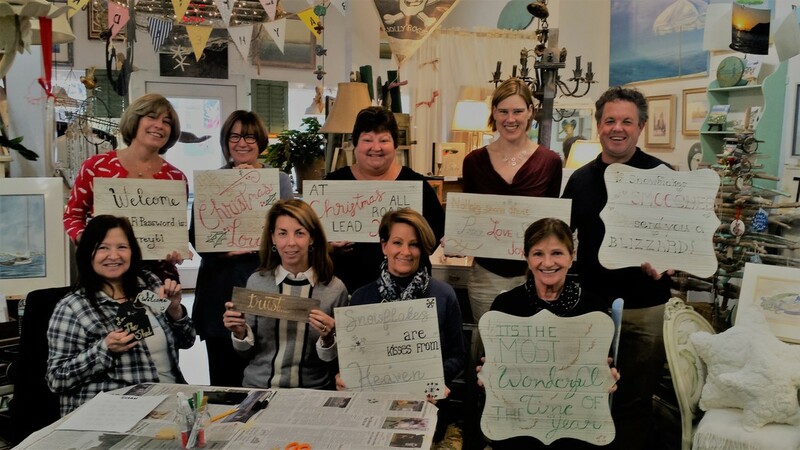 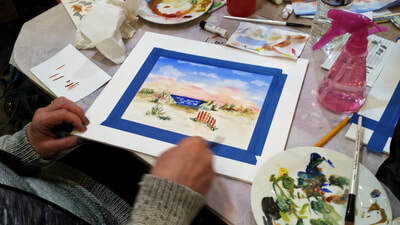 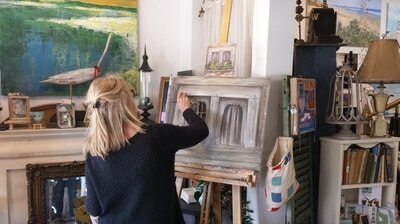 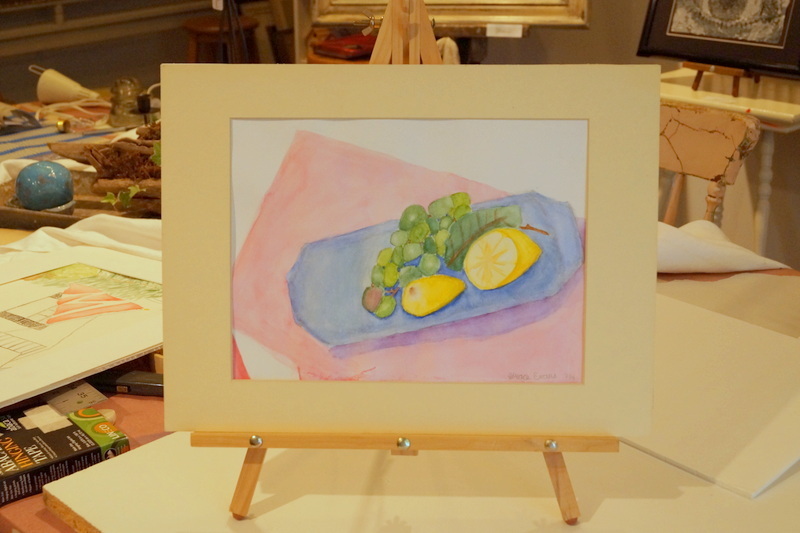 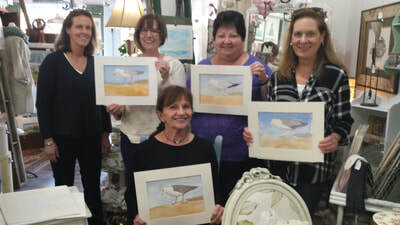 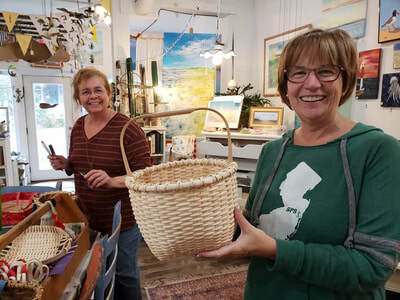 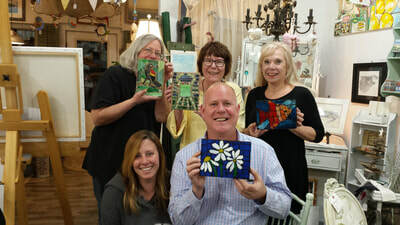 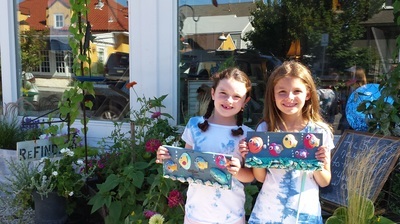 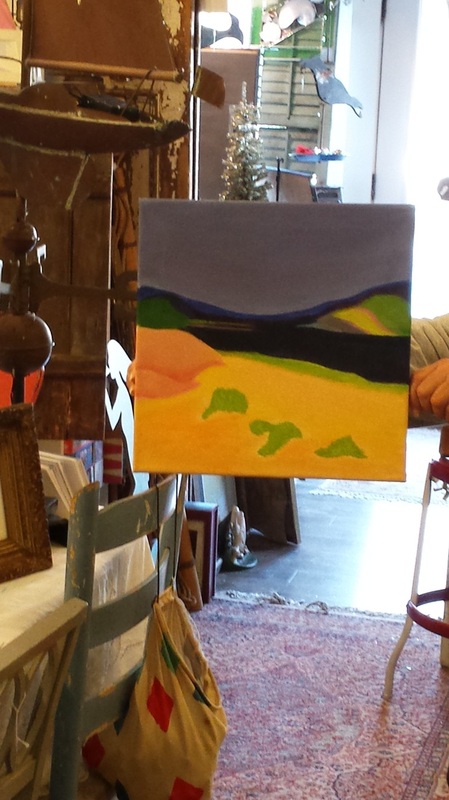 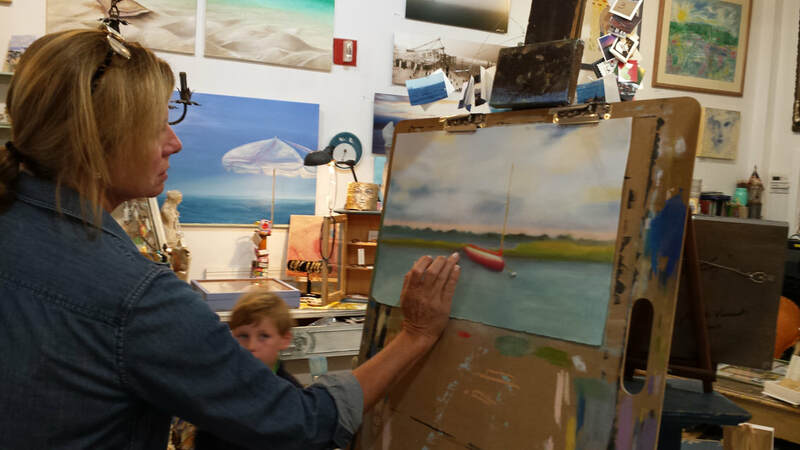 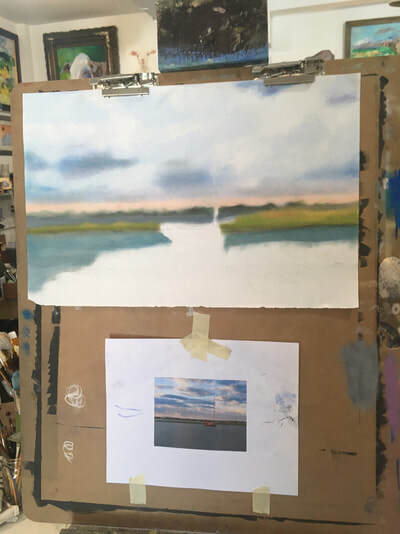 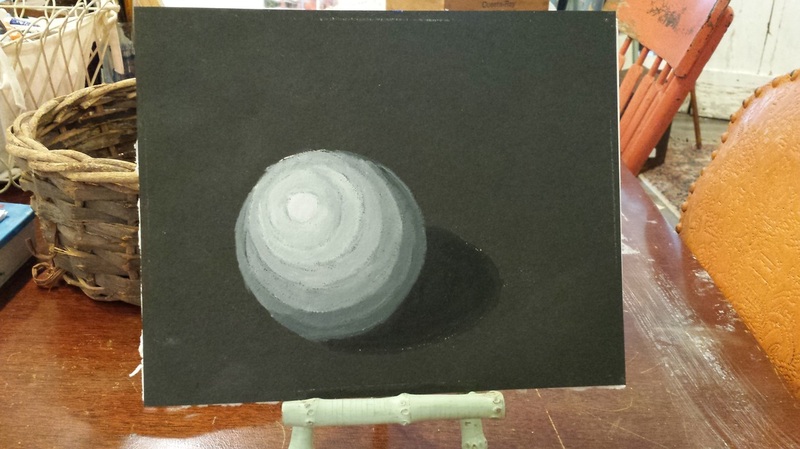 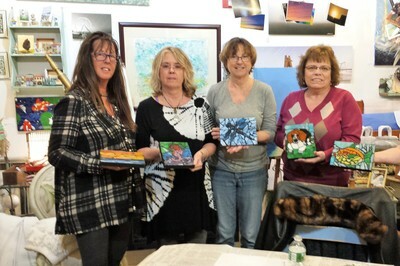 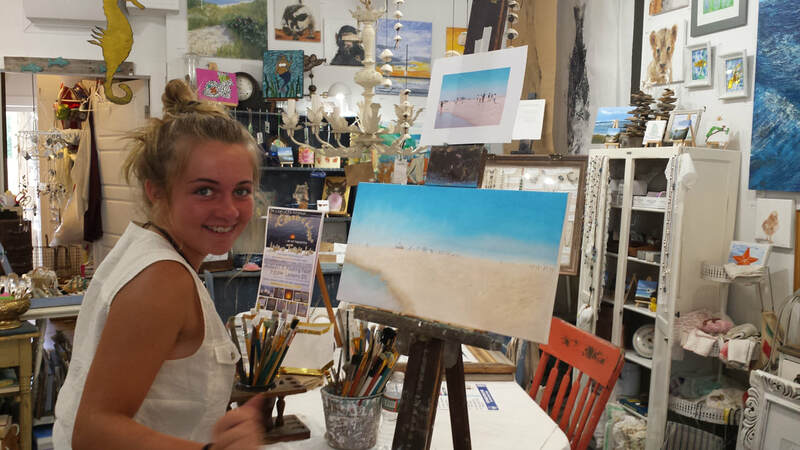 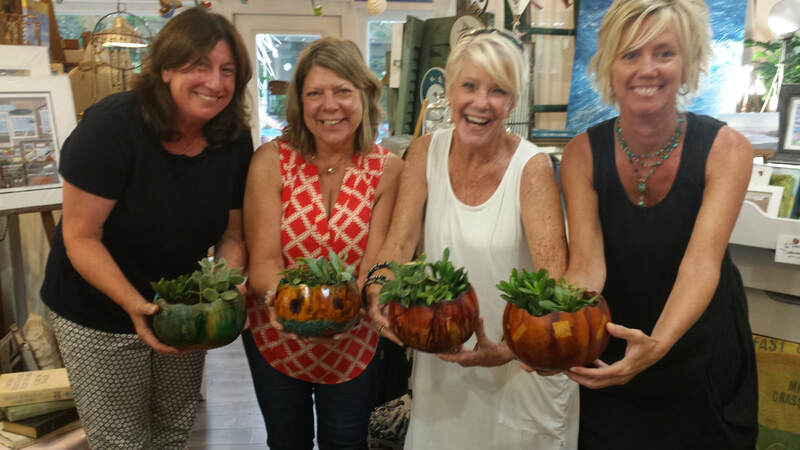 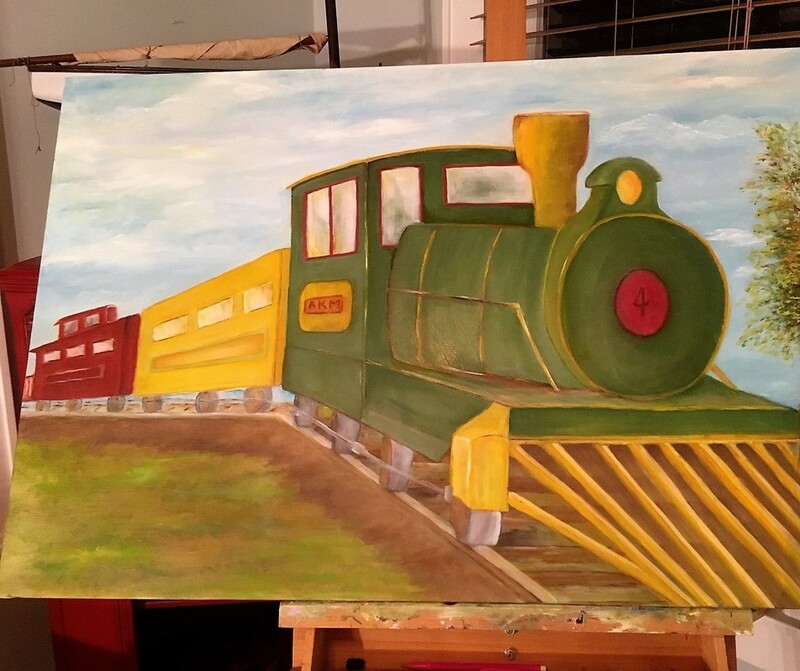 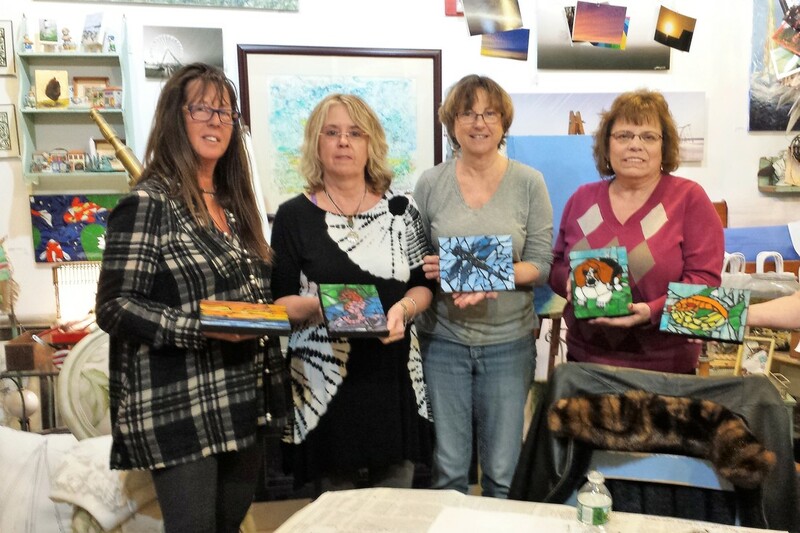 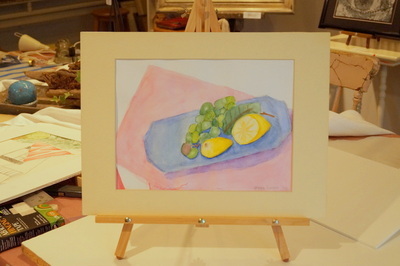 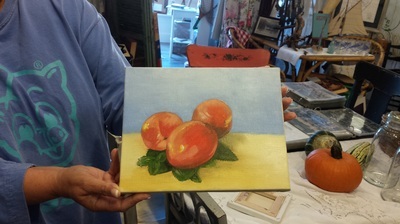 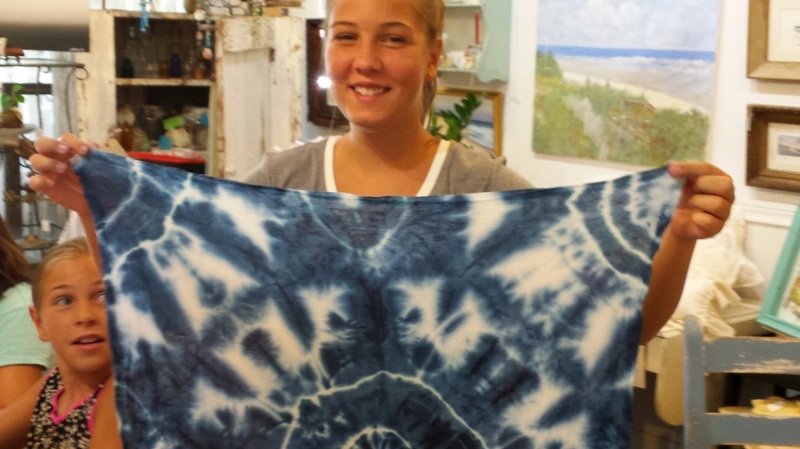 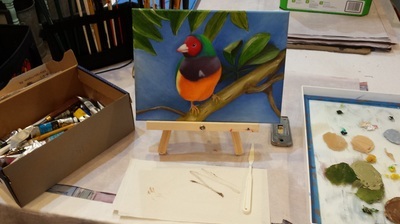 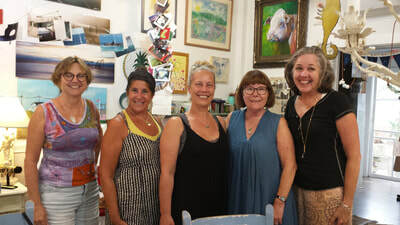 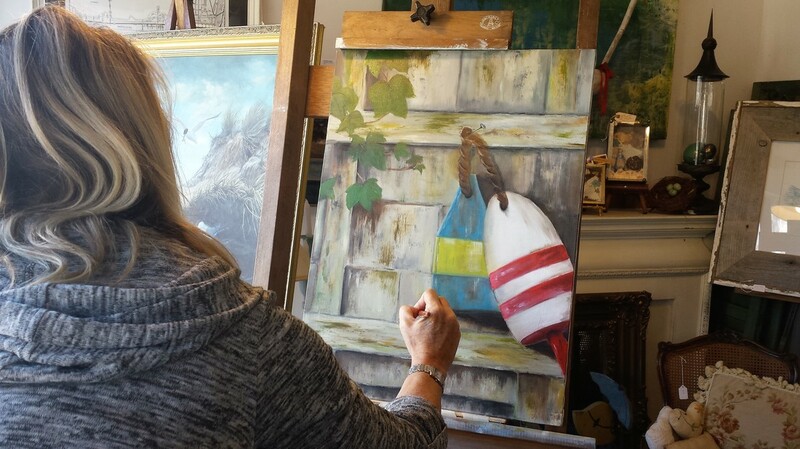 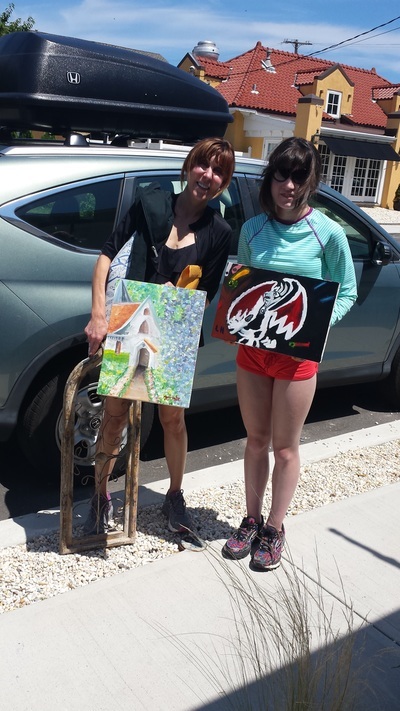 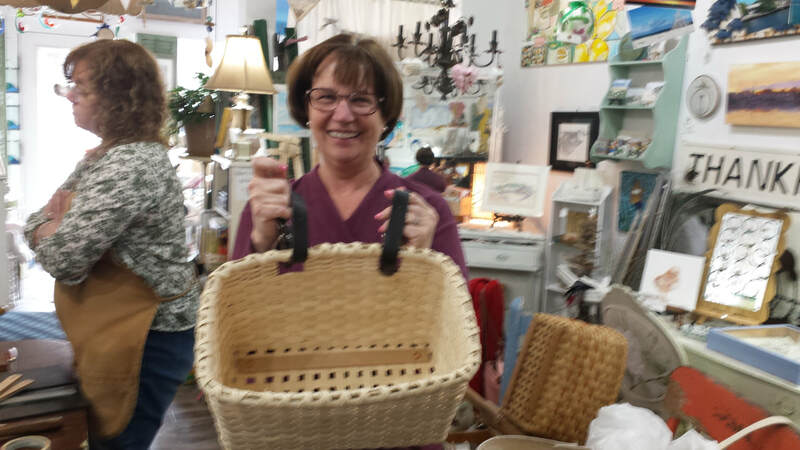 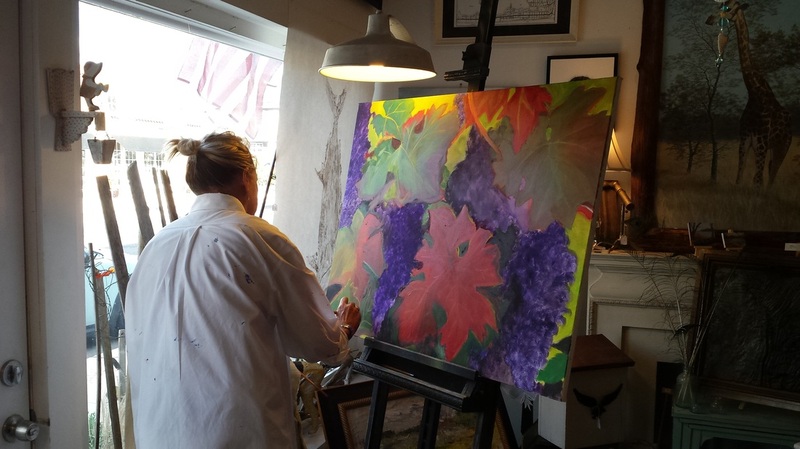 "I attended a ten week painting workshop at ReFind - a store/workshop studio/ community hob in Bay Head. To tell you what made for my great experience I have to first tell you all, what an enchanting place ReFind is. 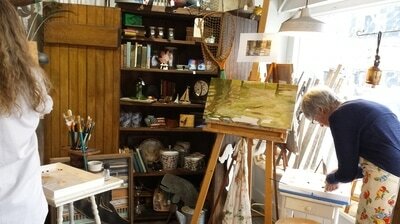 From the outside it appears as an unassuming store front tucked on a side street that you might miss if you didn’t know any better. 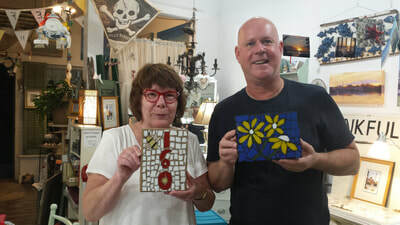 But step through the front door and you will find a treasure trove of art and unique crafts, many made by local artisans, as well as objects both aesthetically pleasing and useful that have been salvaged and lovingly given a second life by Zsa Zsa, the proprietor of ReFind. Every nook and cranny from floor to ceiling is a tableau of beautiful things; jewelry, paintings and unexpected finds. 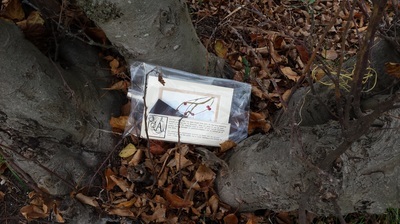 It is like stepping back in time before a culture of shoddy obsolescence became our norm. 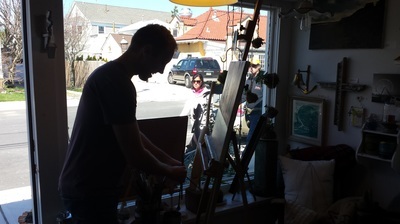 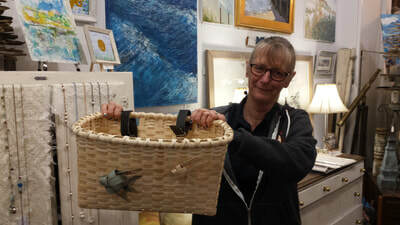 Much like her store Zsa Zsa, the proprietor, is many things – part entrepreneur/artist/ community organizer and from what I saw while I painted there, she is also a source of advise to artists, friends and perhaps even to a stranger like myself who wandered through her door. Even though I had painted years ago I had not used oils and over the years have been mostly involved with digital work. 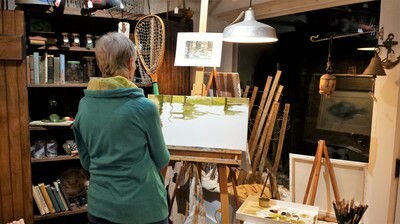 When I walked into ReFind and had spoken to Zsa Zsa I felt that painting in her studio would be an opportunity to get back to basics, away from computers. It turned out to be just what I needed and with Zsa Zsa’s help I managed to enjoy this new medium and create some art that for a beginner with oils was not too shabby. 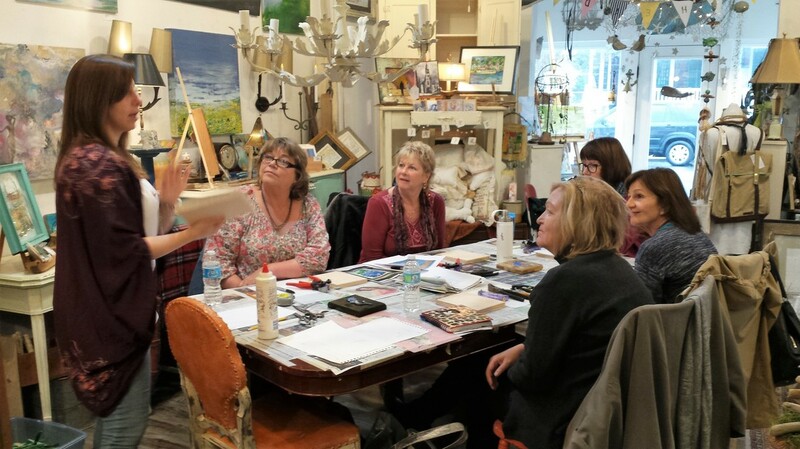 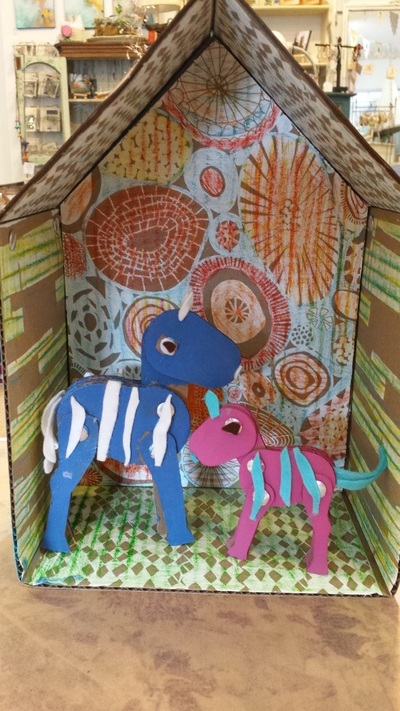 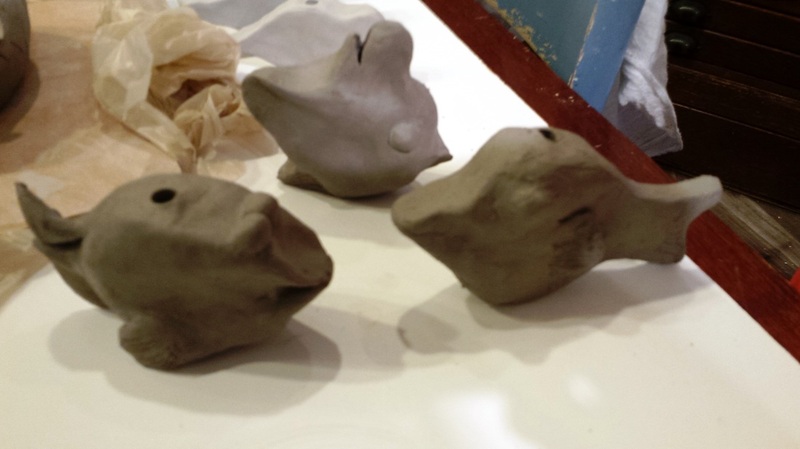 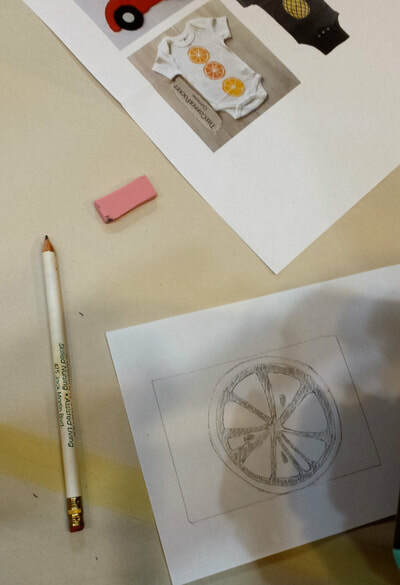 ReFind is a meeting place for learning and exchanging artistic ideas. 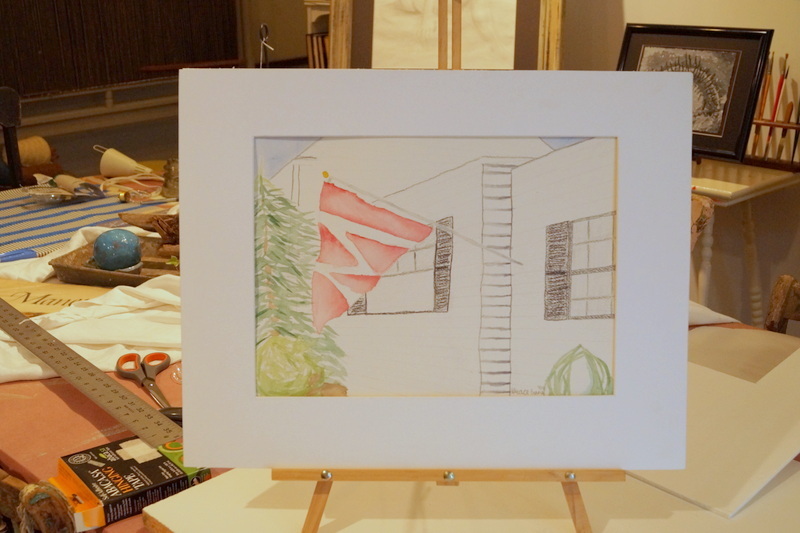 The goal is to provide an environment conducive to the creative process. 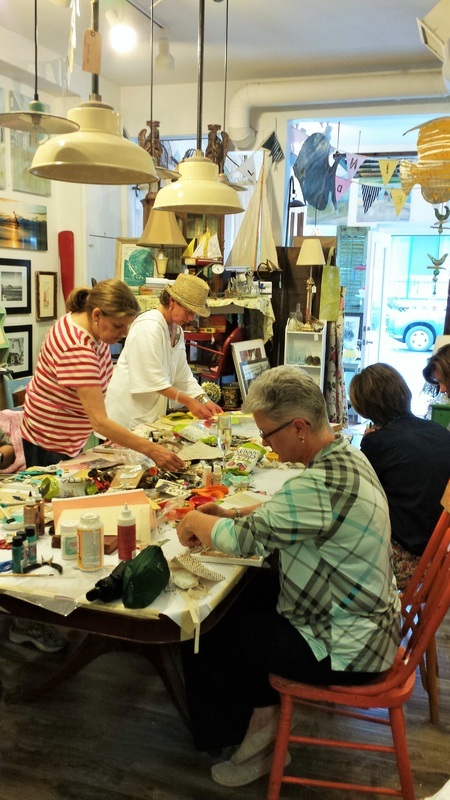 One does not have to be an “artist” to join others at ReFind. 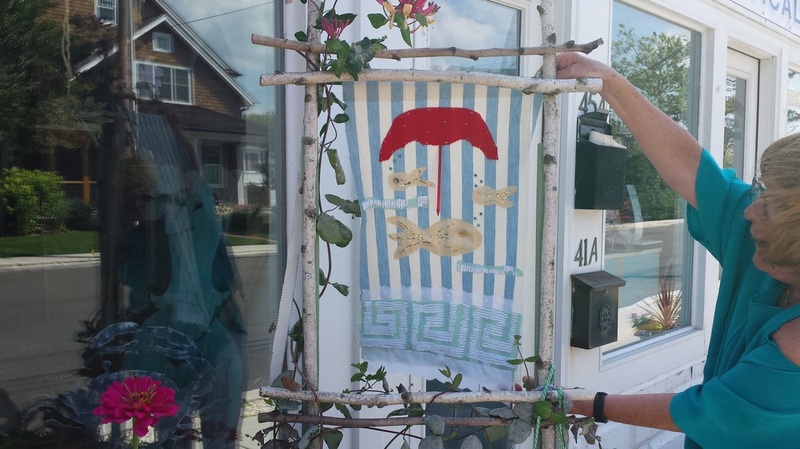 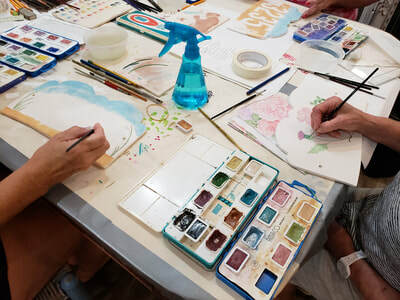 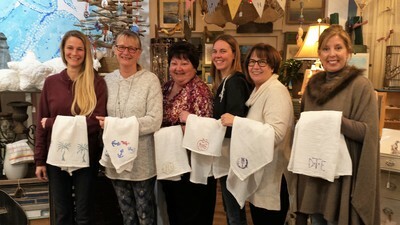 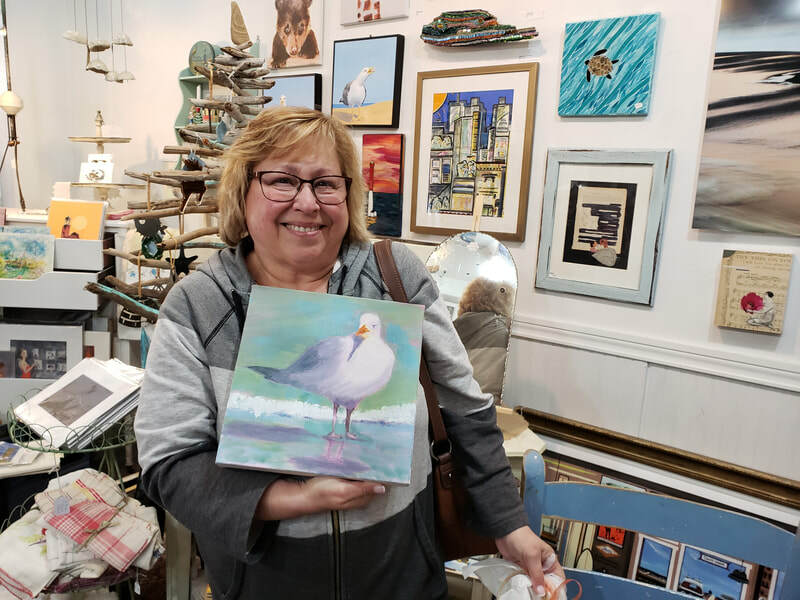 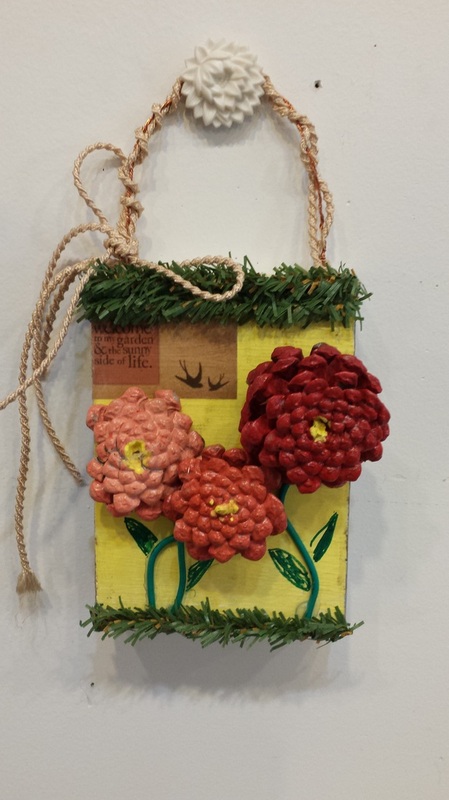 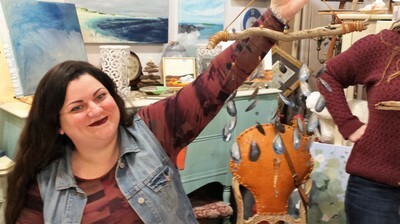 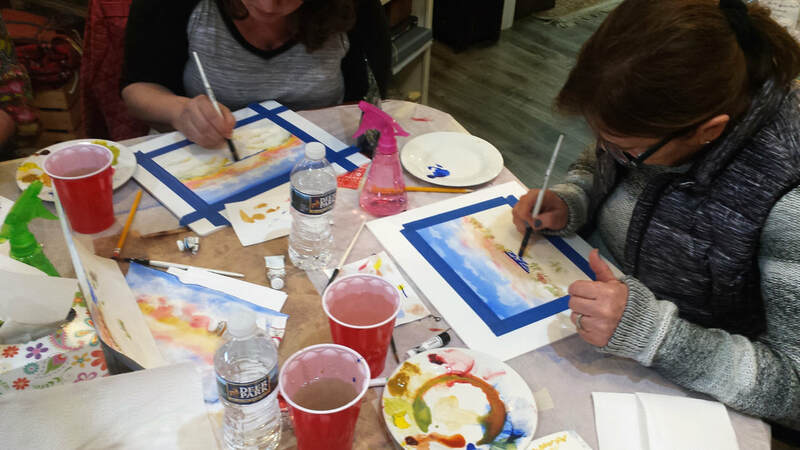 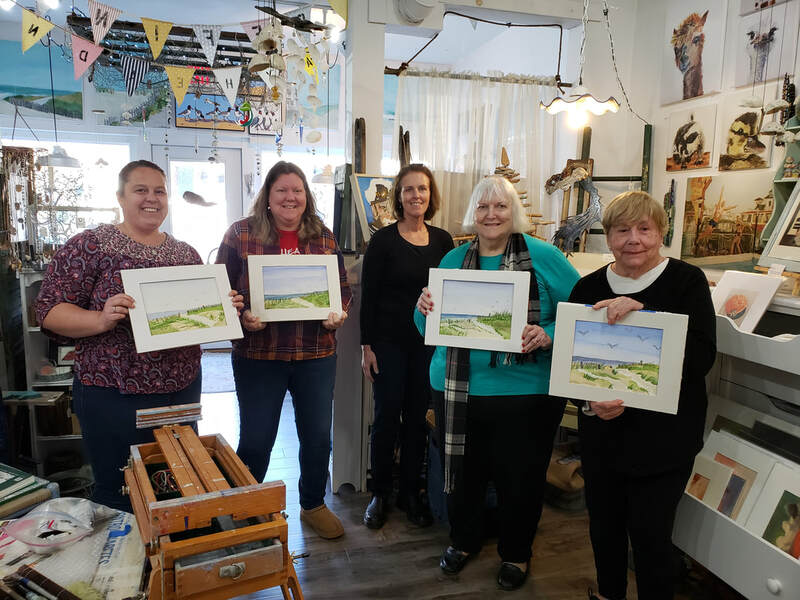 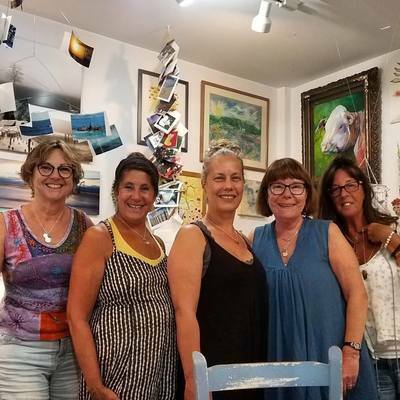 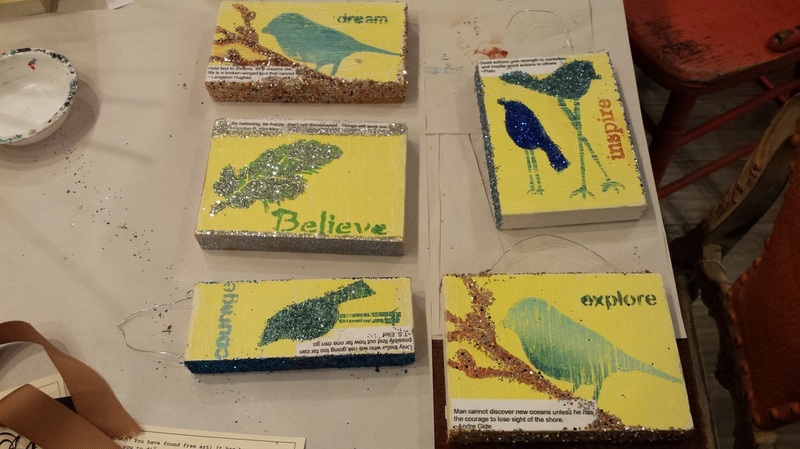 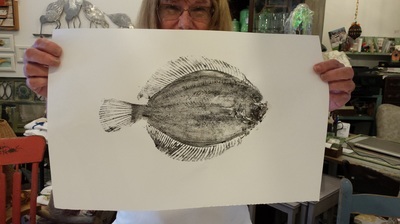 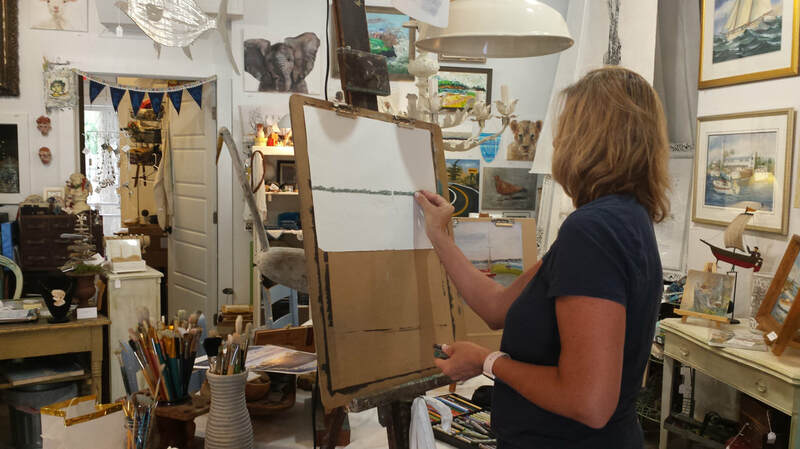 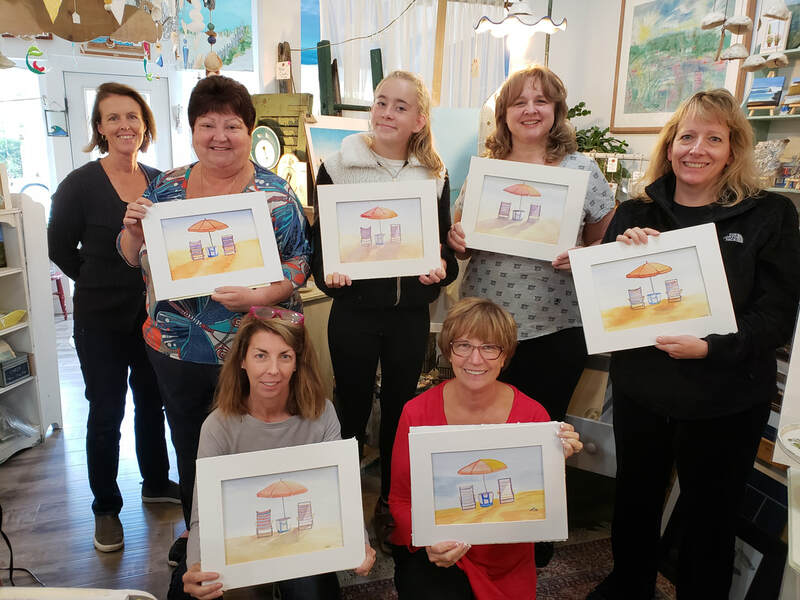 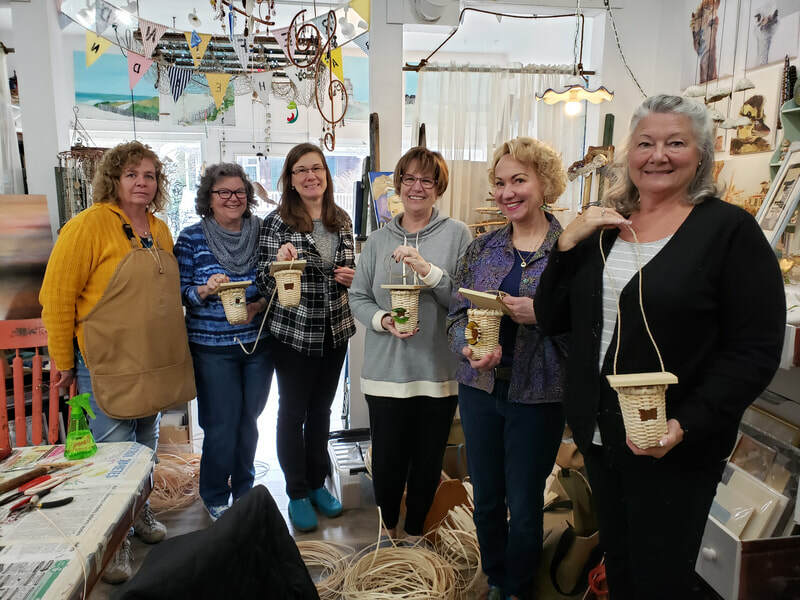 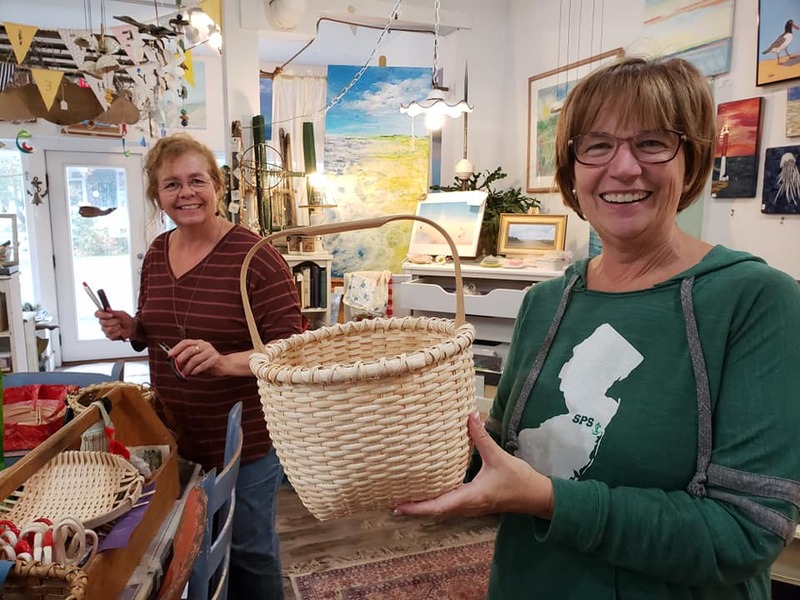 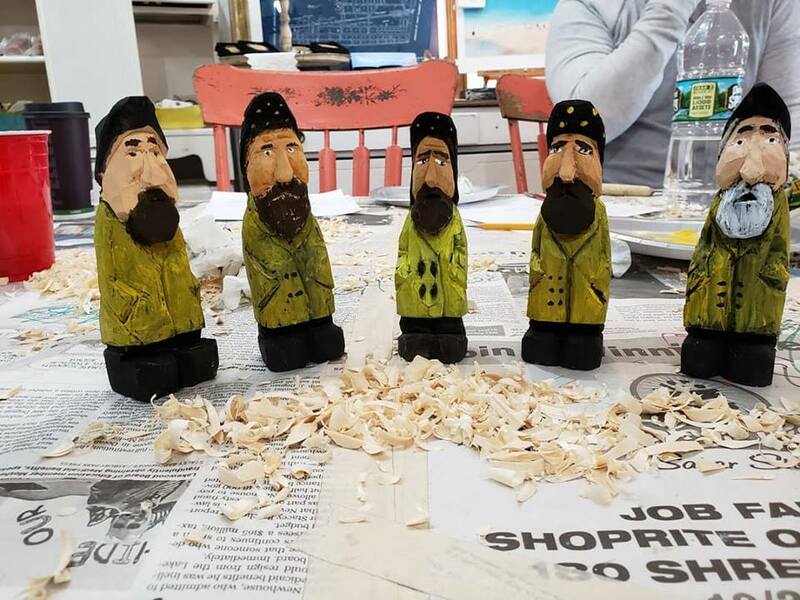 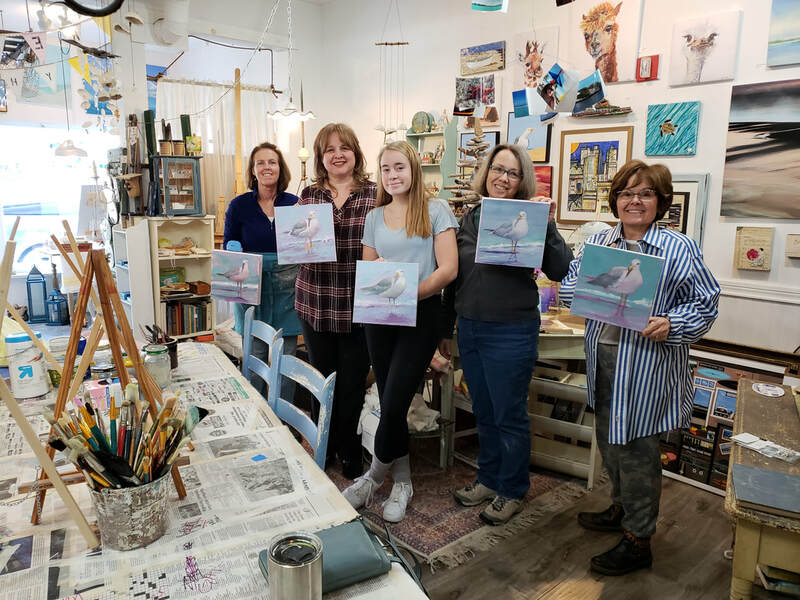 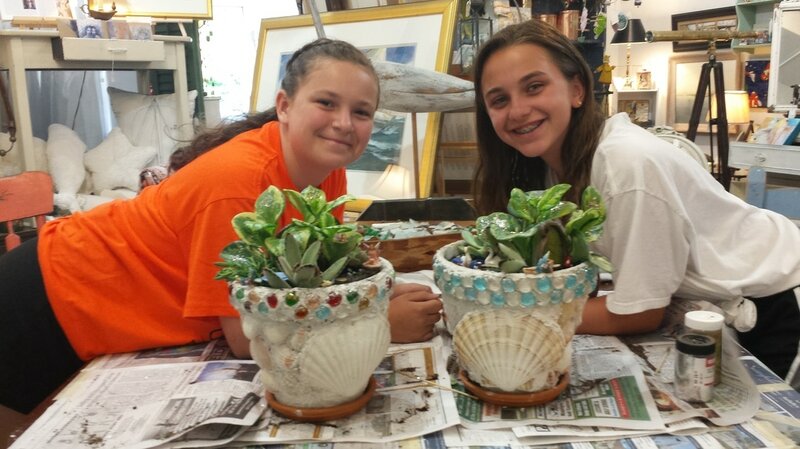 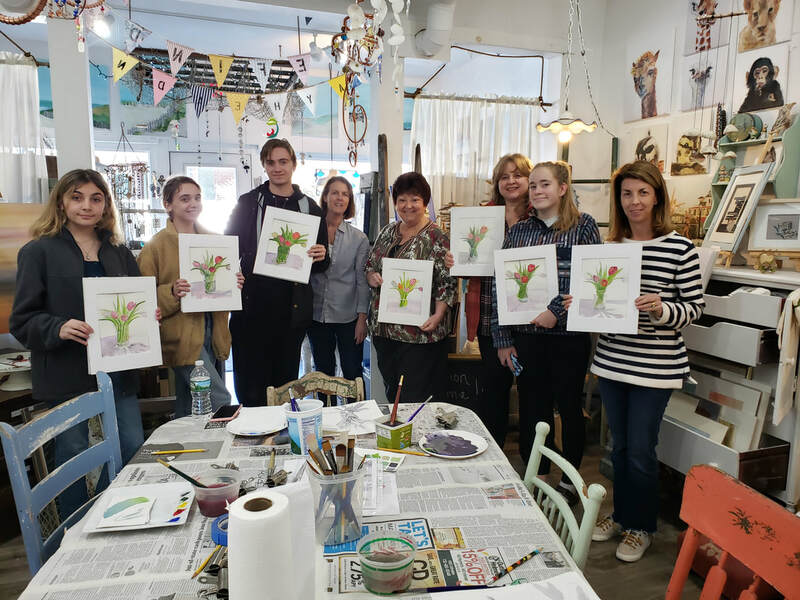 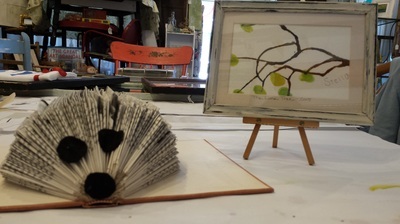 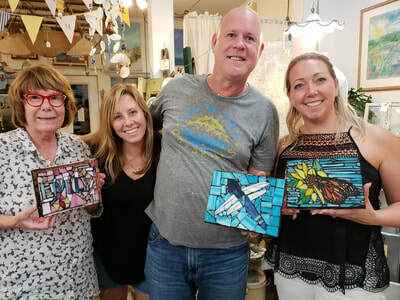 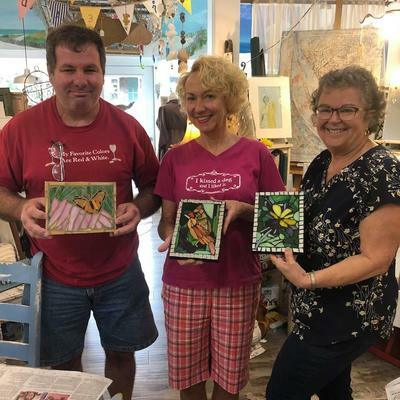 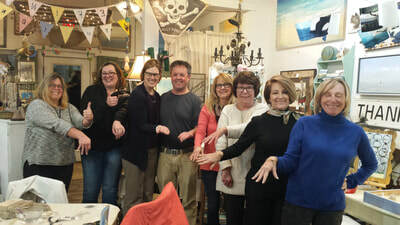 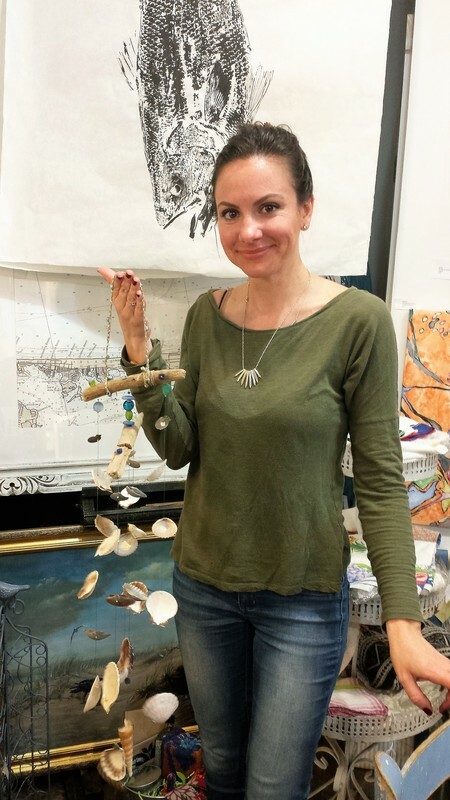 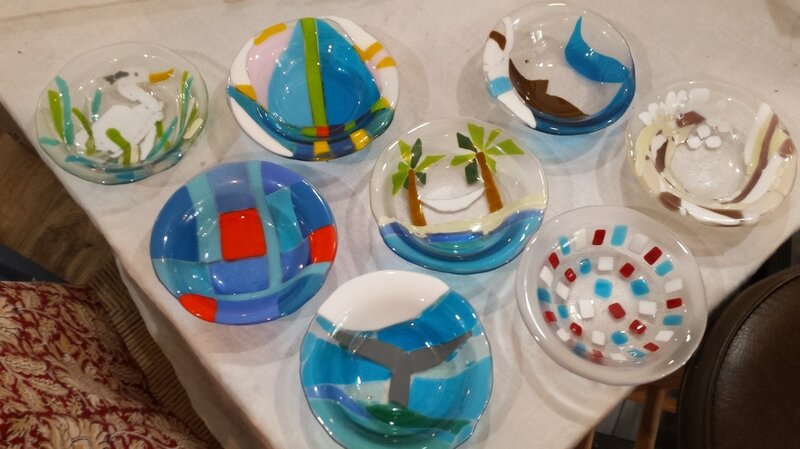 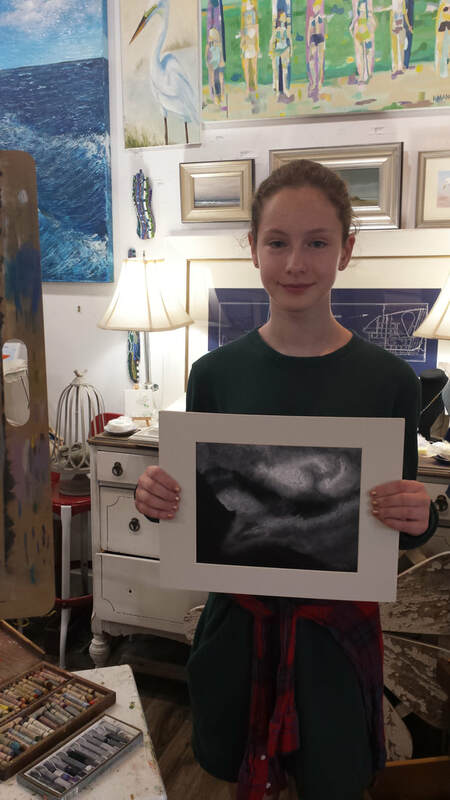 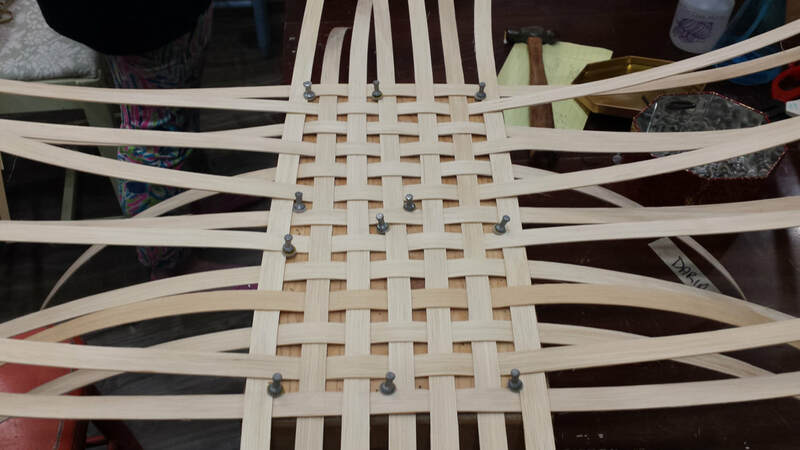 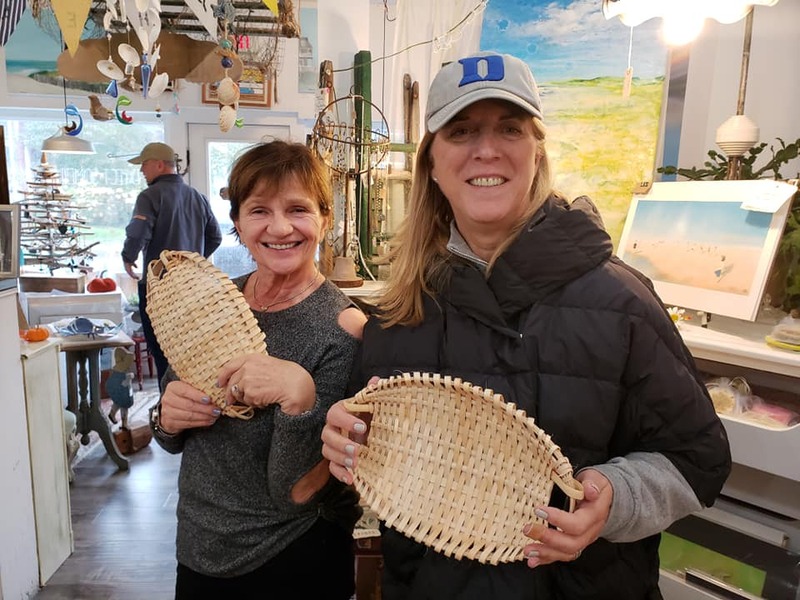 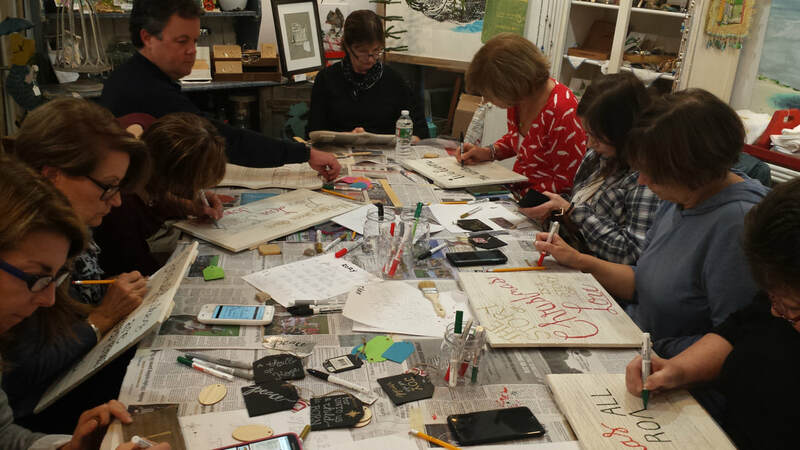 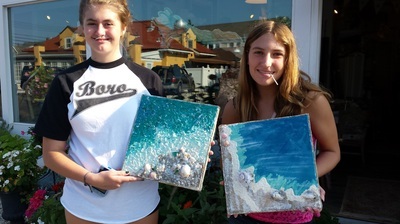 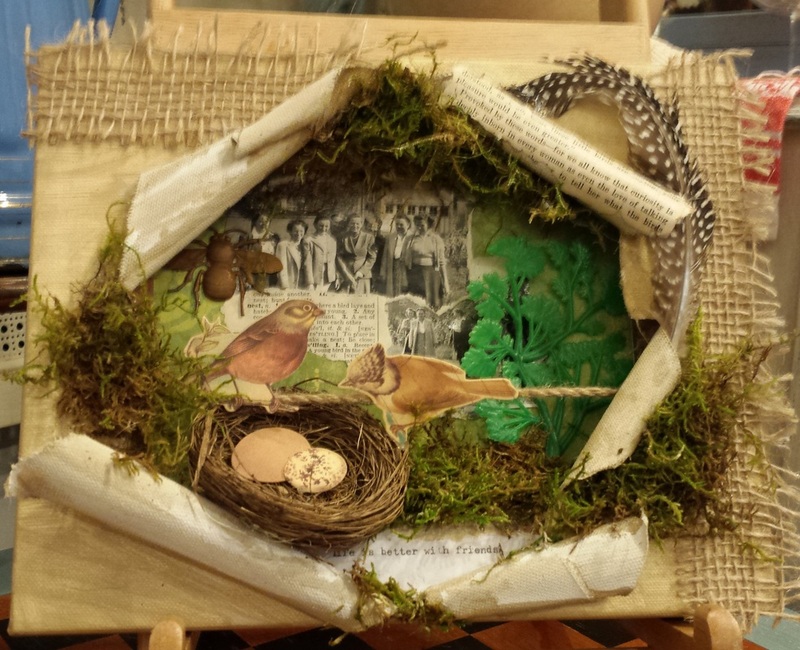 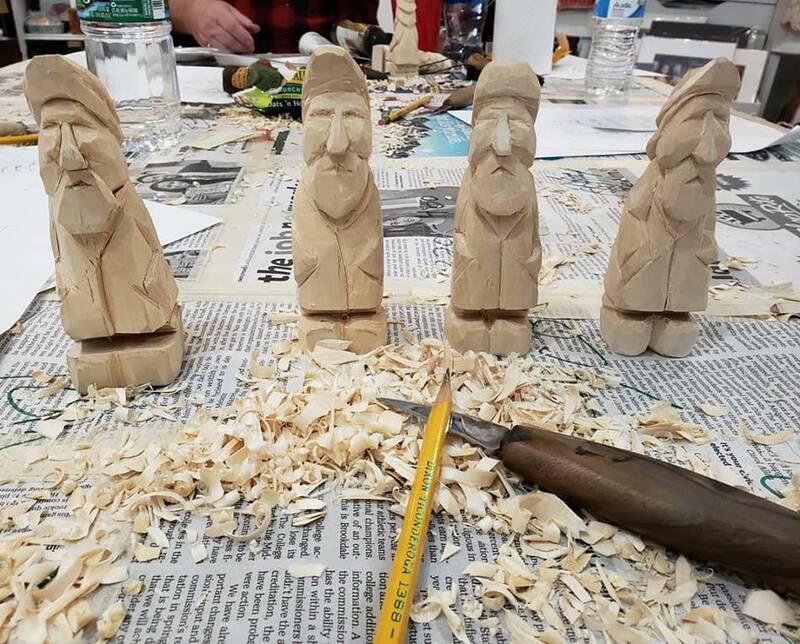 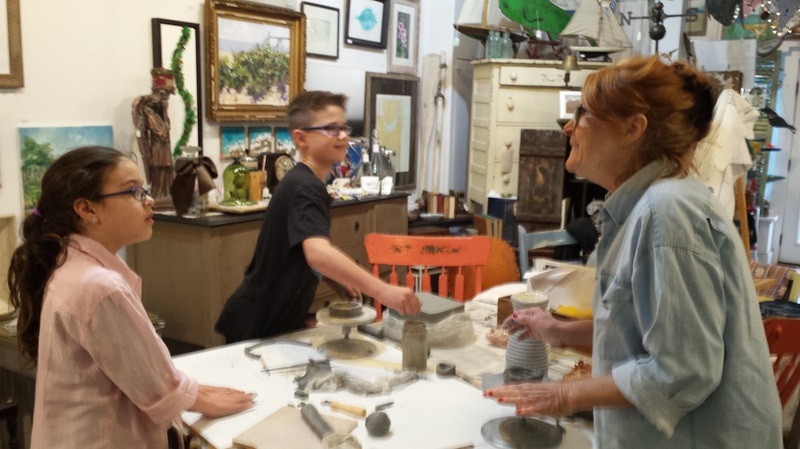 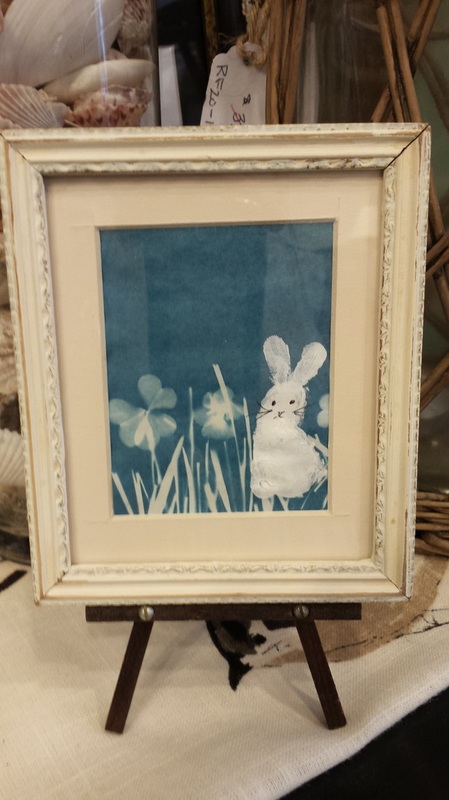 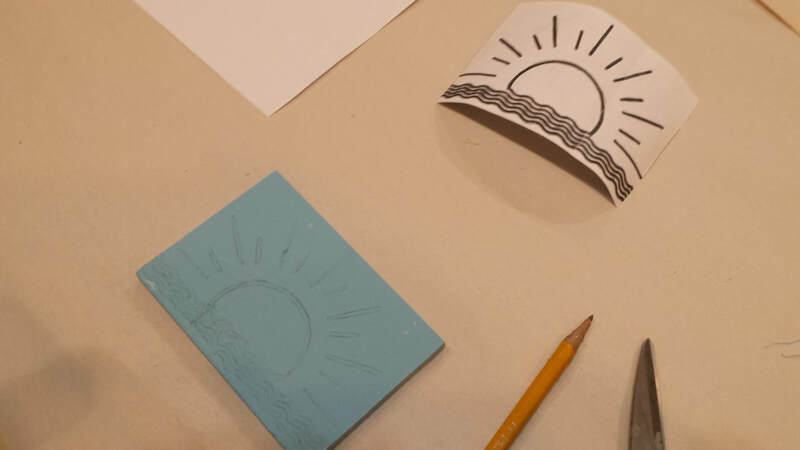 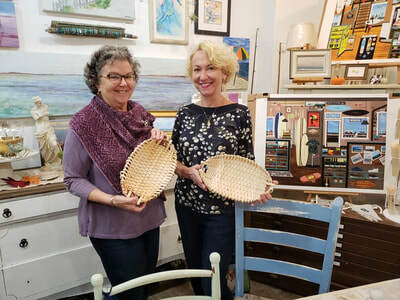 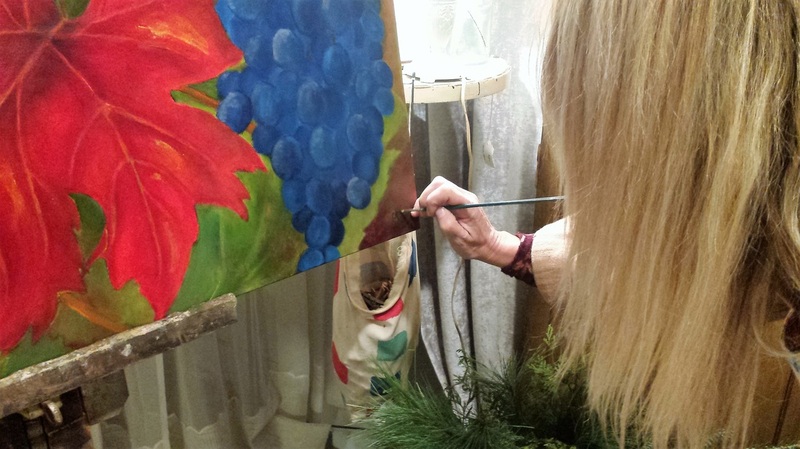 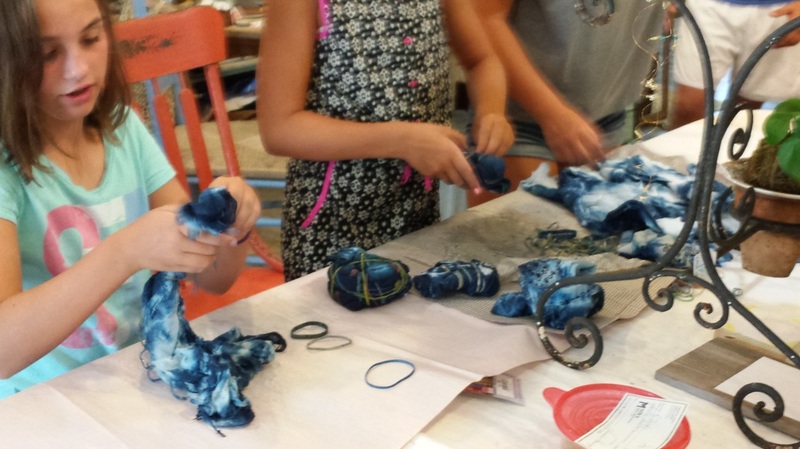 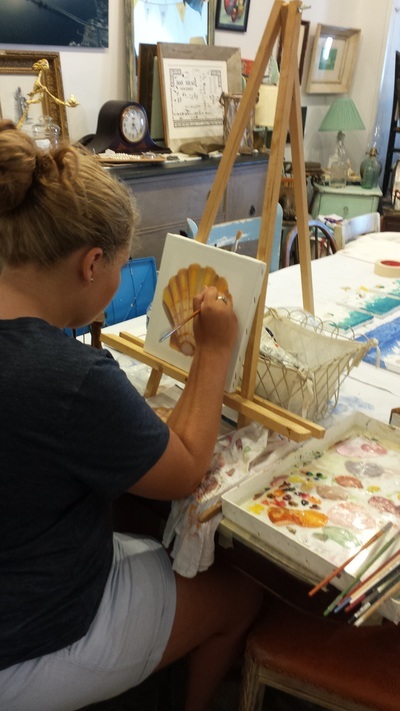 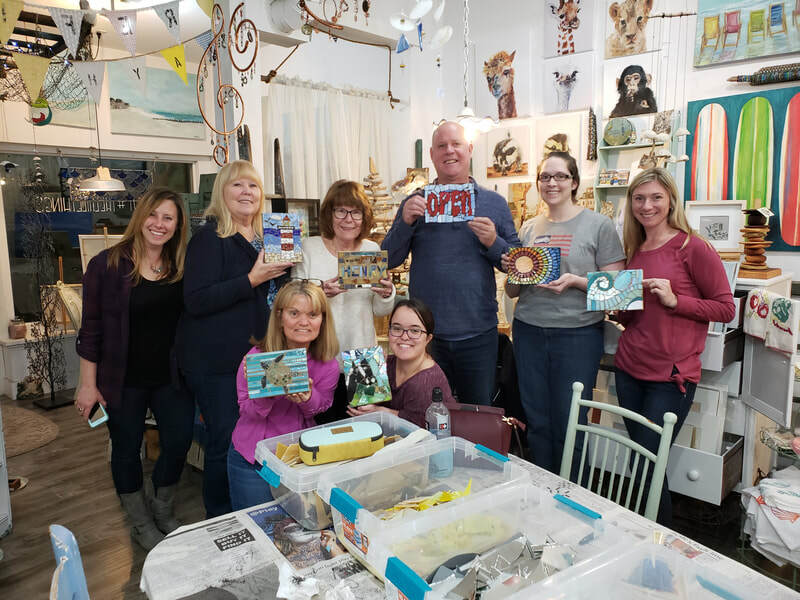 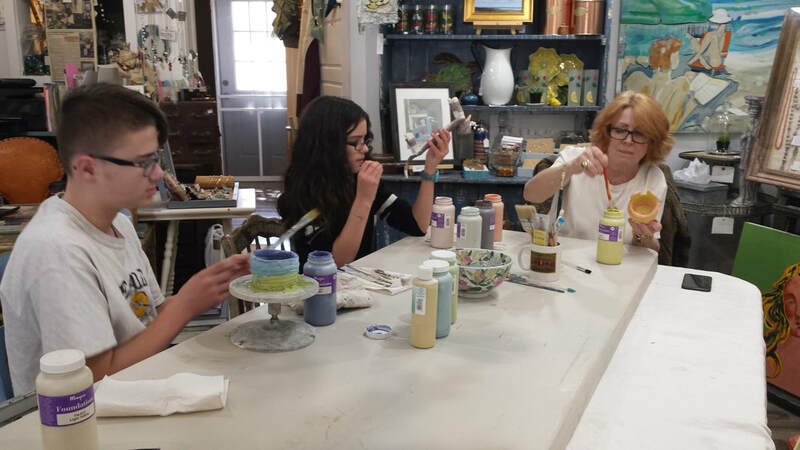 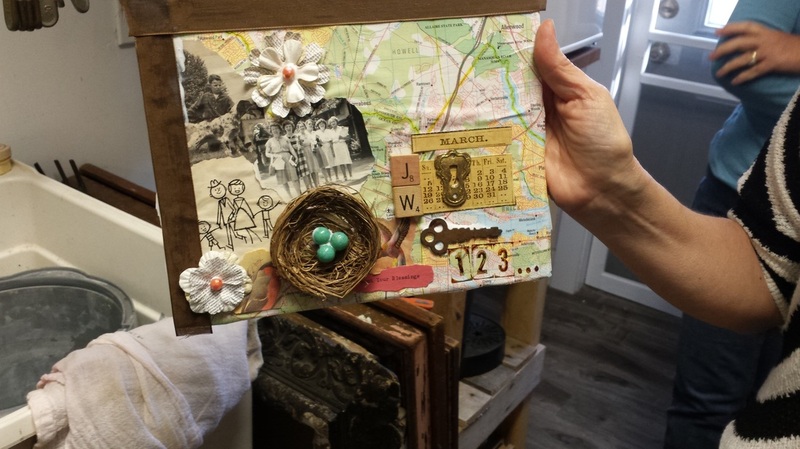 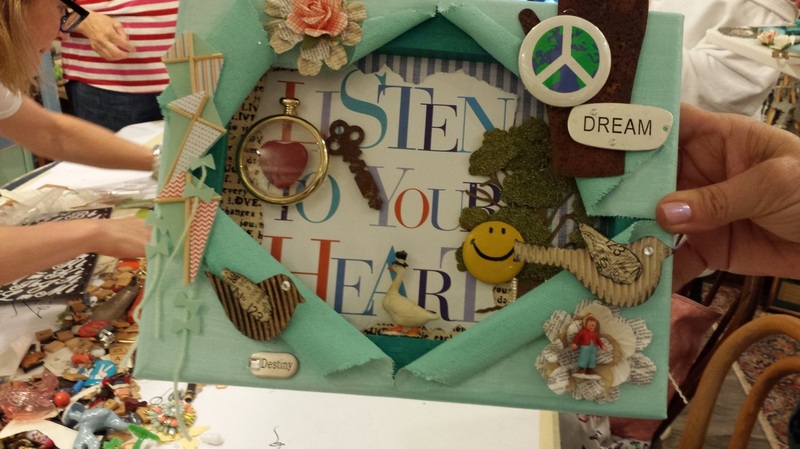 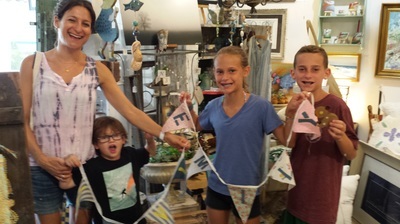 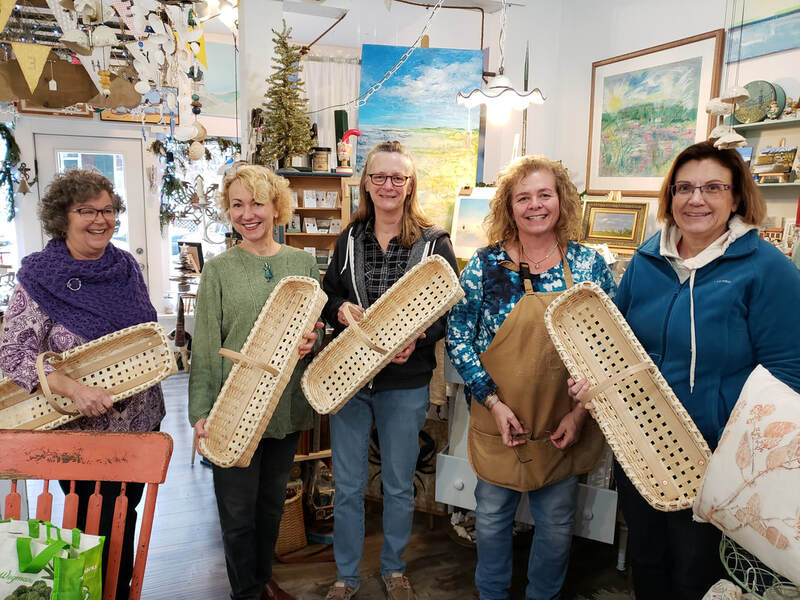 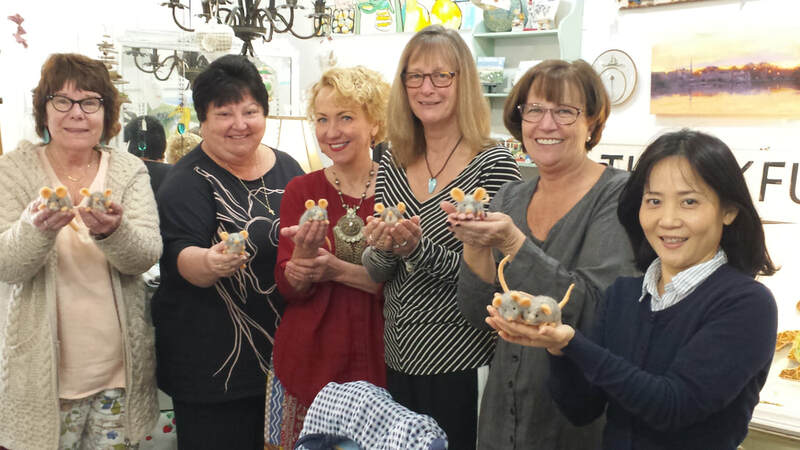 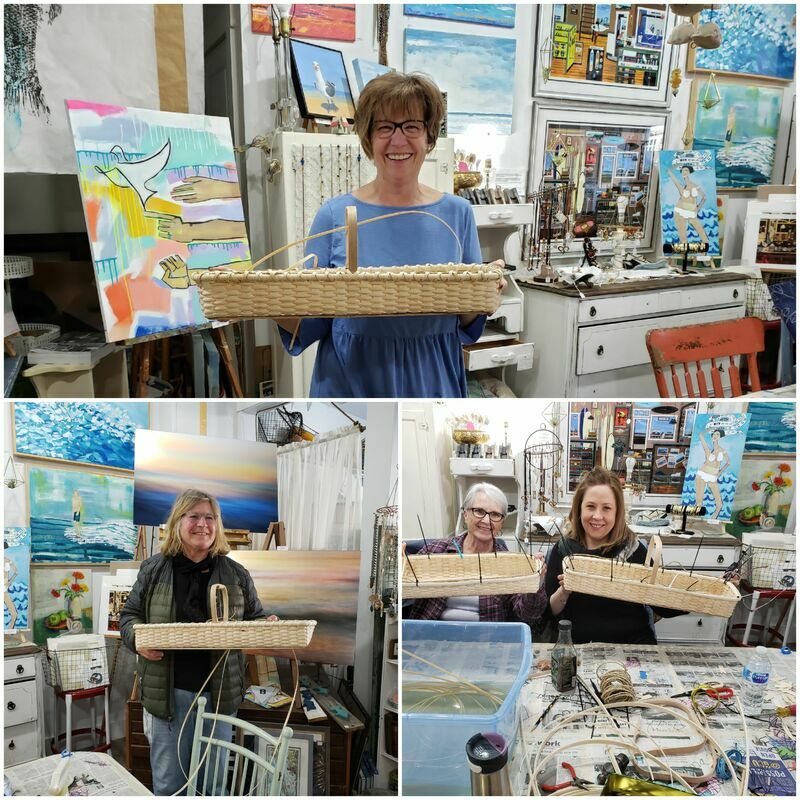 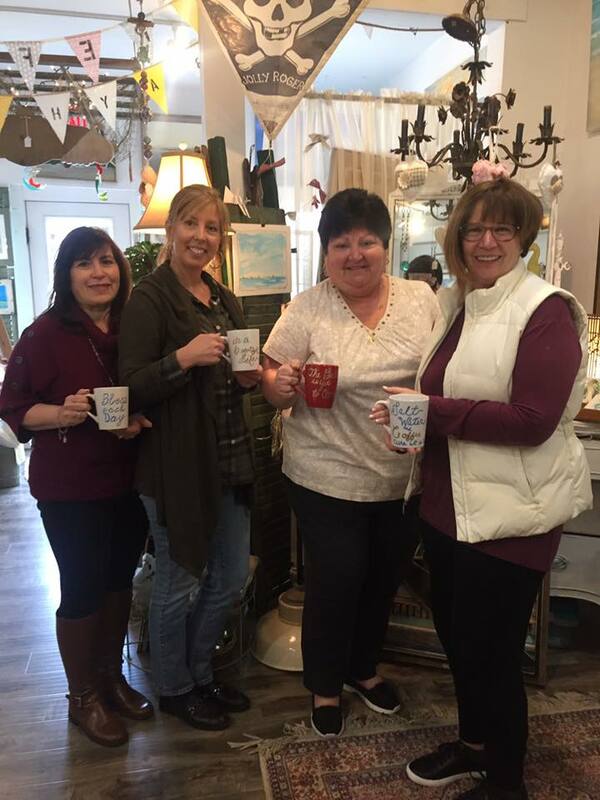 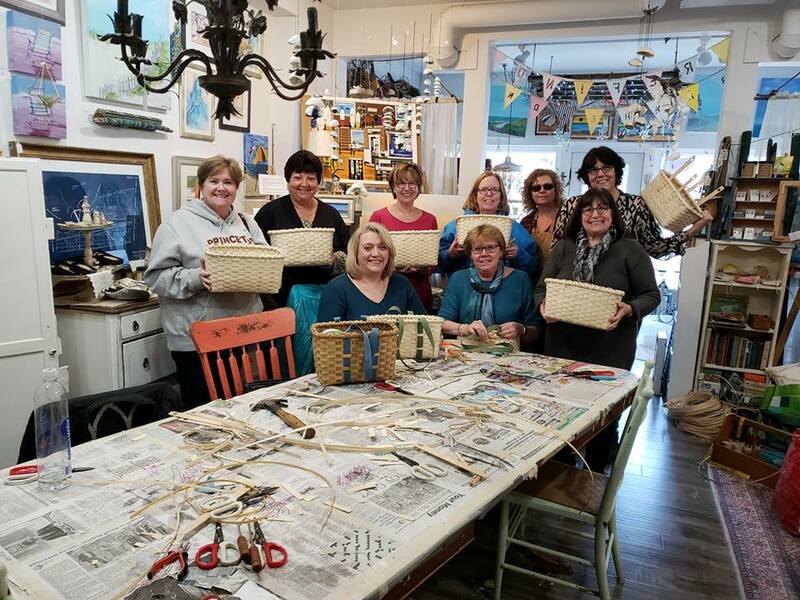 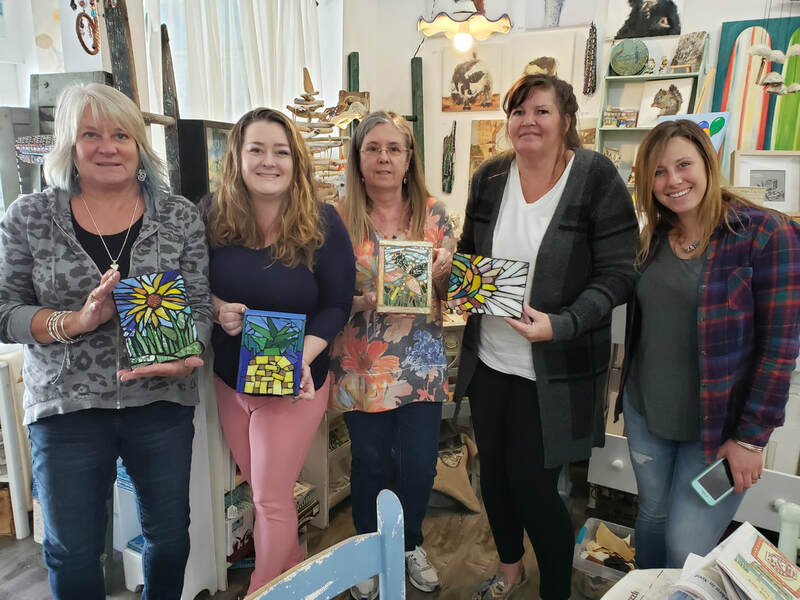 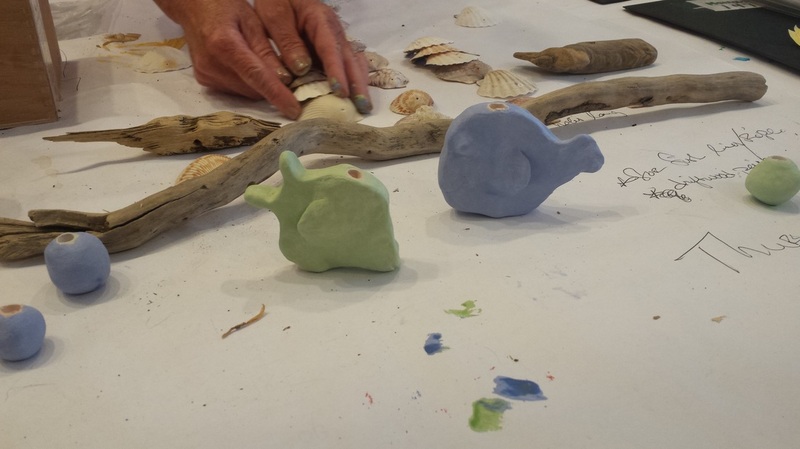 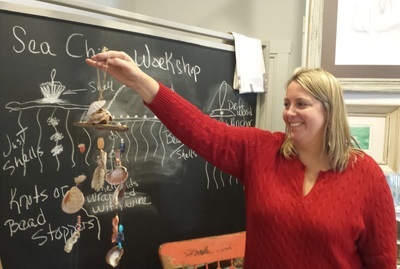 Owner/Instructor Zsa Zsa Stackles, a NJ certified K-12 Art teacher/artist, believes that art is an important expression of the human spirit, that creativity is an innate function, and that in a supportive and inspiring atmosphere it is bound to flourish. 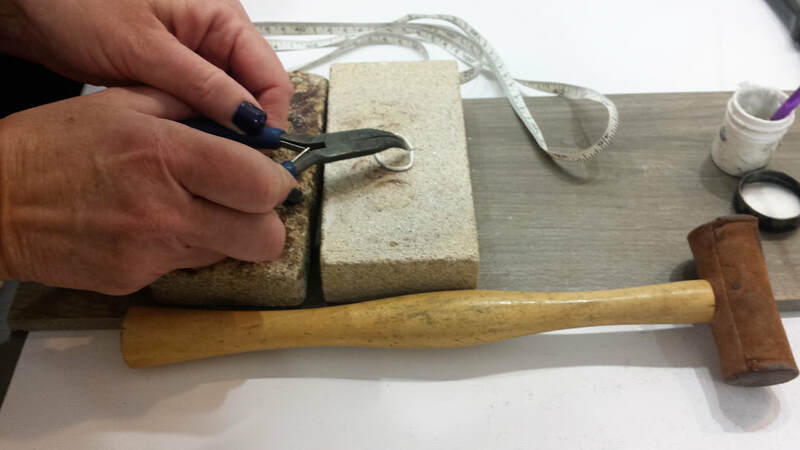 Zsa Zsa also possesses full knowledge and practices the art of safety of materials and tools. Any tasks requiring chemically related tasks, (finishing/varnishing, etc.) 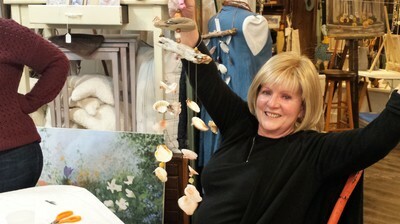 will be performed by her after hours/outside the studio space, to ensure the safety and well being of all. 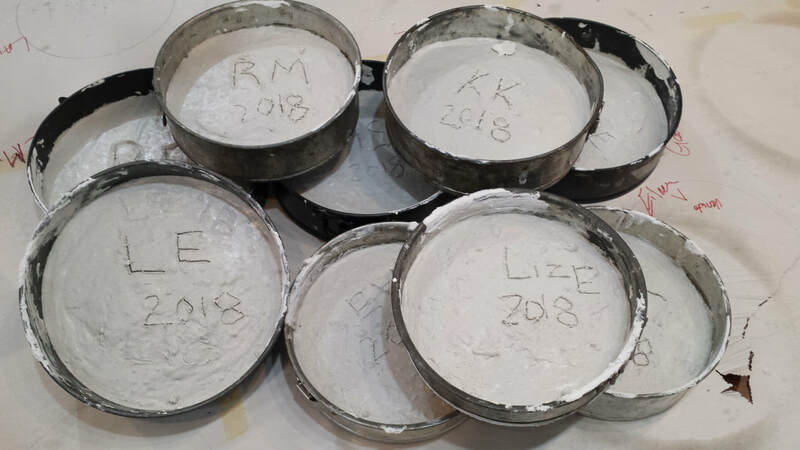 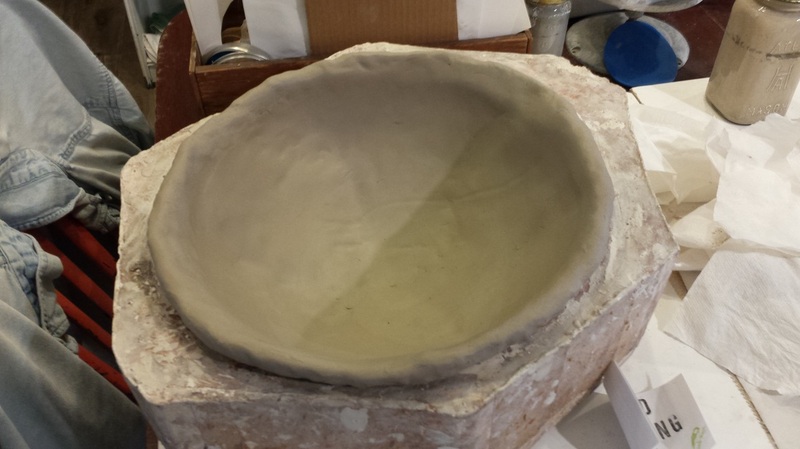 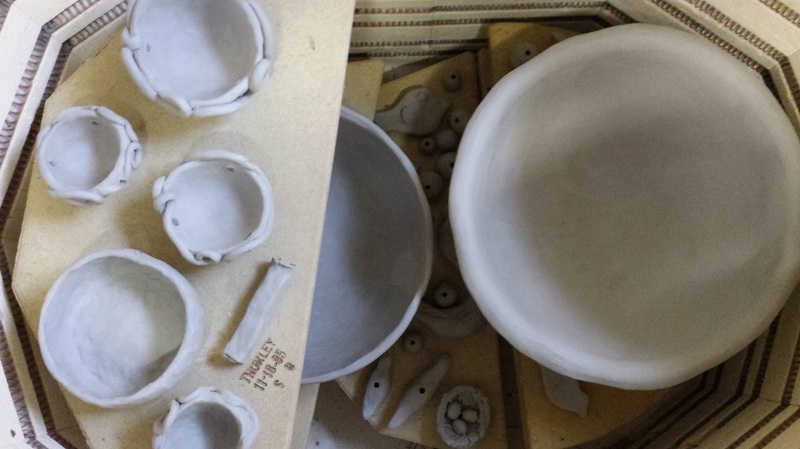 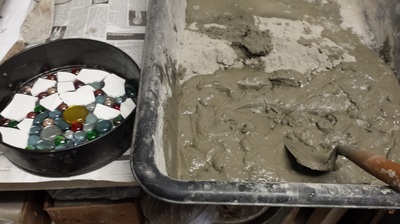 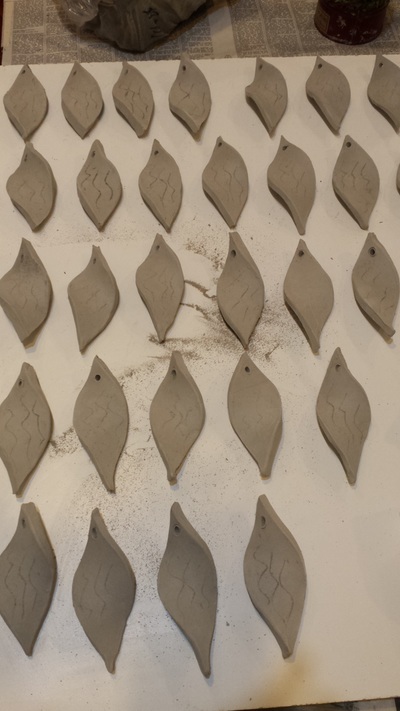 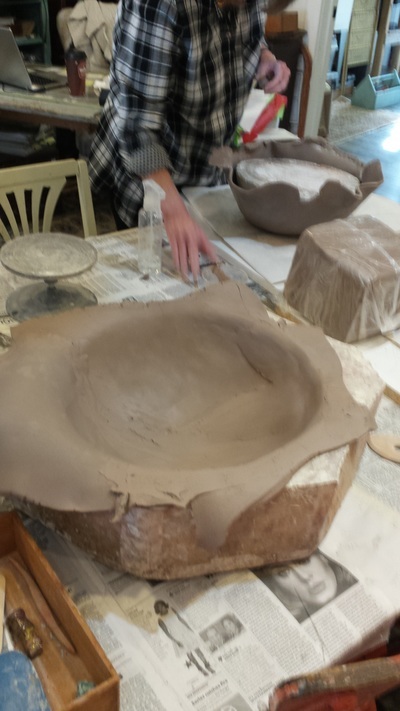 Firing of green ware/glazed creations are performed outside of studio, as Zsa Zsa has a kiln at home. 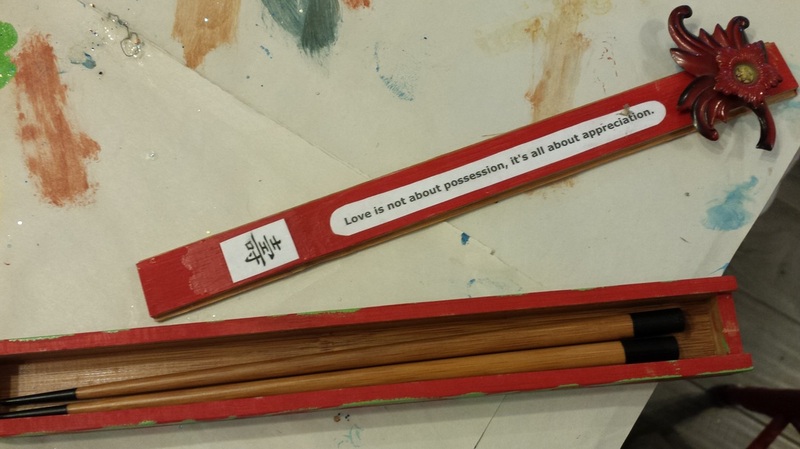 Please take note... Impromptu workshops are welcome!!! 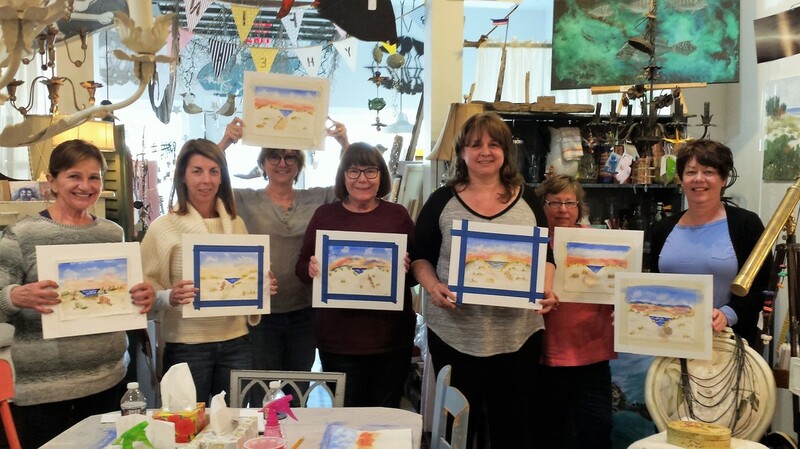 If there is something that you and your friends would like to do, simply let me know and I will do my best to make it happen! 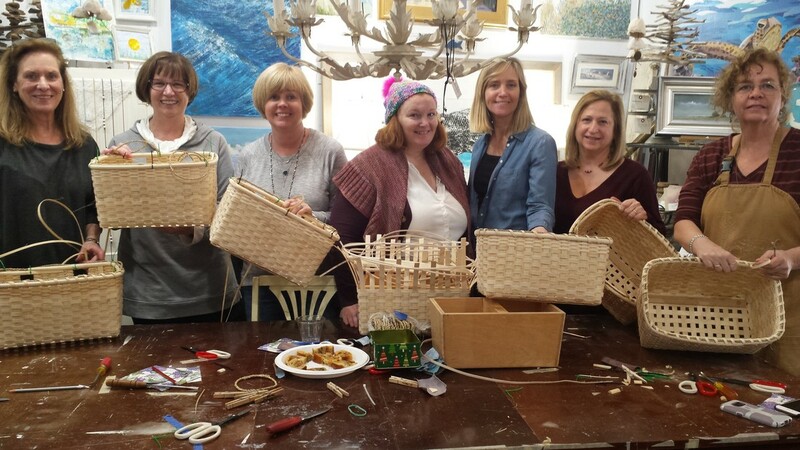 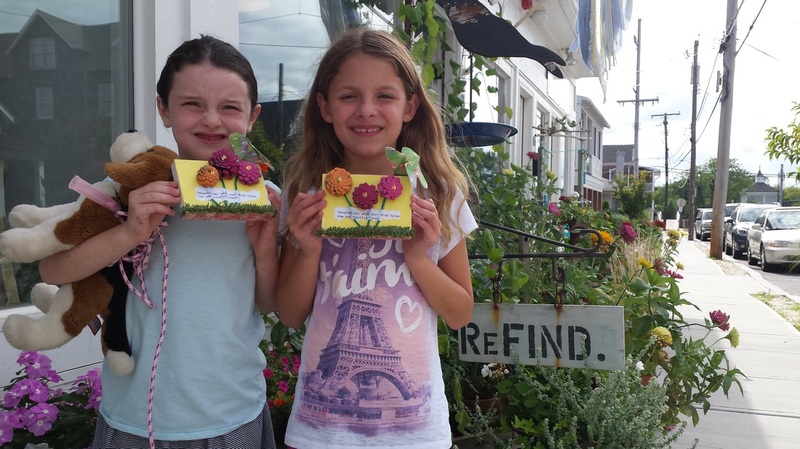 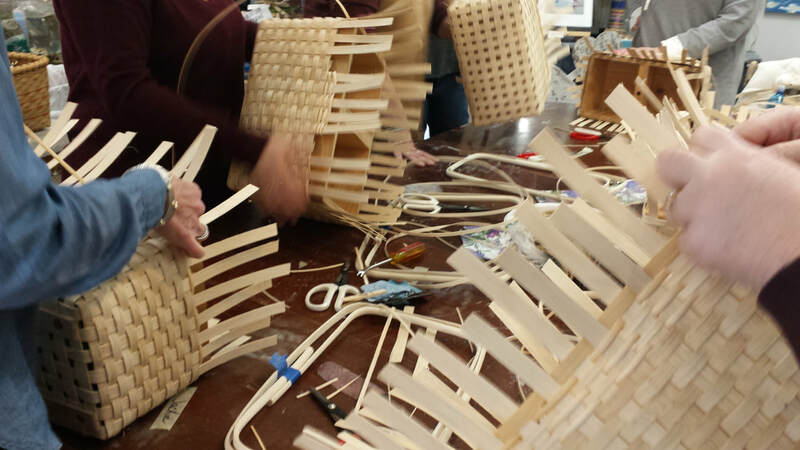 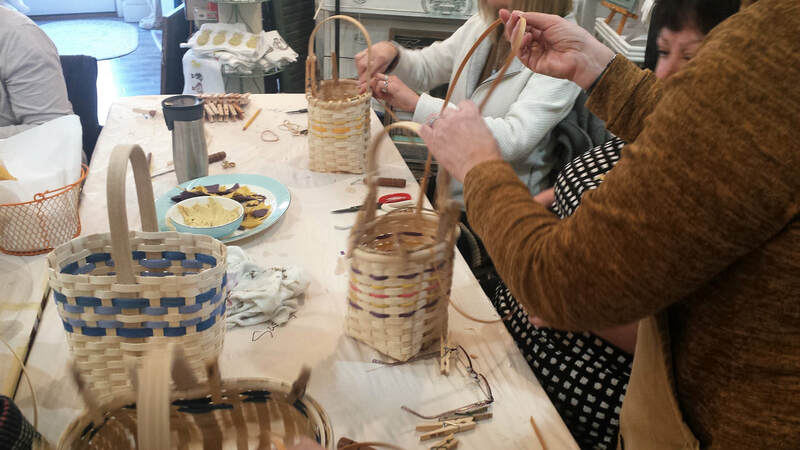 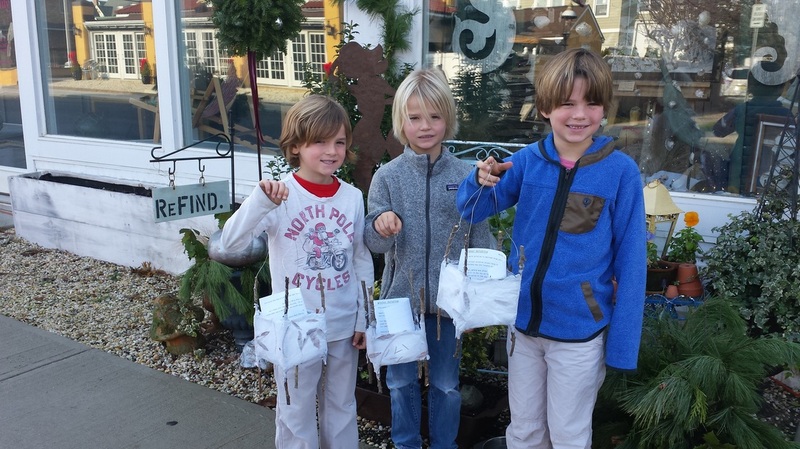 Learn the lost art of macramé during this fun new workshop at ReFind! 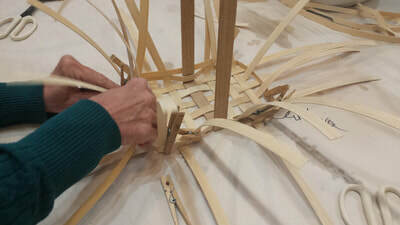 You will be guided from beginning to end so no experience is necessary. 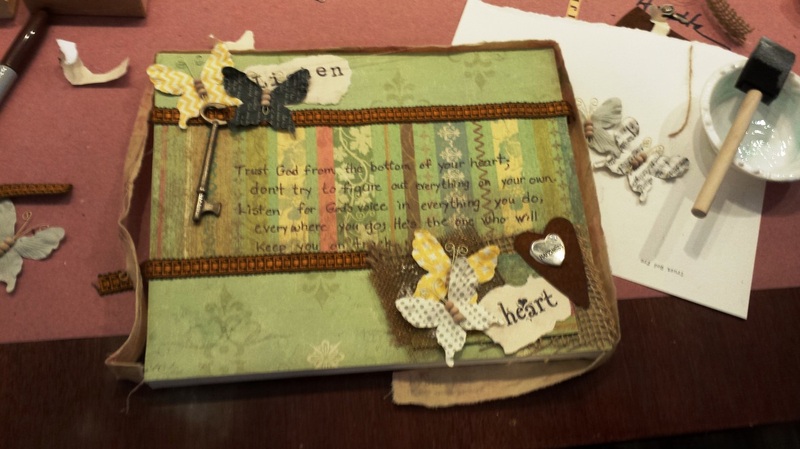 You will also be provided with a visual "how-to" handout to refer to as well. 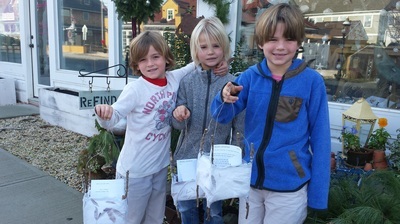 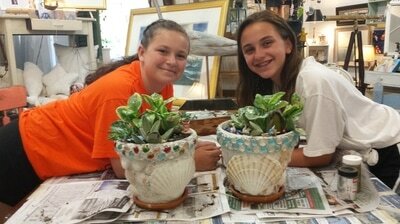 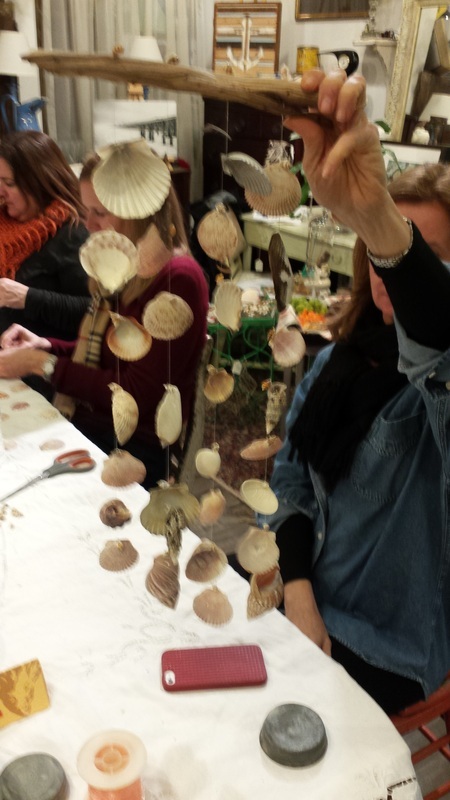 Each artist will also receive a live plant to complete your macrame hanger. 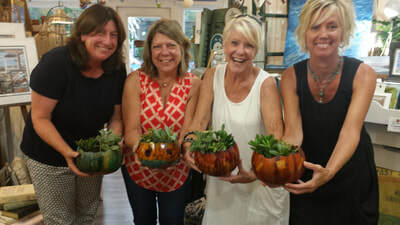 Since flower pots are very personal selections for your home decor, please feel free to bring your own 6-8 inch container/saucer if desired. 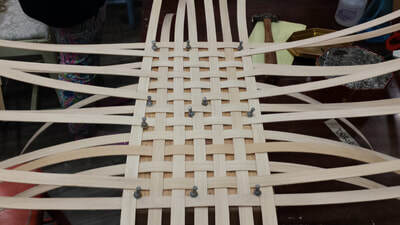 And wear comfy shoes as a lot of this project is done standing. Chairs will be available for taking a rest when needed. 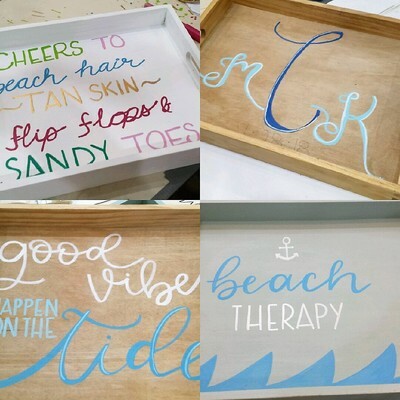 $30 non refundable deposit required. 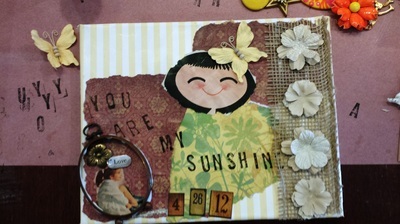 Mail to ReFind or drop off. 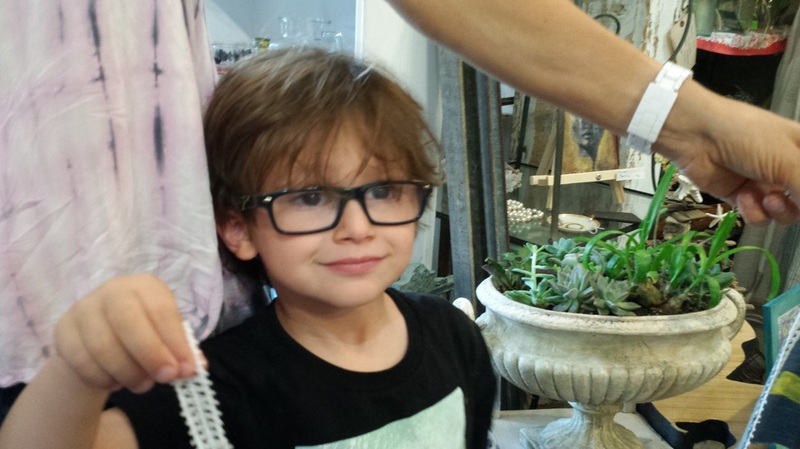 Cash/Check please. 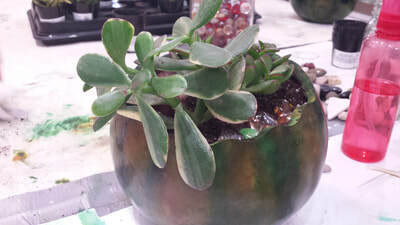 All materials included/plant supplied/container is your responsibility. 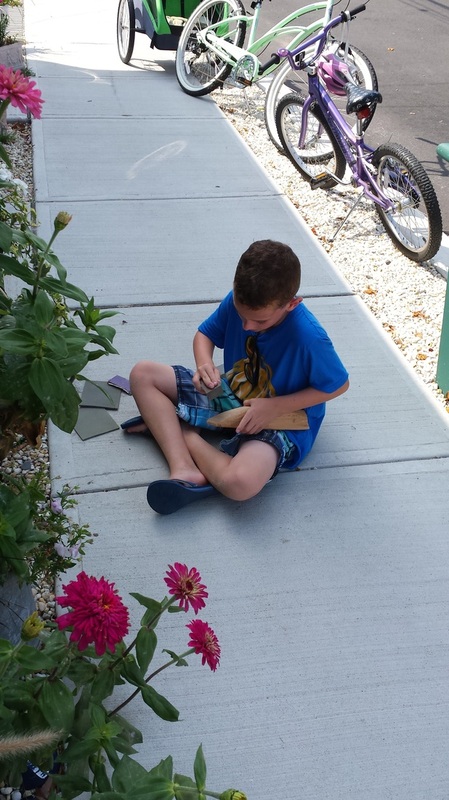 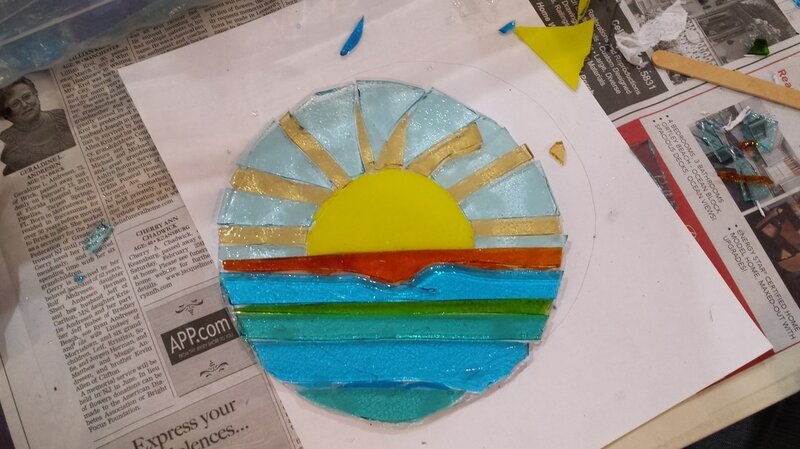 Create your own 4x6 fused glass suncatcher! 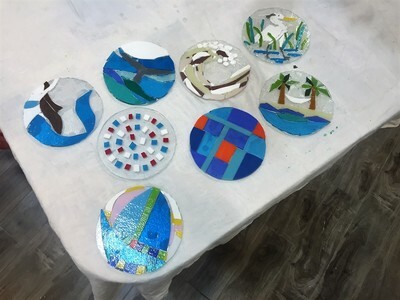 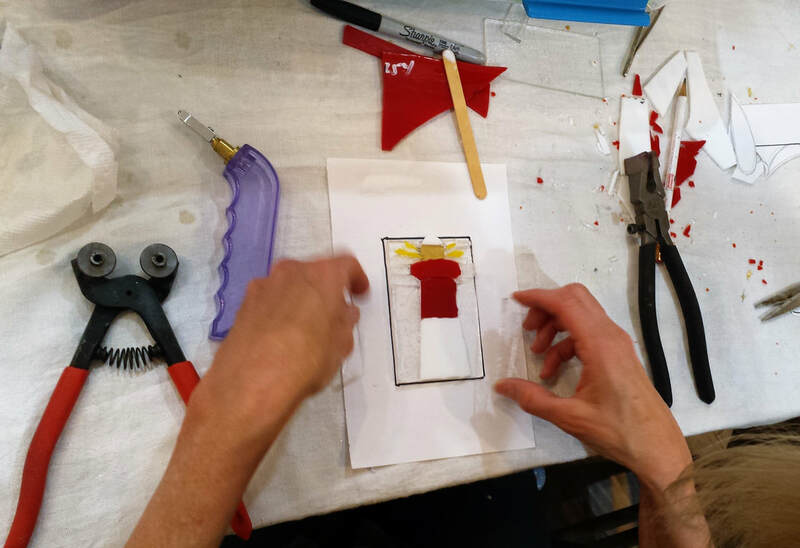 While mastering the art of glass cutting with safety first, you will learn out to layout your own design and fill it in with colored glass! 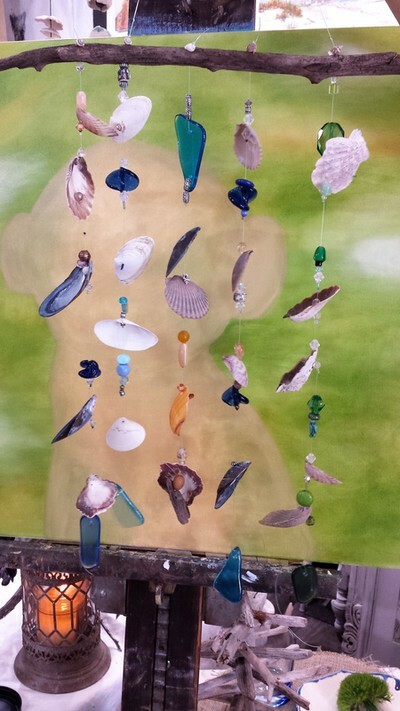 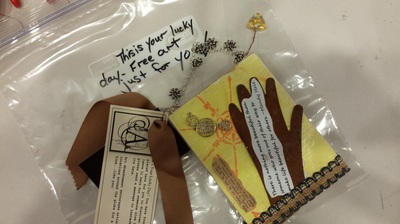 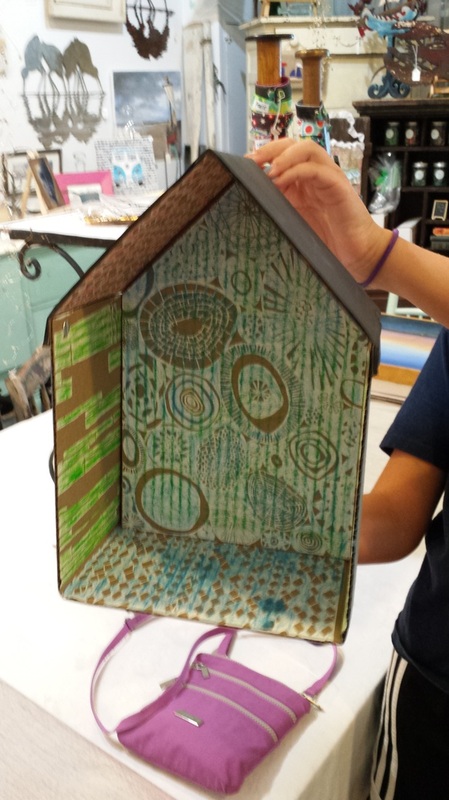 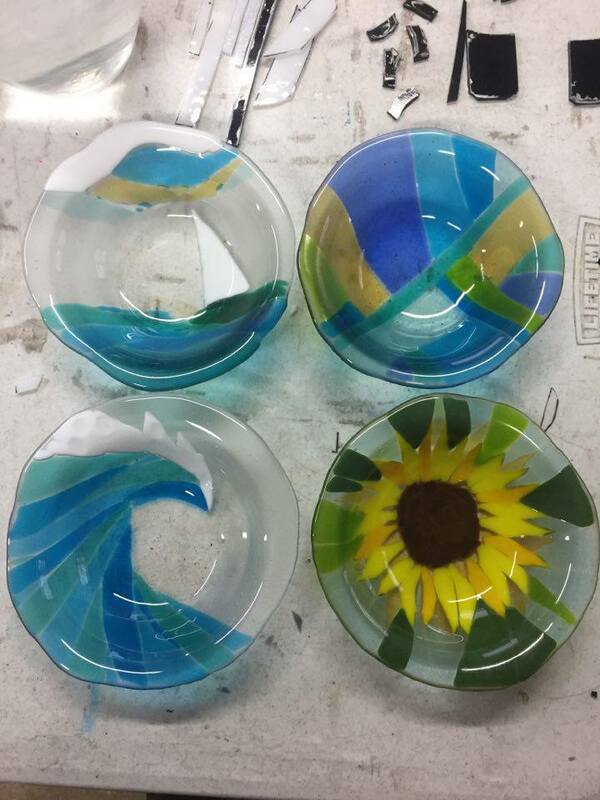 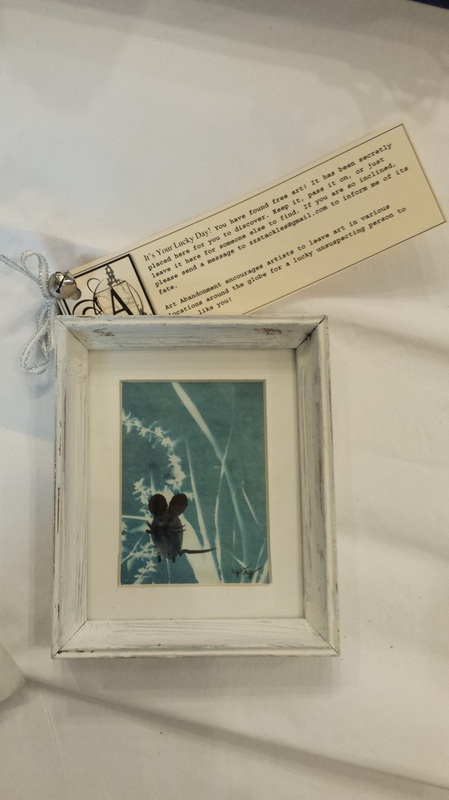 Once completed, your suncatcher is fired out of the studio and returned for you to pick up ready to hang! No experience necessary...All you need is an inspirational image or design. Tracing is okay if drawing is not your thing!! 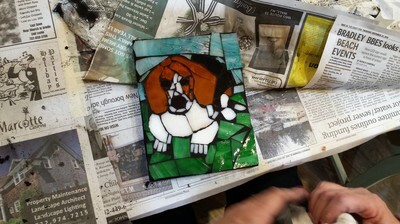 $58 per artist/$25 dollar non-refundable deposit is required to hold your glass cutters. 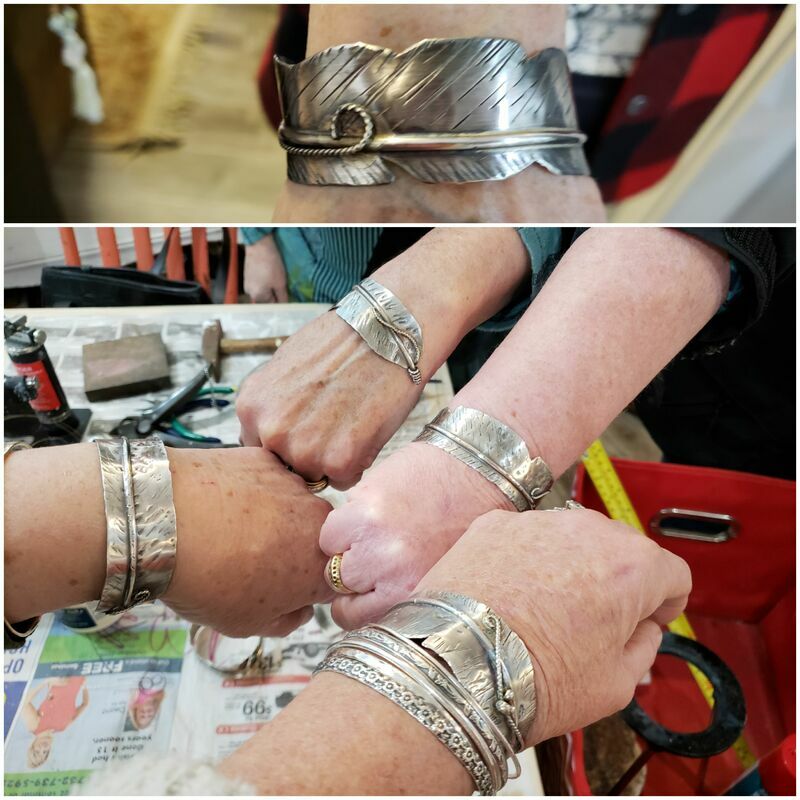 Create your own timeless sterling silver feather cuff. 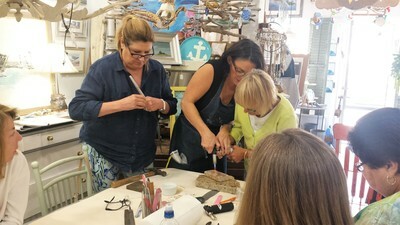 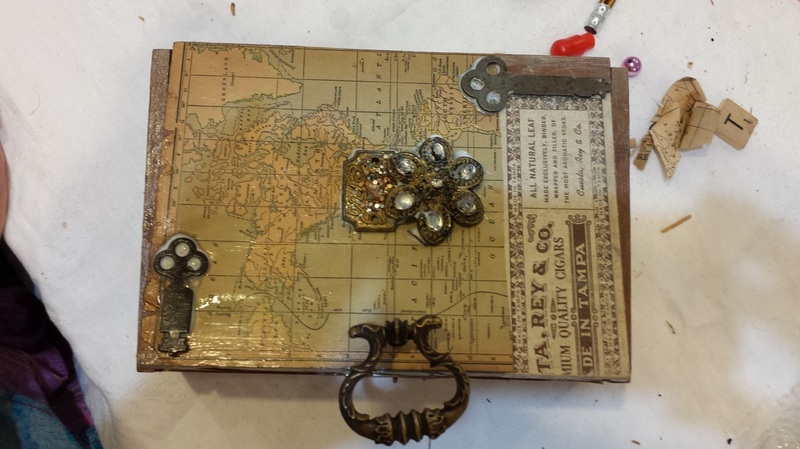 This class focuses on the art of design, working with hammering and hand carving and stamping for a truly custom look. With all materials provided, you will be guided through the processes of torch soldering, stamping, various aspects of cutting, polishing, and oxidation to create a cuff as unique as you are. Roping and accent embellishments will further personalize each cuff to make it truly your own. 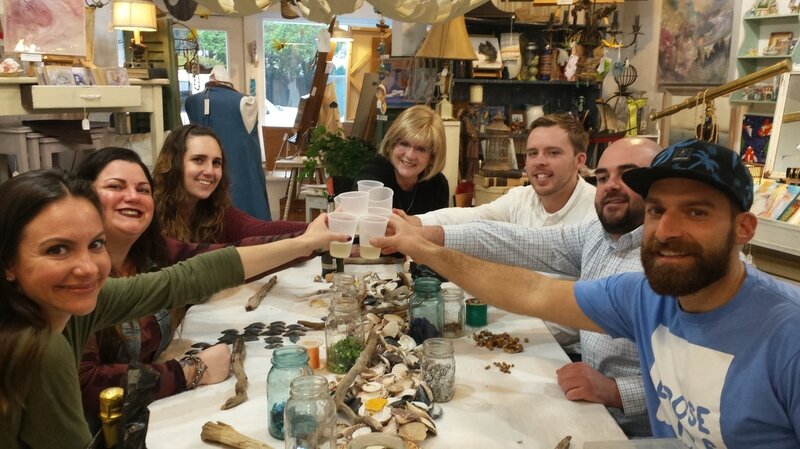 $60 (non-refundable) deposit required to hold your seat around the table. 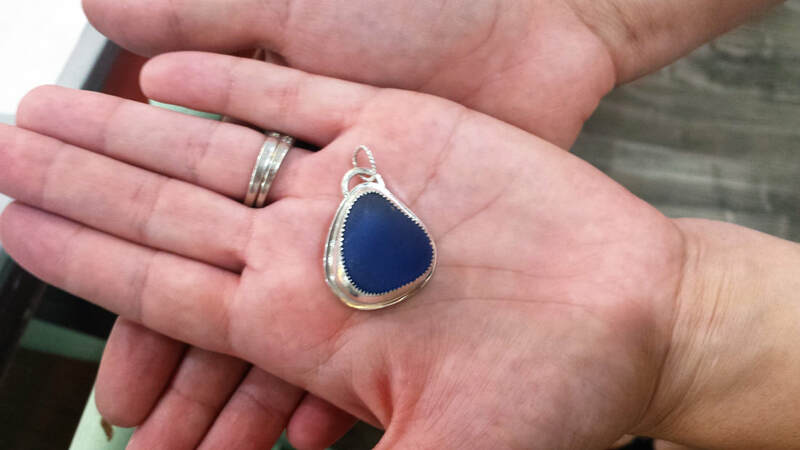 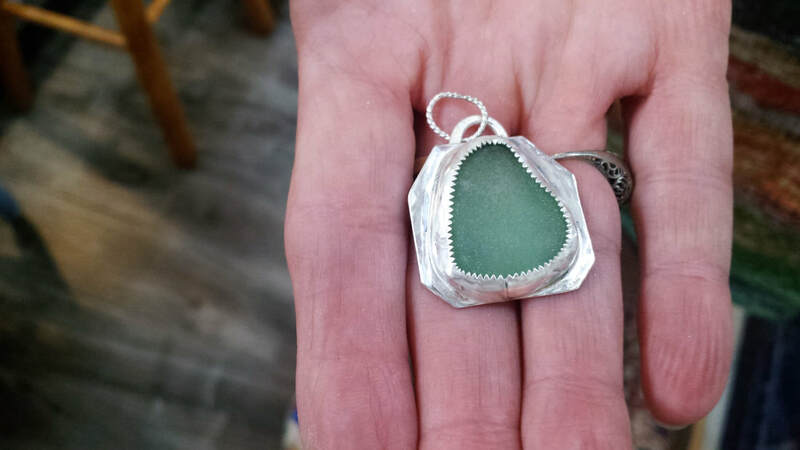 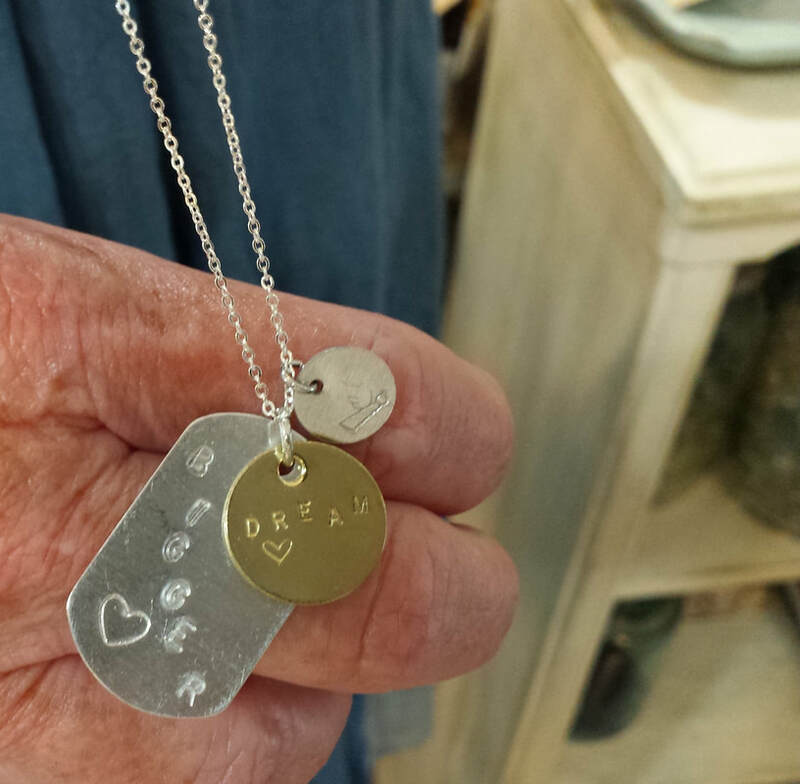 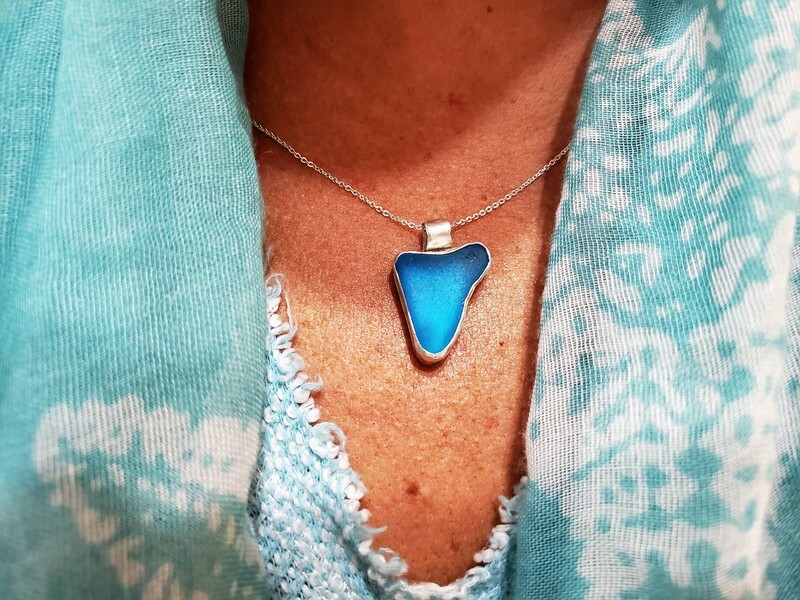 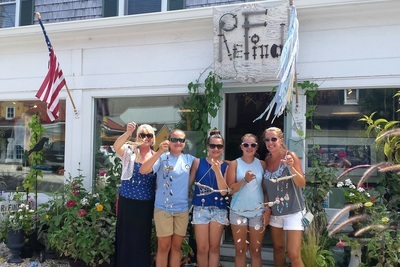 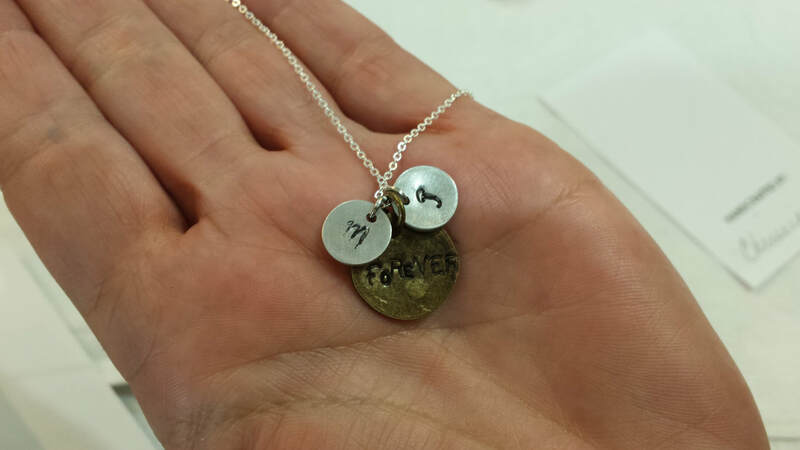 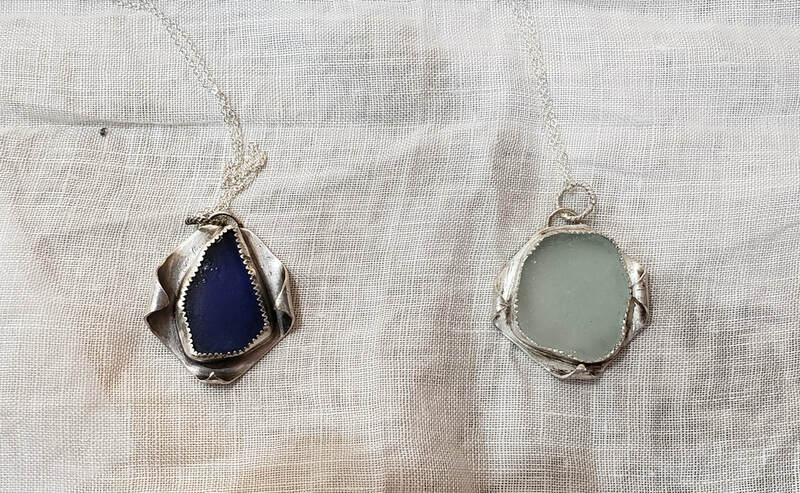 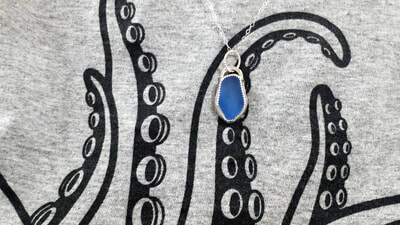 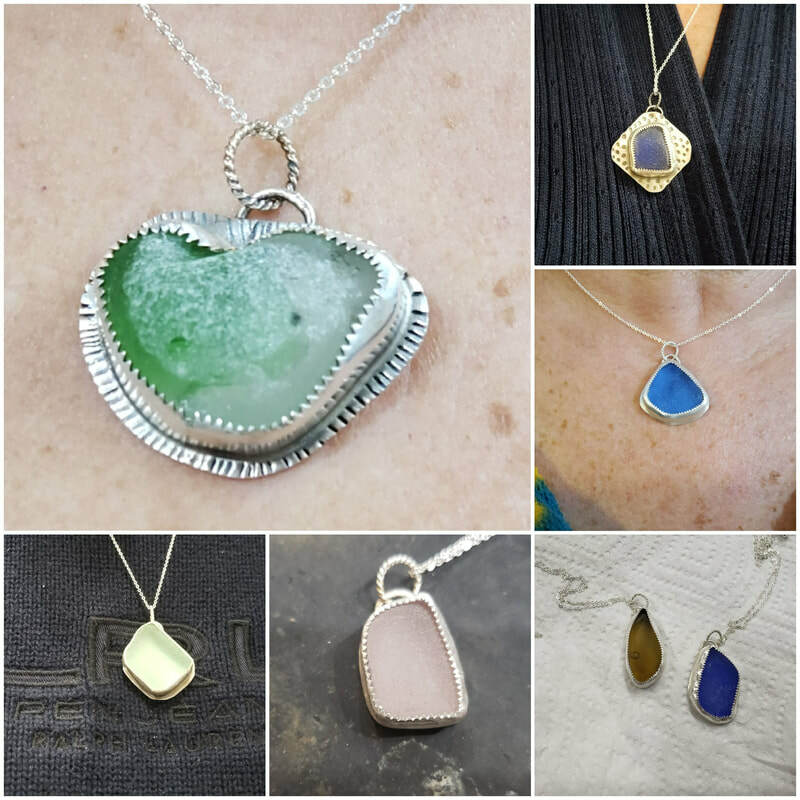 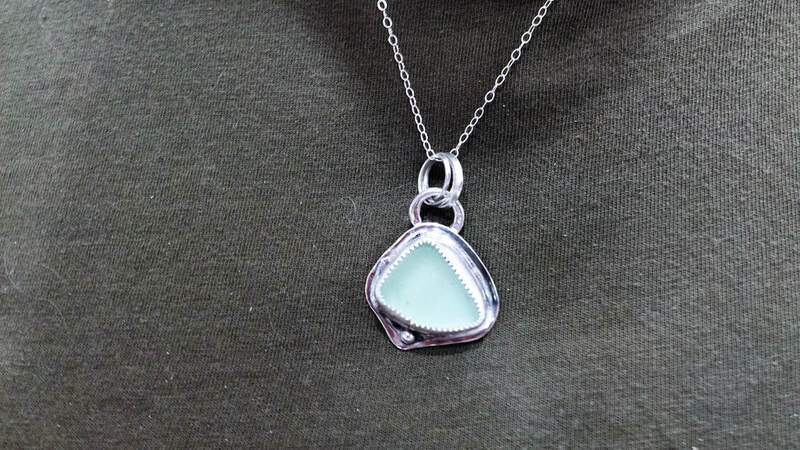 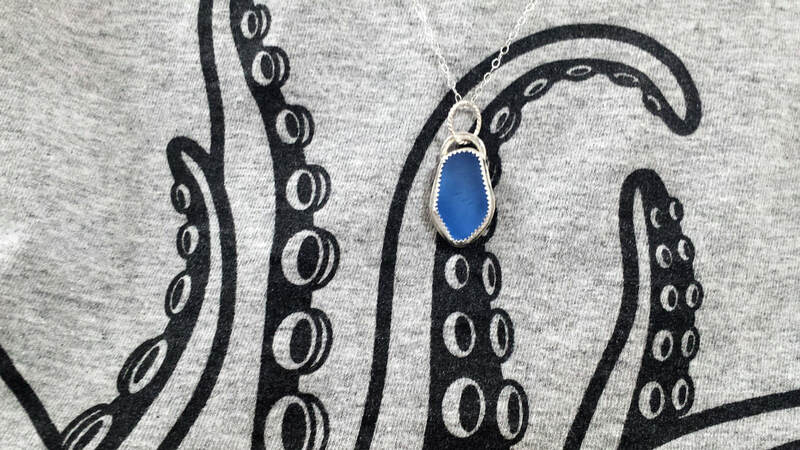 Create a keepsake sterling silver necklace with your very own piece of sea glass! No experience is required for this entry level workshop. 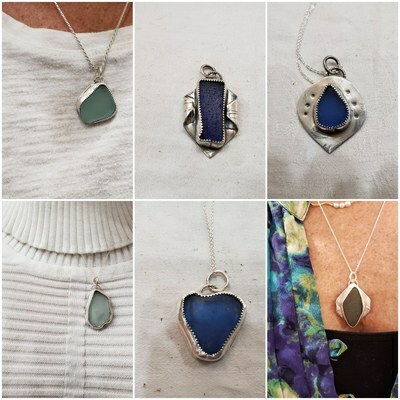 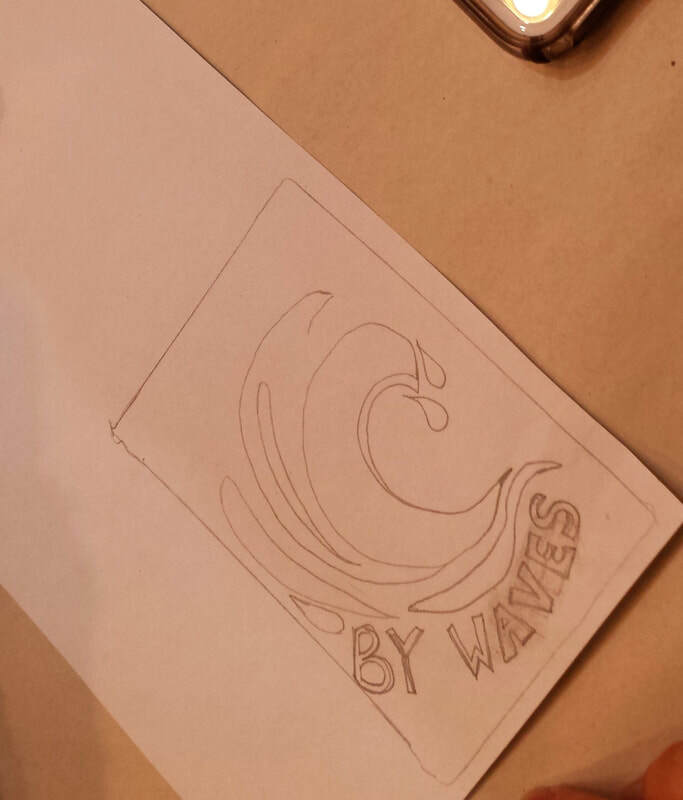 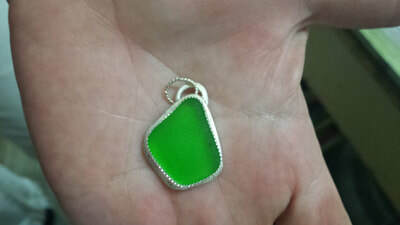 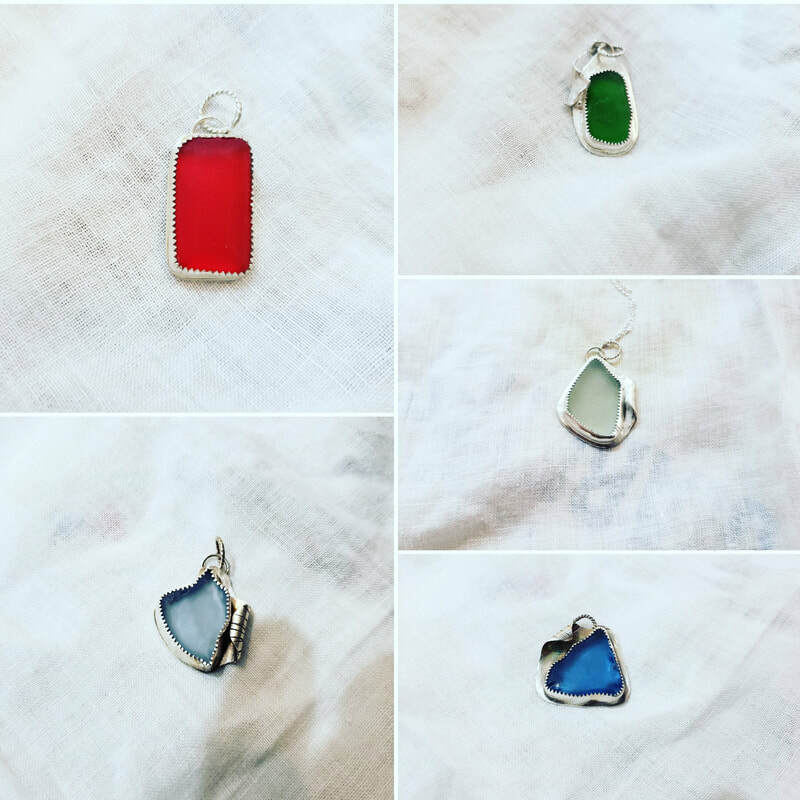 You will be guided through the process of creating a one of a kind sea glass pendant to hang on a sterling silver chain. 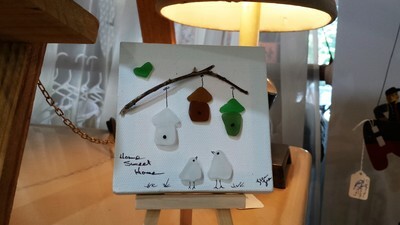 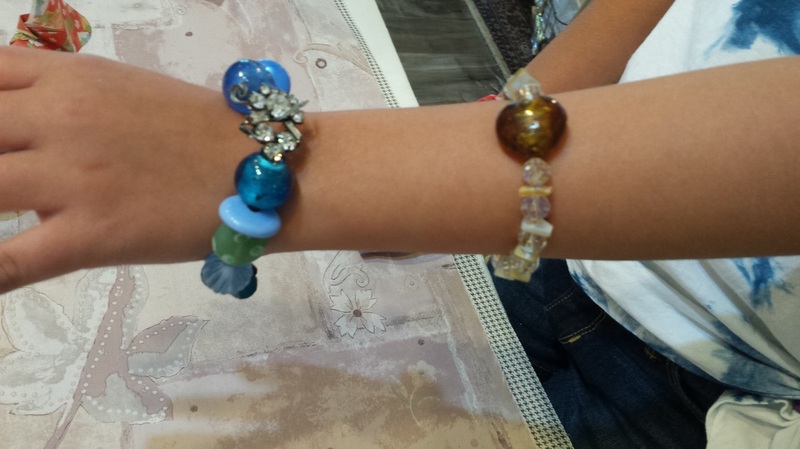 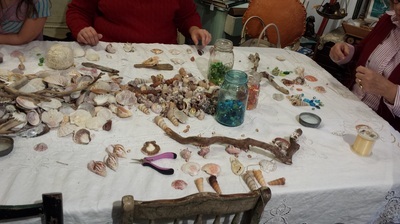 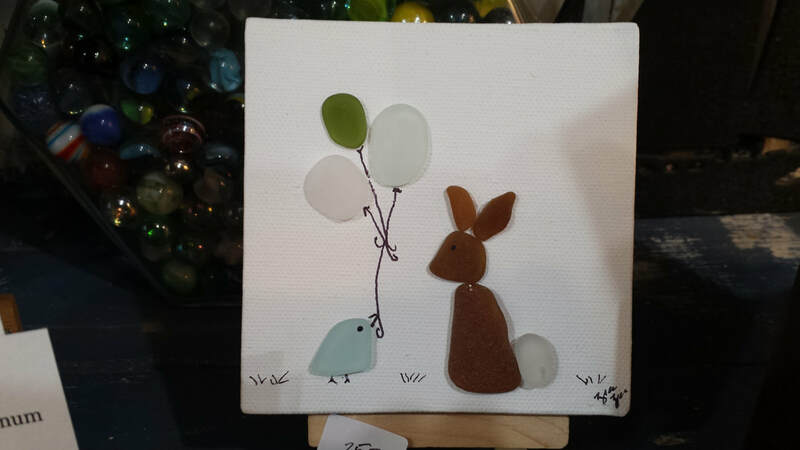 Bring 3-4 of your own found sea glass pieces to choose 1 from. 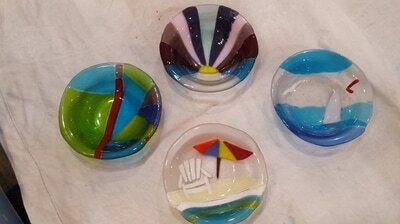 They should be flat, thick, square in shape (or close to it) and no larger than 1 inch in overall size. 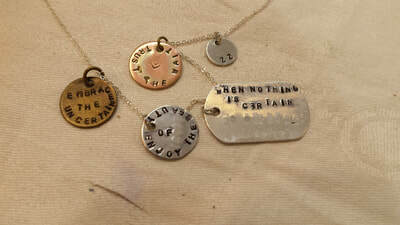 **If you do not have any, there will be some to choose from. 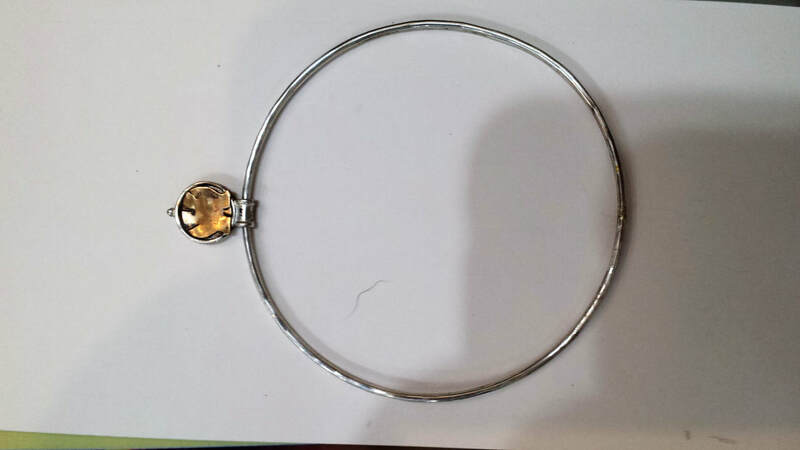 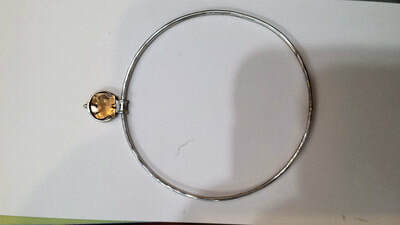 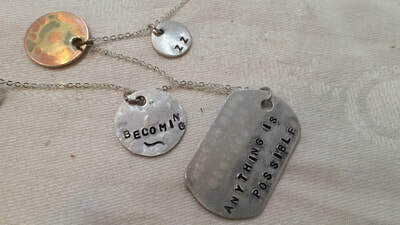 All other materials provided, including a 20” sterling silver chain. 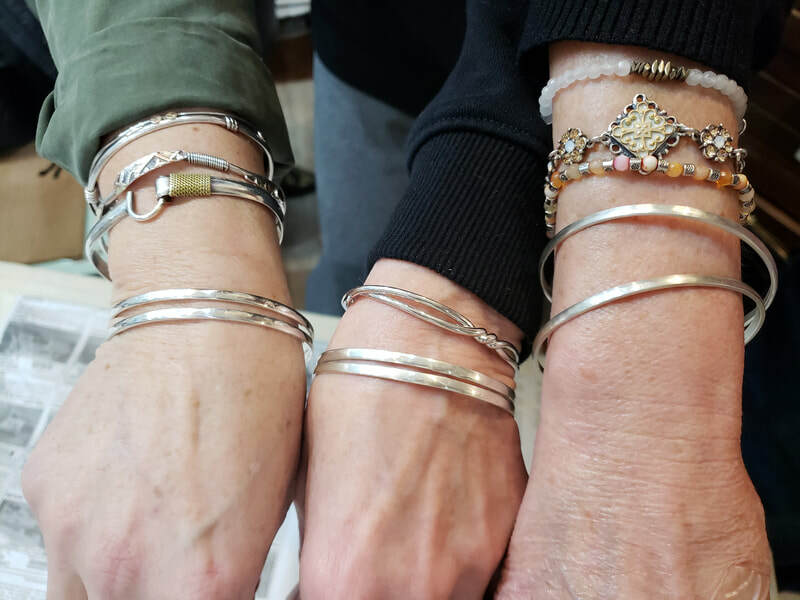 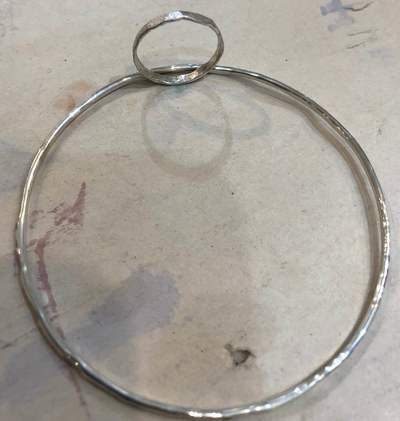 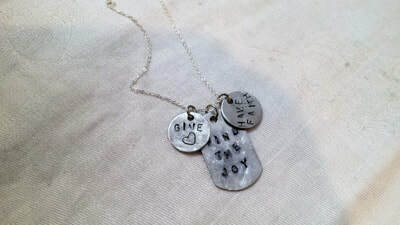 You will learn the art of torch soldering, creating a bezel, stamping, cutting, and polishing sterling silver. $40 non-refundable deposit to hold your torch! 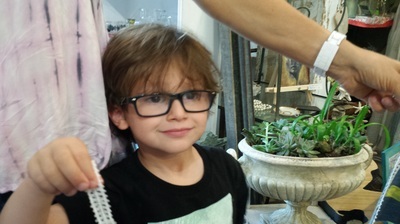 Cash or check preferred please. 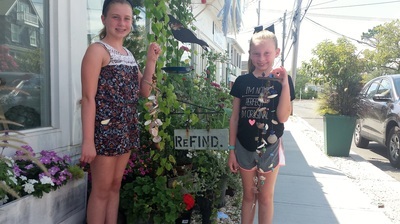 Connect with ReFind to commit. 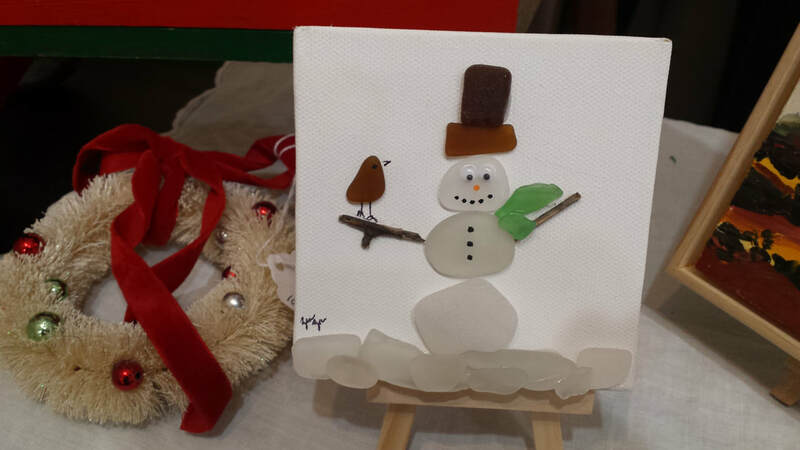 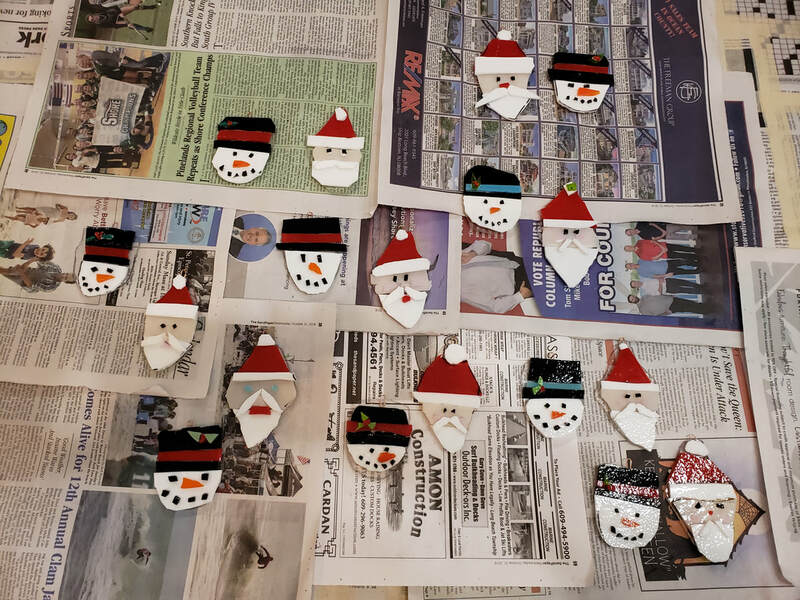 Create both “Santa” and “Snowman” during this fused glass holiday ornament workshop. 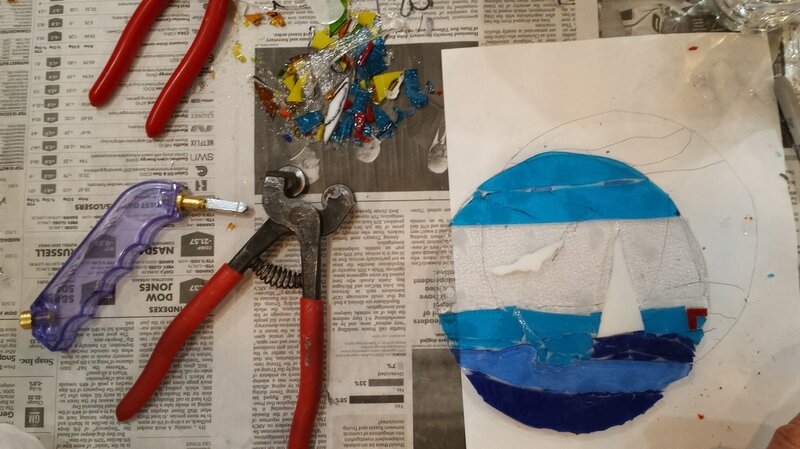 Learn the art of cutting glass with safety first. 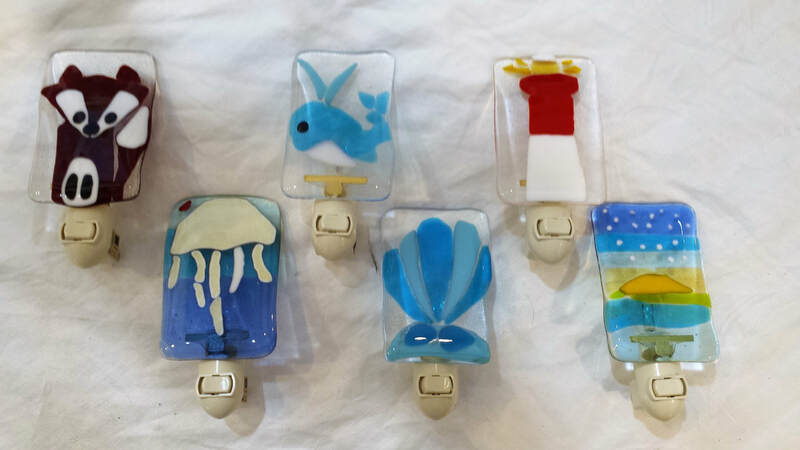 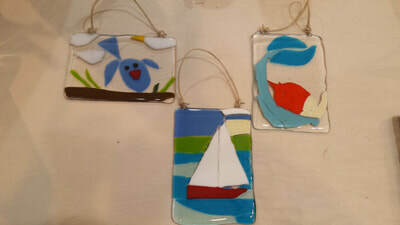 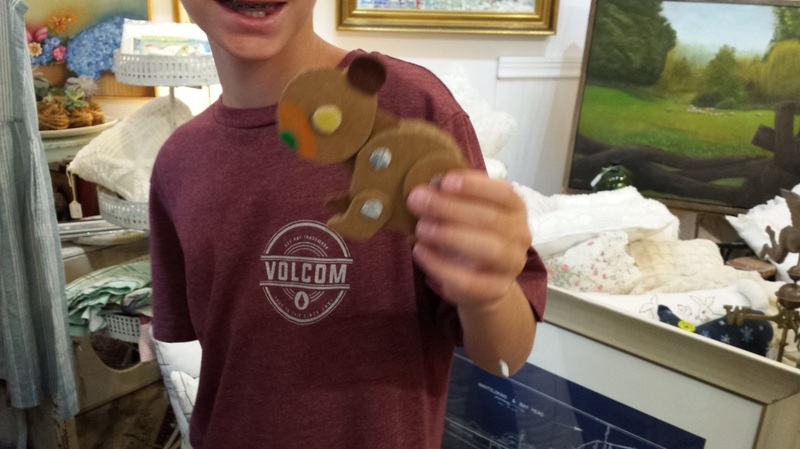 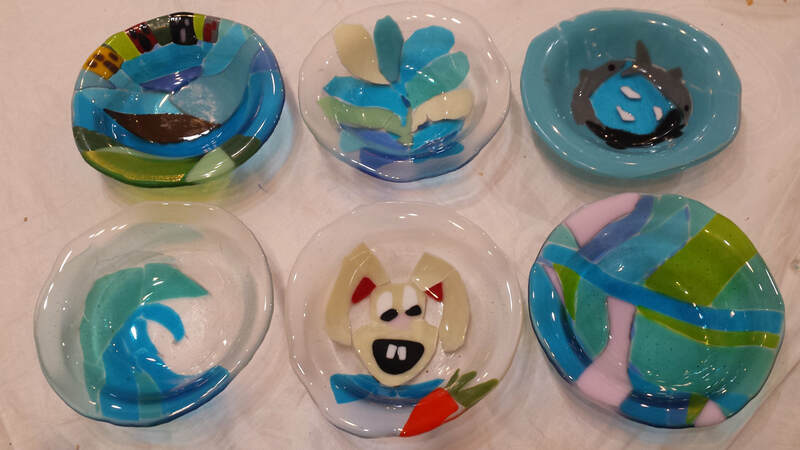 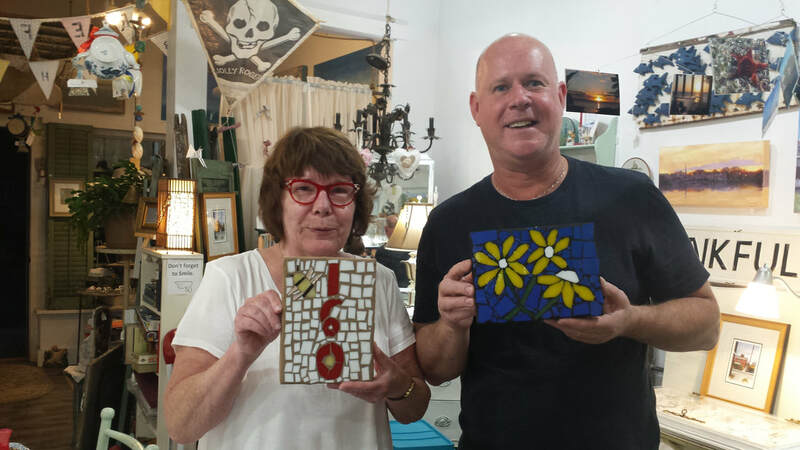 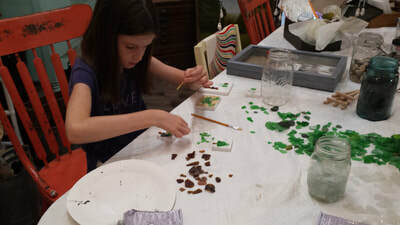 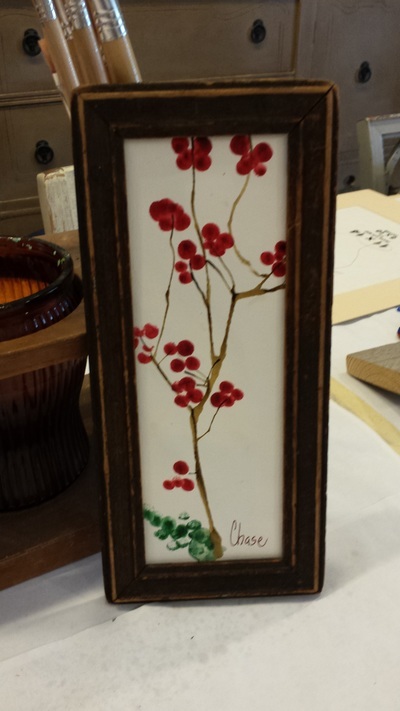 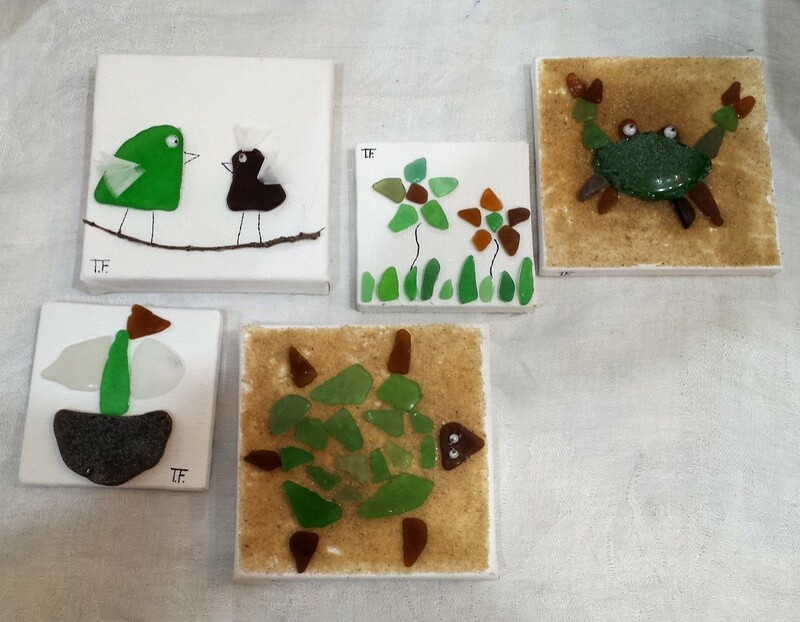 $48 per glass cutter/2 ornaments each artist. 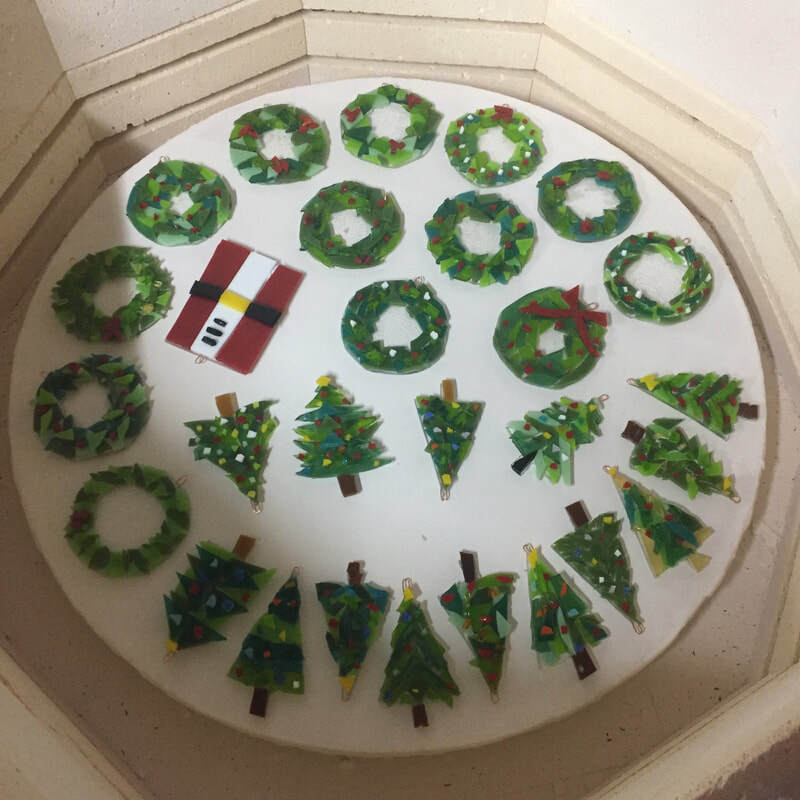 NOTE: completed ornaments have to be kiln fired and will be returned to you in time to adorn your tree, or gift them to someone special. 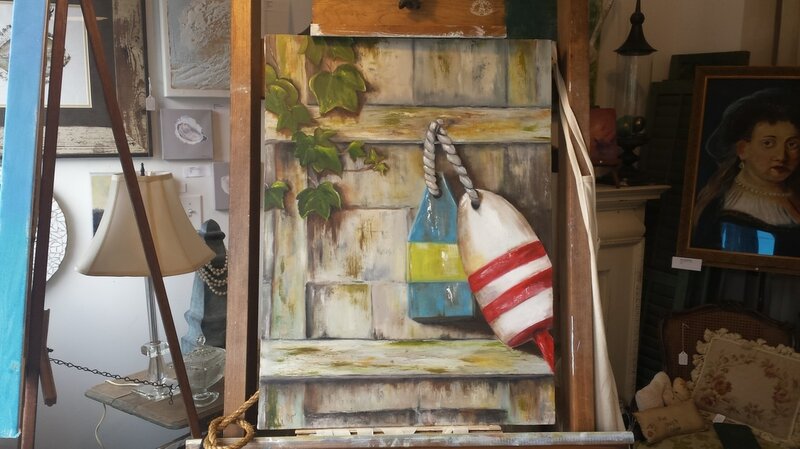 Returned ready to hang. No experience required for this entry level workshop. Create a keepsake sterling silver necklace with your very own piece of sea glass! 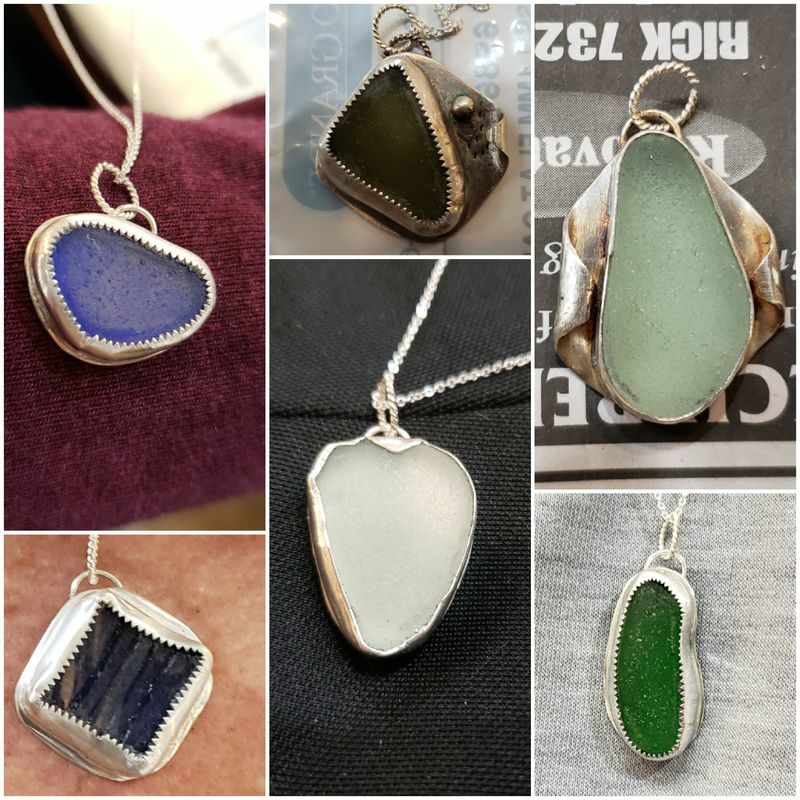 You will be guided through the process of creating a one of a kind sea glass pendant to hang on a sterling silver chain. 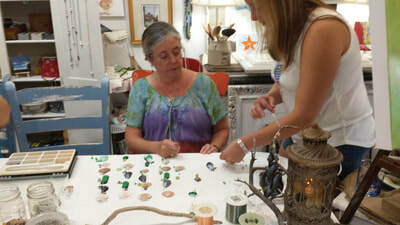 In this gathering, you will be guided by a professional metalsmith while creating your own one-of-a-kind Fresh Water Pearl stud earrings, set in an embellished sterling silver bezel. You will learn the art of torch soldering, creating a bezel, polishing, pearl setting and oxidizing* sterling silver. 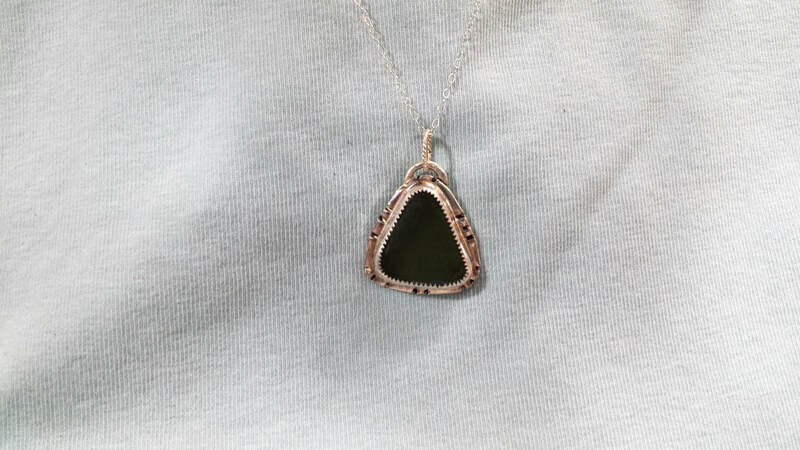 * oxidizing is optional and not required. 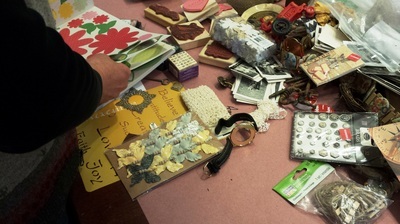 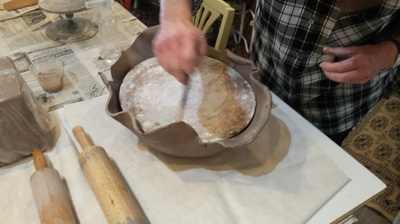 All materials provided by the instructor. You will be able to choose from a variety of FWP available on hand at ReFind. 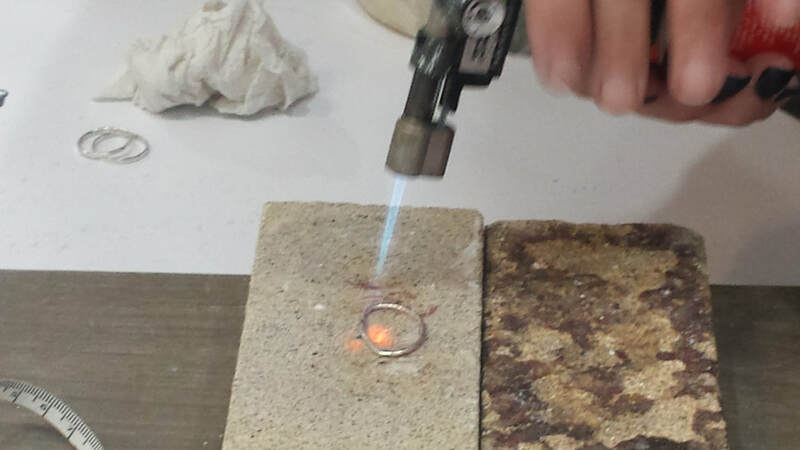 You will learn the art of torch soldering, creating a bezel, polishing, pearl setting and oxidizing* sterling silver. * oxidizing is optional and not required. 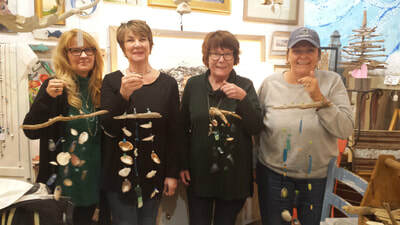 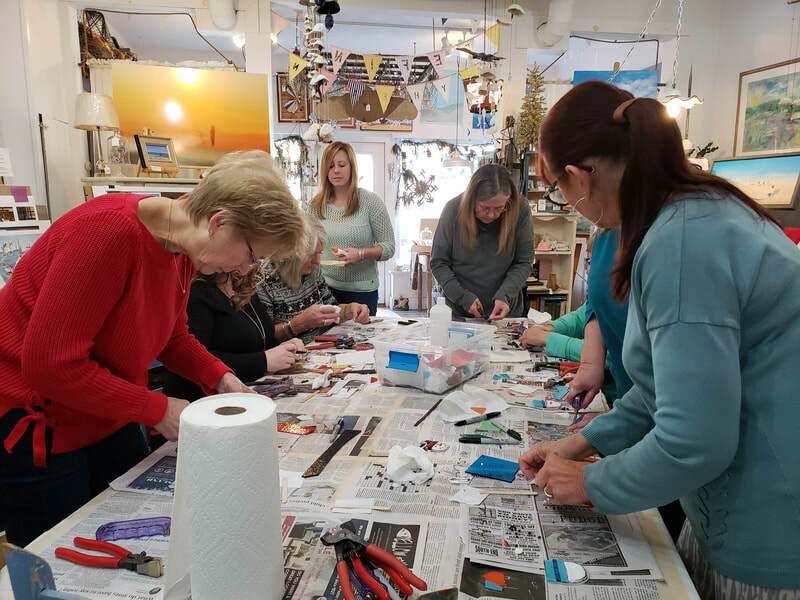 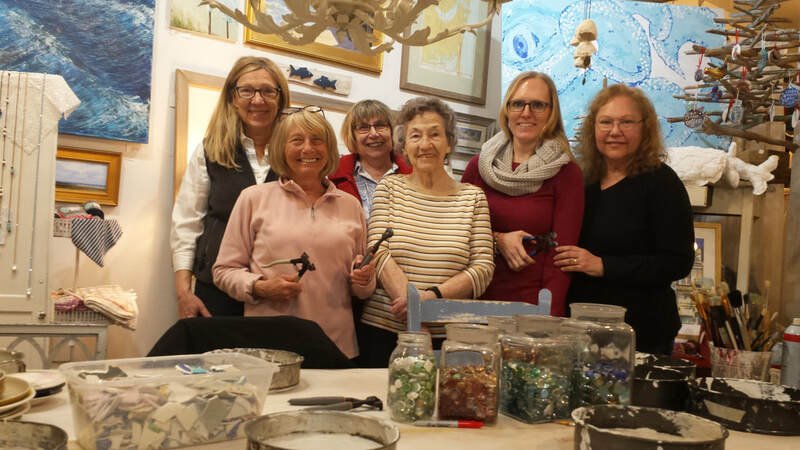 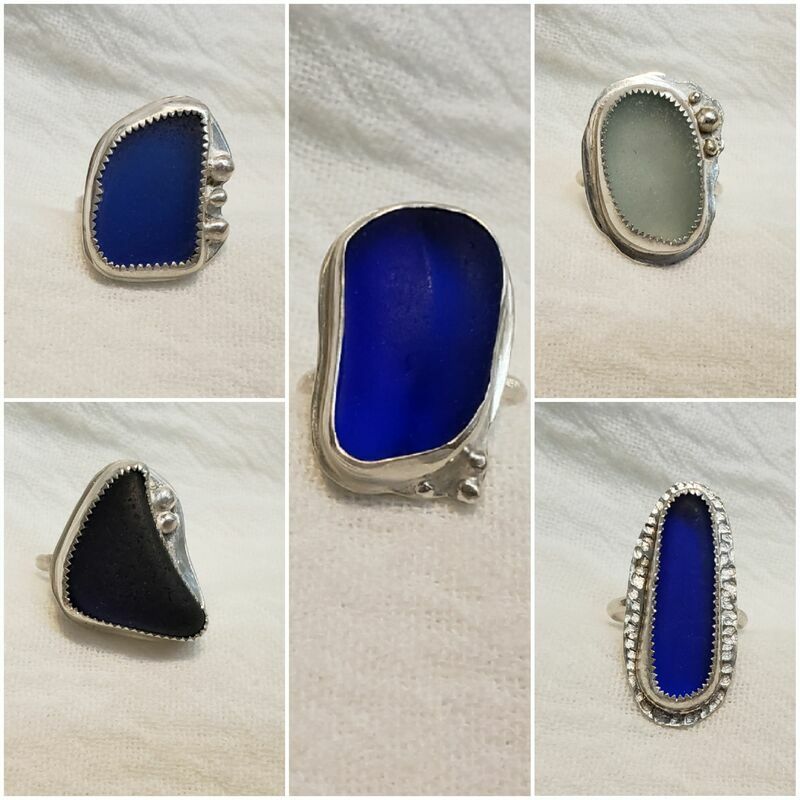 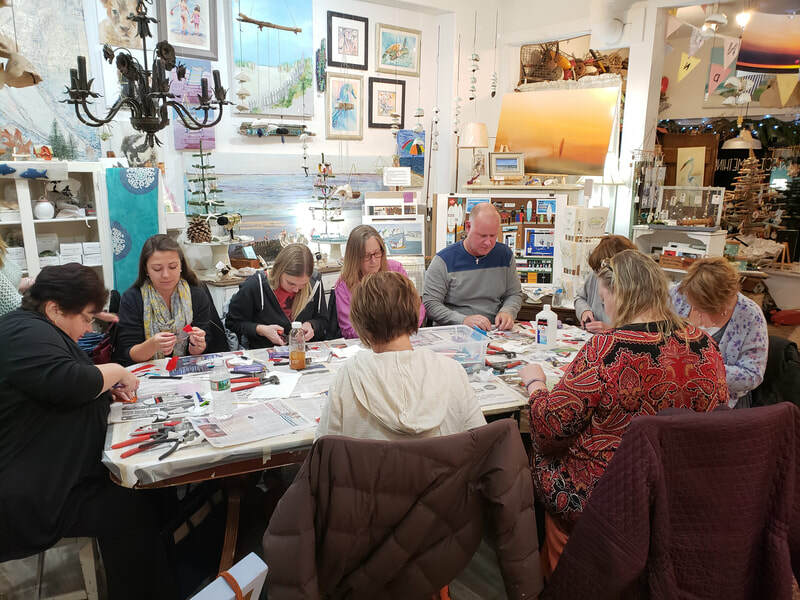 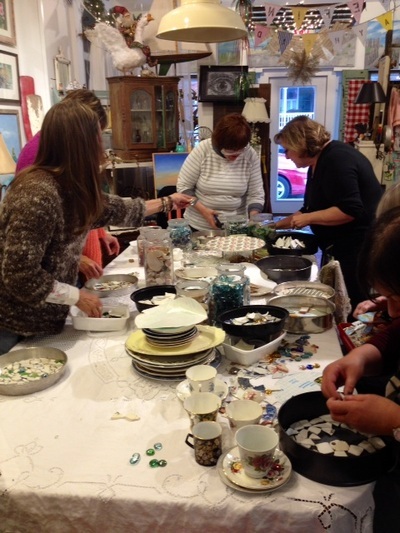 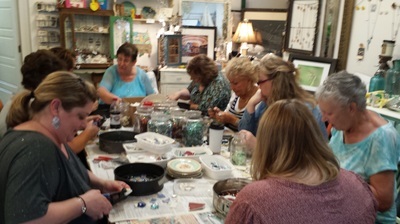 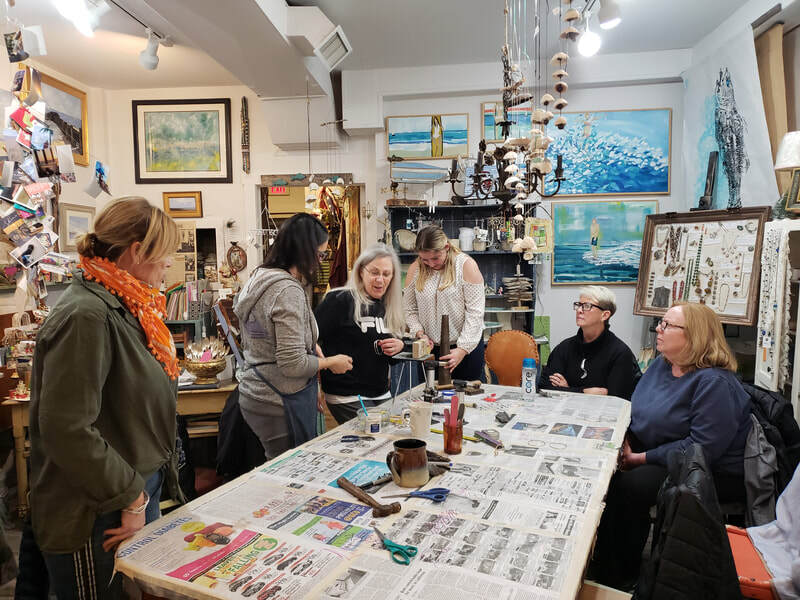 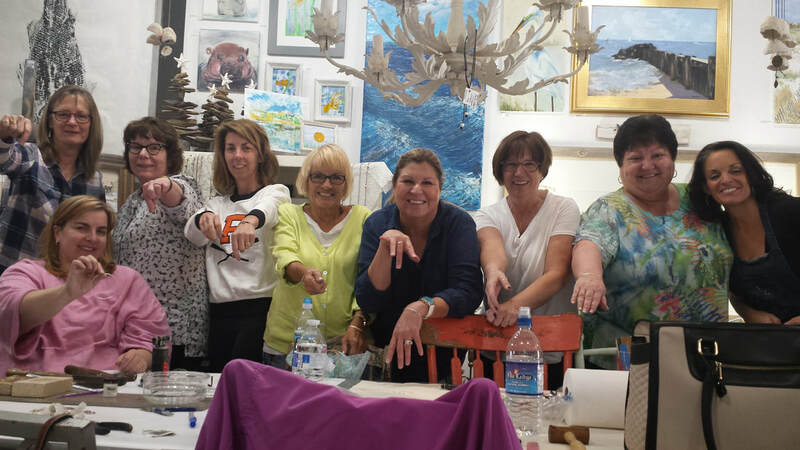 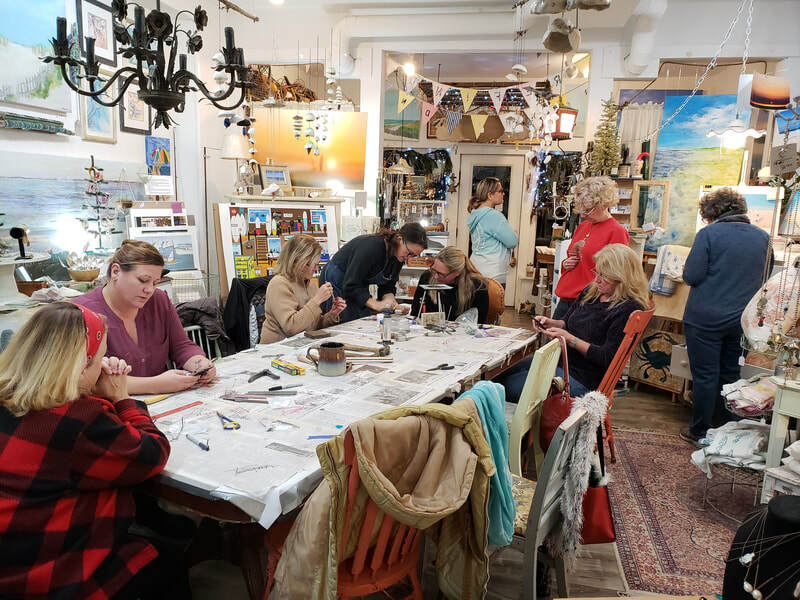 In this gathering, you will be guided by a professional metalsmith while creating your own one of a kind sea glass ring set in sterling silver with silver ball embellishment. All materials provided by the instructor. 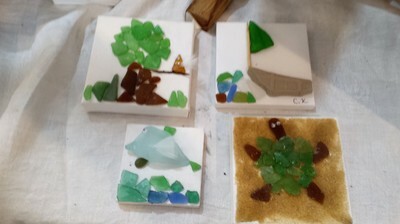 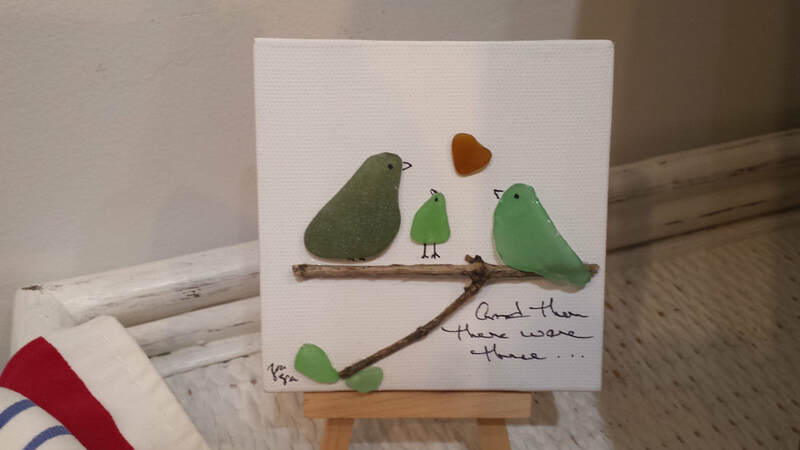 Bring your very own piece of sea glass (***see note below) or choose from a variety on hand at ReFind. *** Please note: Sea glass requirements are as follows: MUST BE dark in color, smaller than 1" in size, medium thickness (or as close to these specifications as possible). 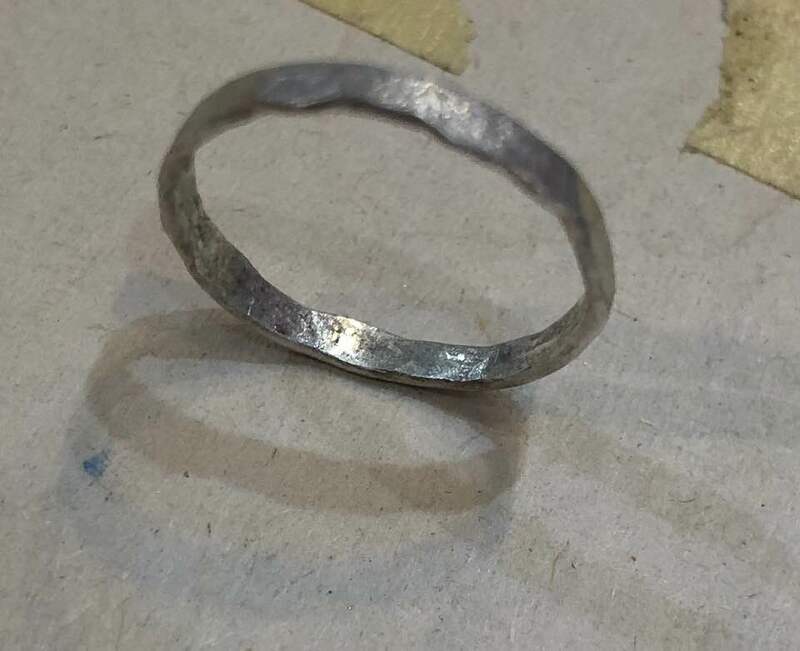 You will learn the art of torch soldering, creating a bezel and ring band, cutting, polishing, stone setting and oxidizing* sterling silver. 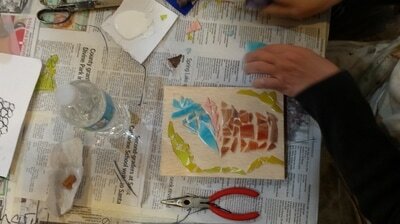 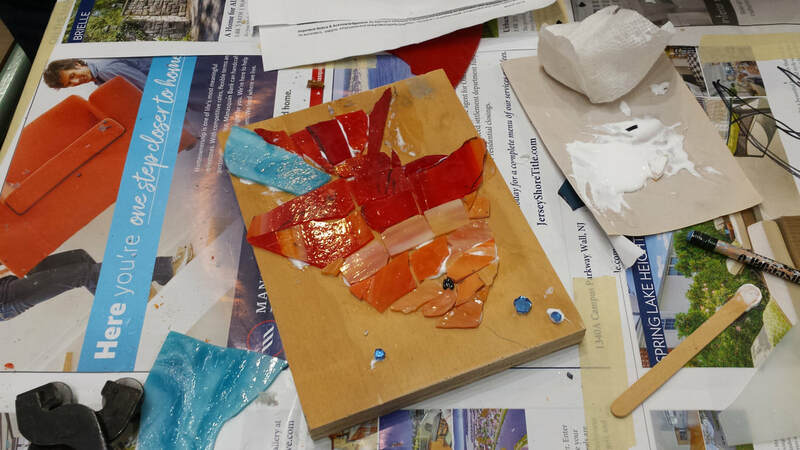 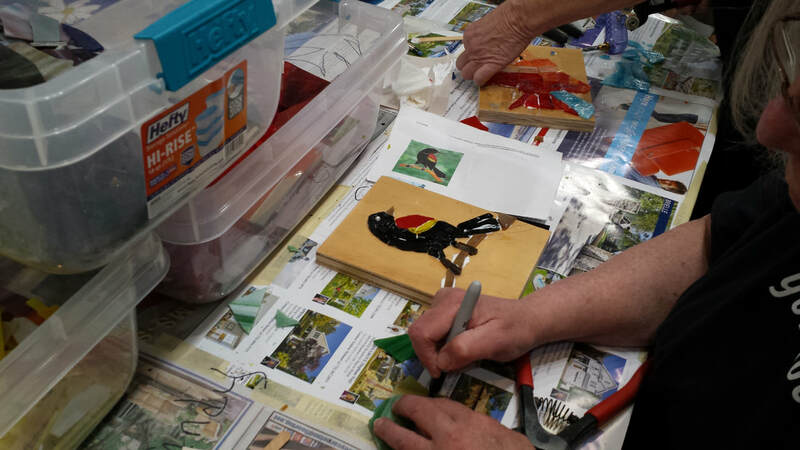 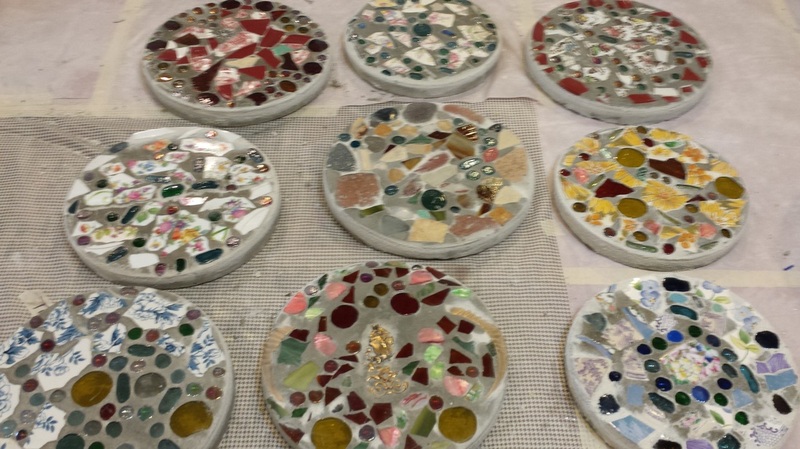 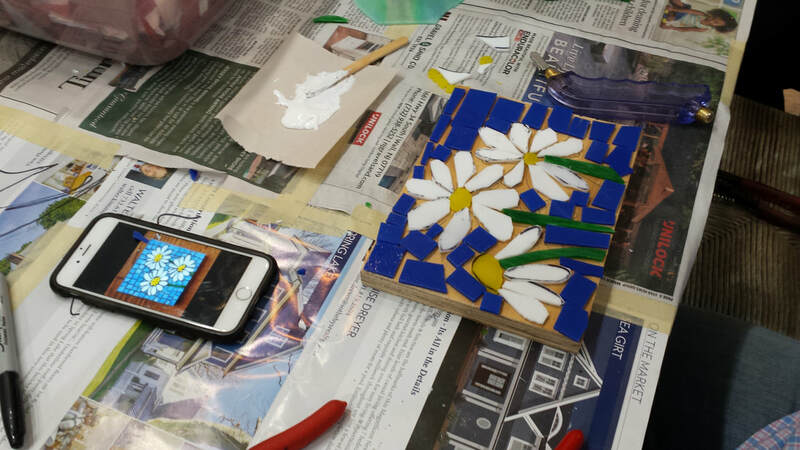 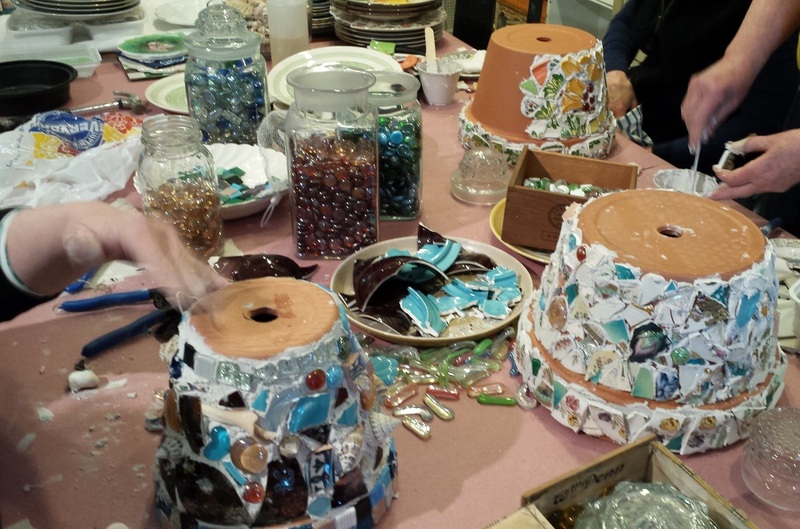 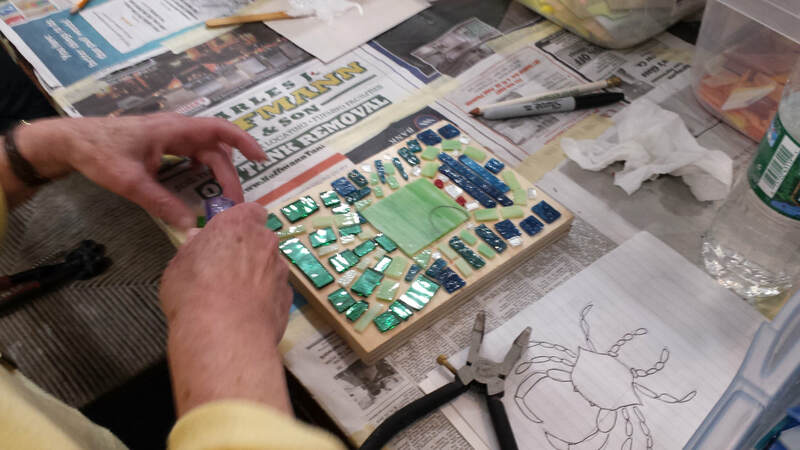 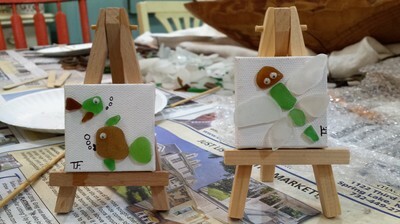 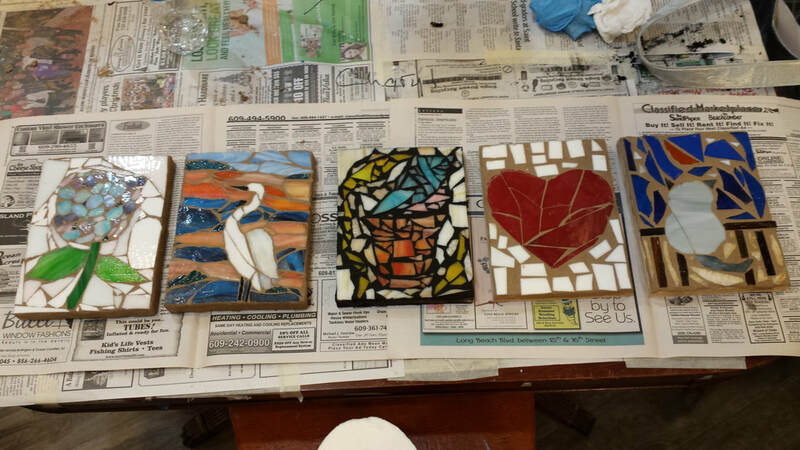 Gather around the table and create a glass mosaic panel. All materials included-glass/tools/6x8 wood base/glue/grout...all you need to bring is a design to fit base that you can make your own! 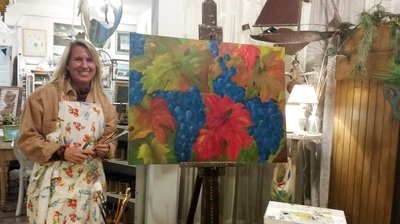 No Experience need...just an open mind and a desire to have fun!! 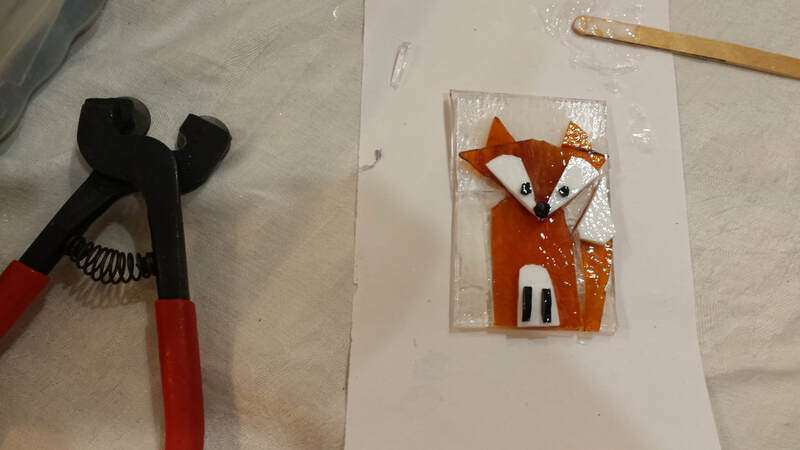 $55 per artist/$20 non refundable deposit is required to hold your glass cutters. 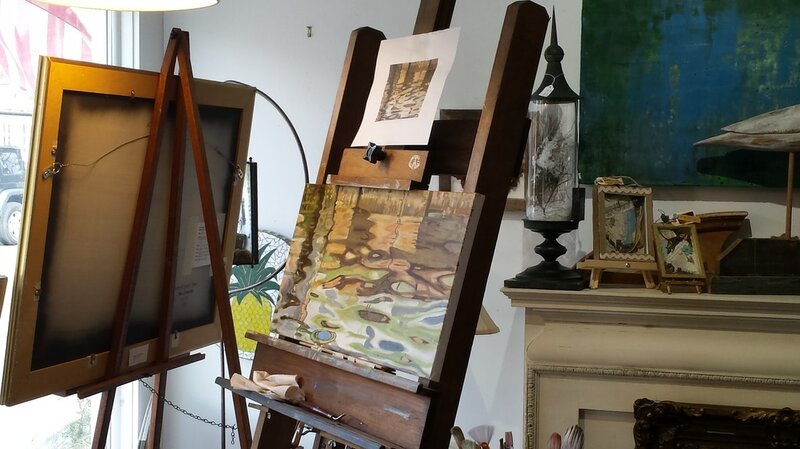 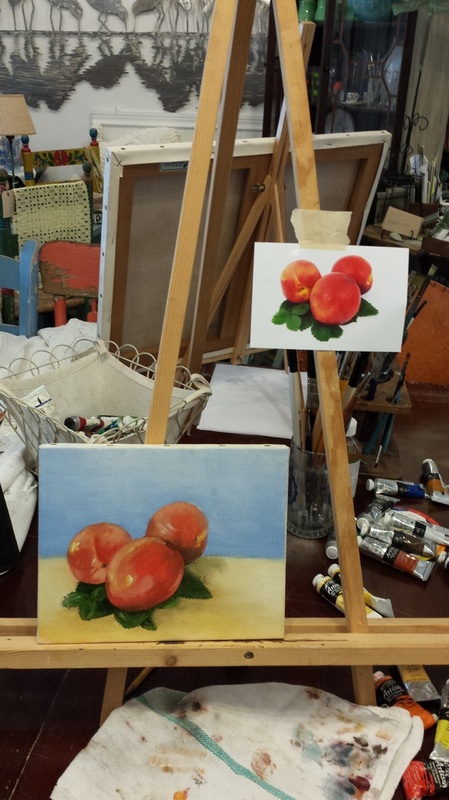 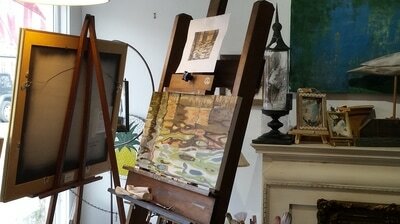 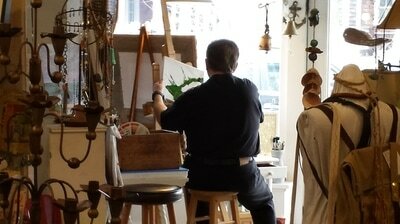 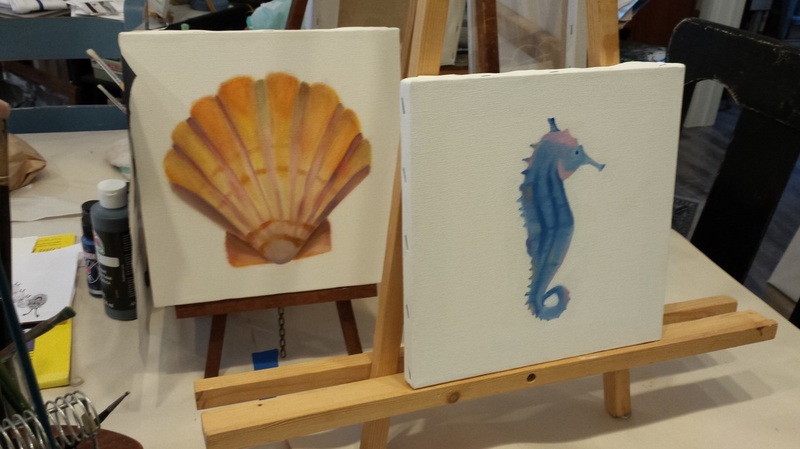 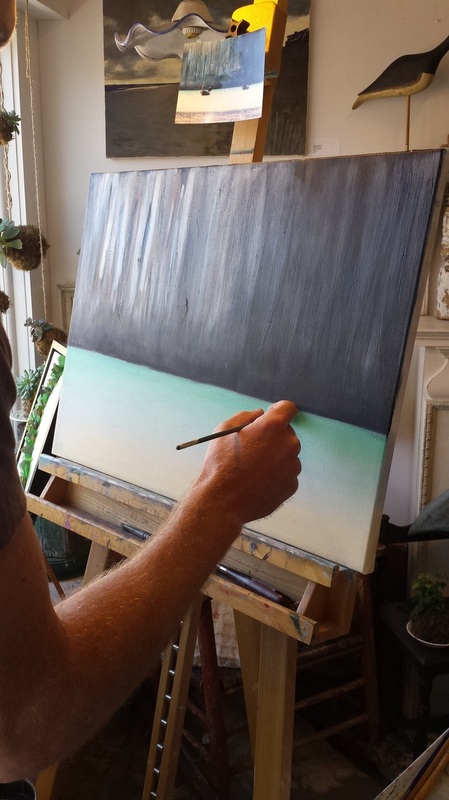 Whether you are a beginner or want to brush up/ learn something new, join ReFind in this oil painting workshop. 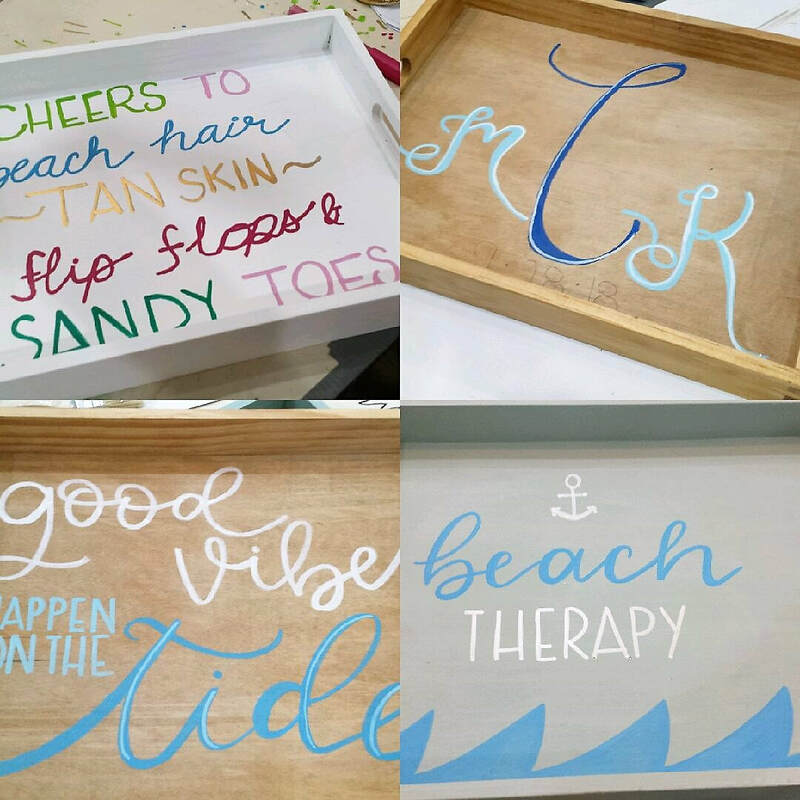 On a 10x10 gallery wrapped canvas, you will learn how to mix with a limited palette, create an undertone painting, and utilize brushes and a palette knife to enhance your "Beach Chair" with sparkle and texture. 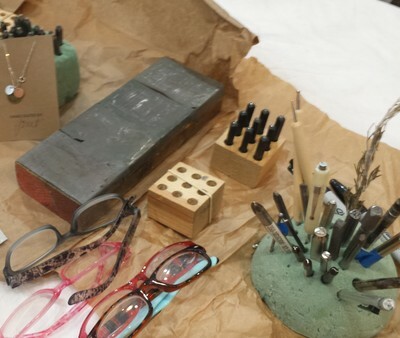 All materials are supplied. 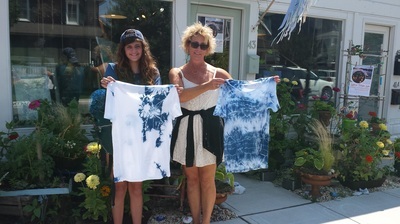 All you need to bring is smock/apron or wear clothes that you don’t care about. And feel free to bring lunch/ snacks too! You will be guided through from start to finish so have no fear! 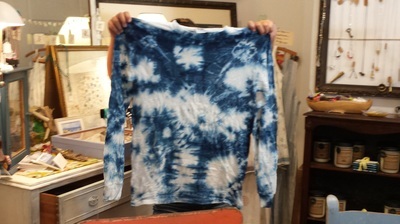 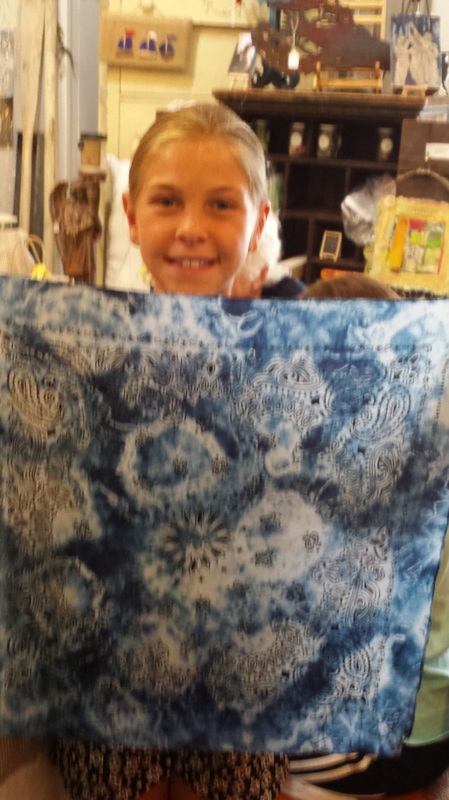 Shibori: known to be one of the oldest Indigo dying techniques in Japan. 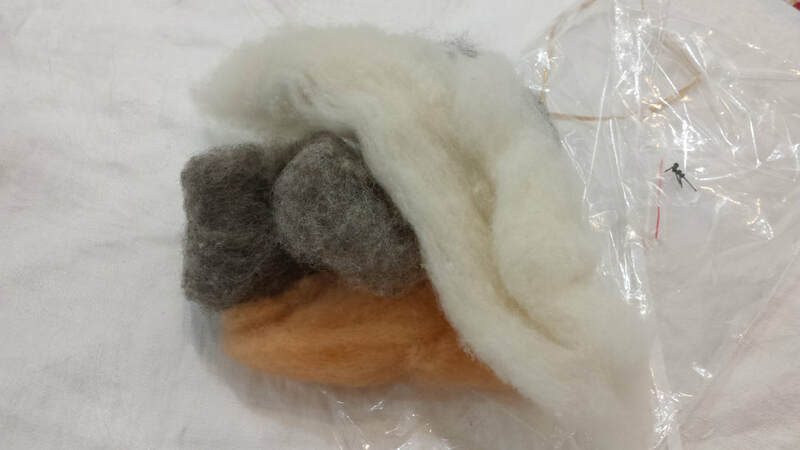 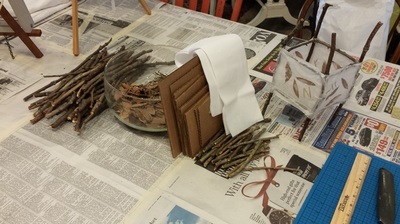 Cloth is bound, stitched, folded, twisted, clamped and or compressed for fun and creative results! 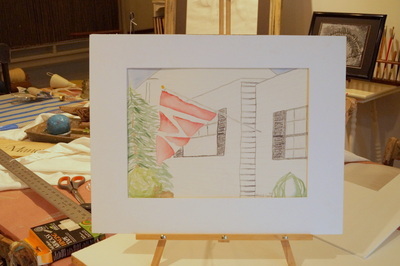 Just bring anything white and cotton-a tee/canvas bag/pillow cases....and leave the rest up to your imagination! 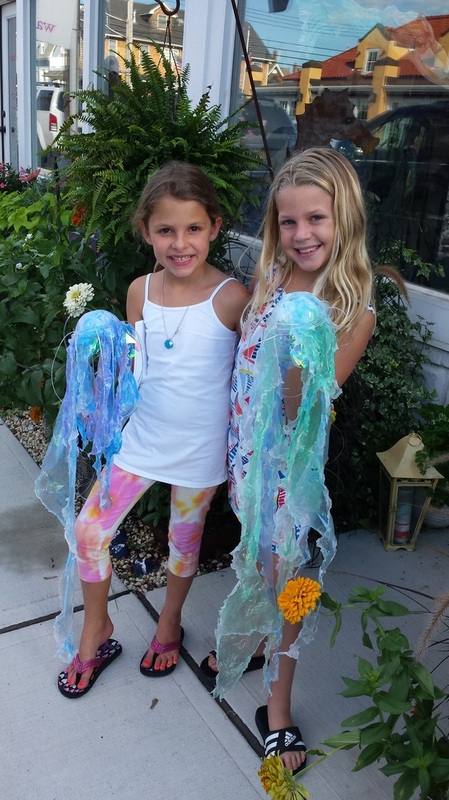 Jelly Fish Mania II. 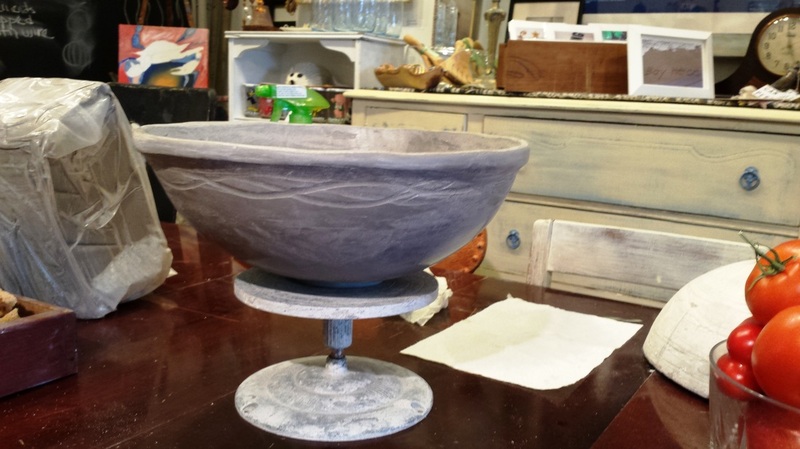 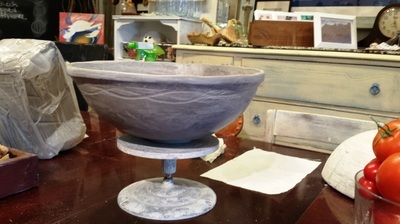 A ready made pottery "medusa" in need of your attention. 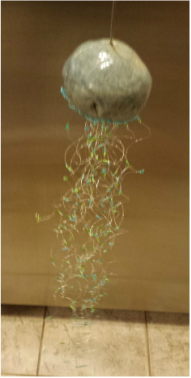 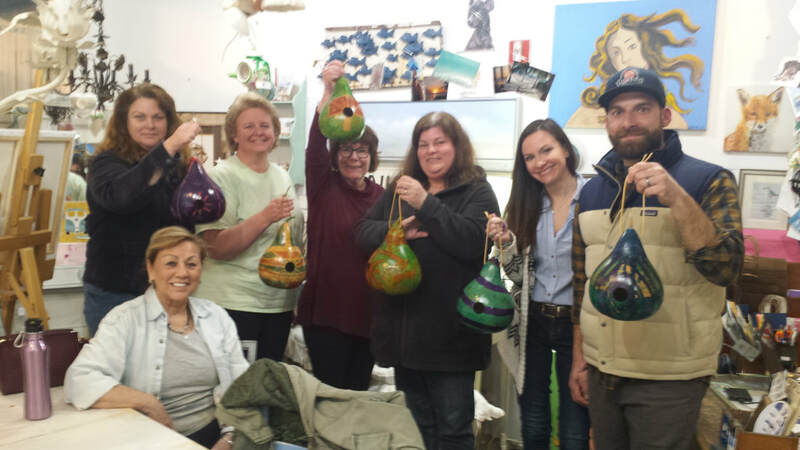 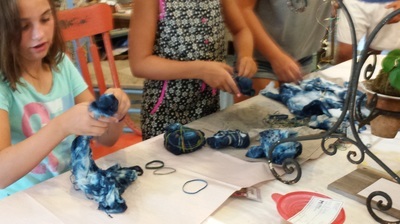 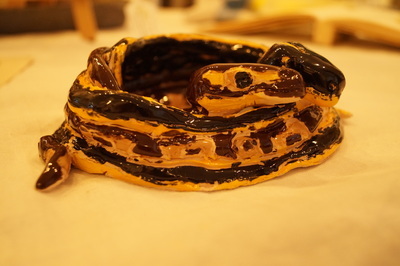 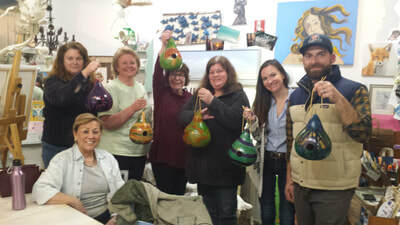 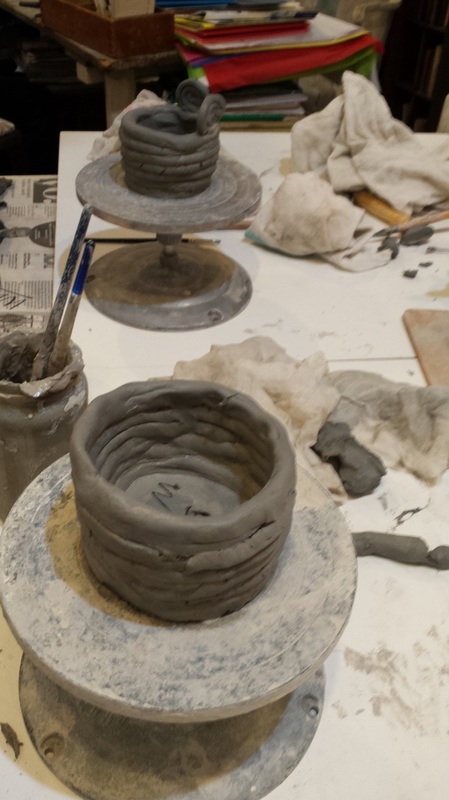 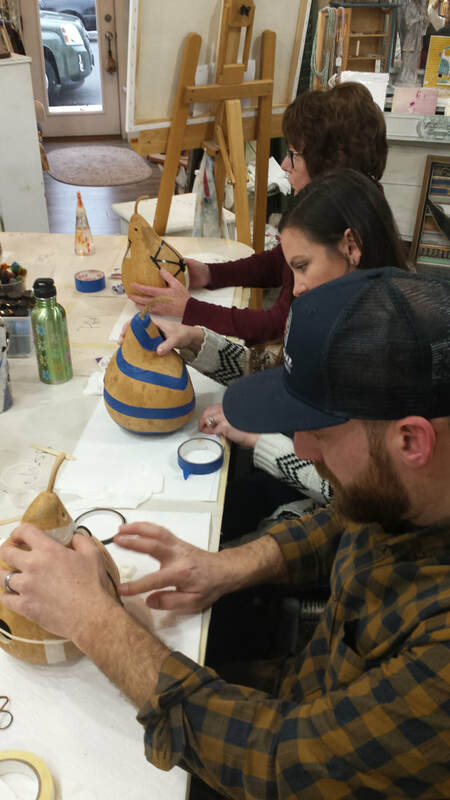 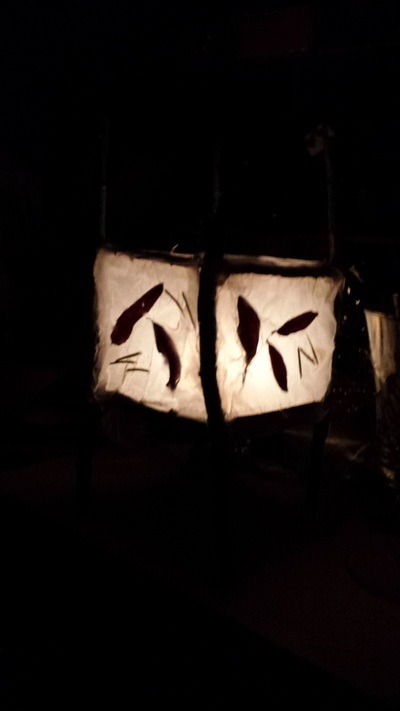 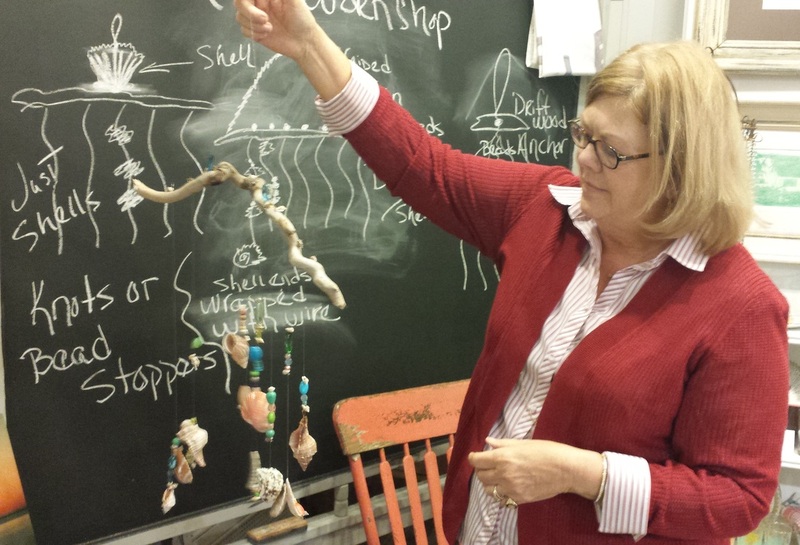 With wire and beads...and patience, artists bring life to pottery in the way of tendrils and stingers! 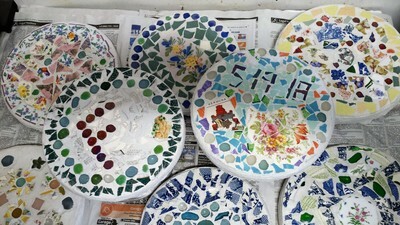 No pain inflicted from these though!! 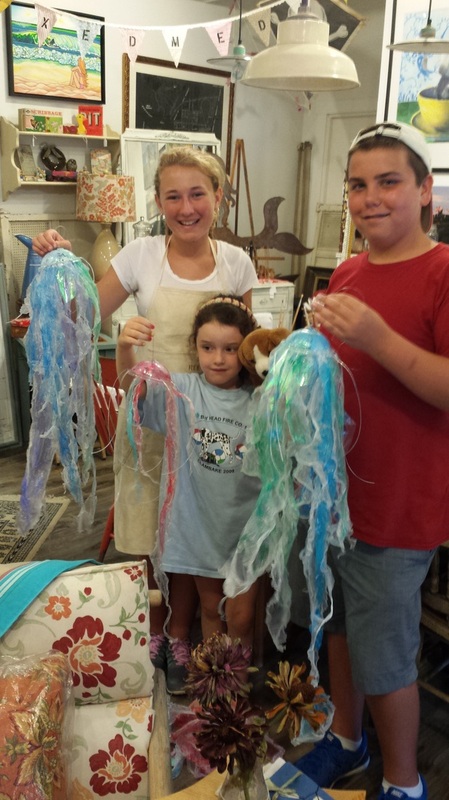 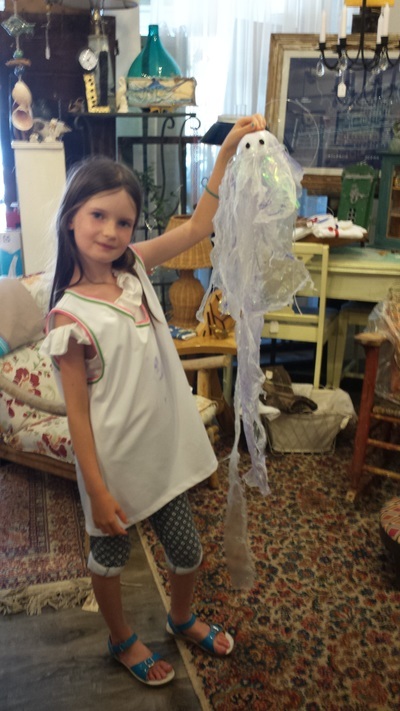 Jelly Fish Mania I- Recycled ocean life!! 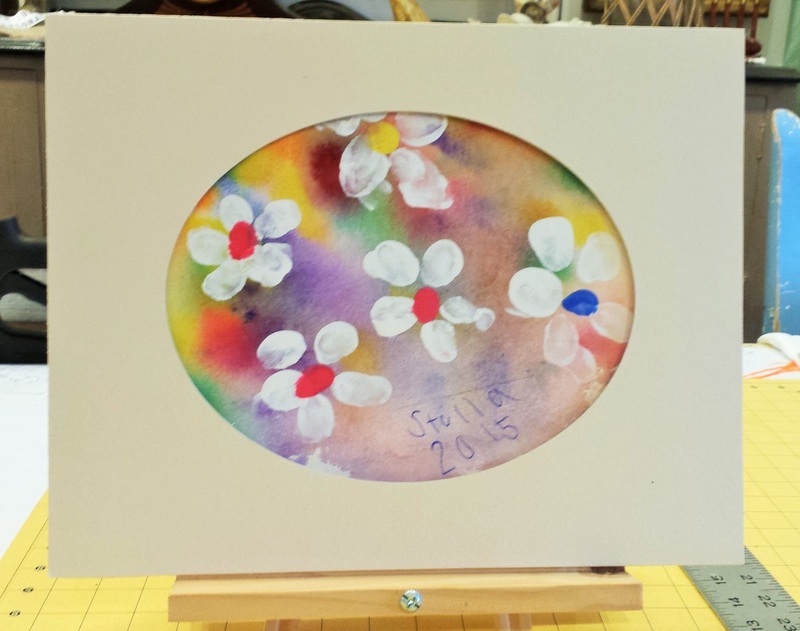 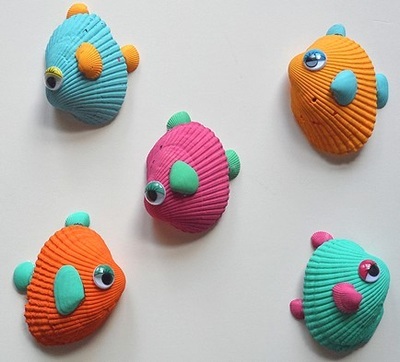 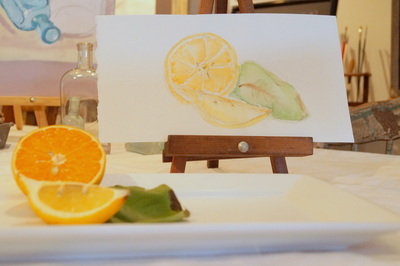 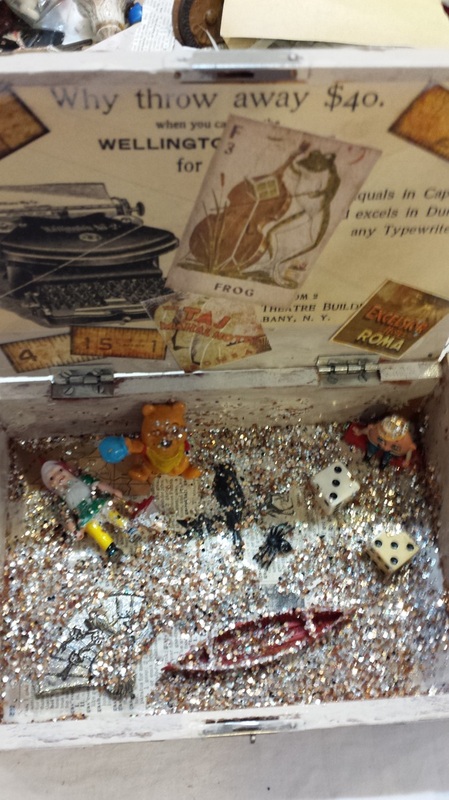 A wonderful project for your budding artist. A Zinnia garden that does not need watering. 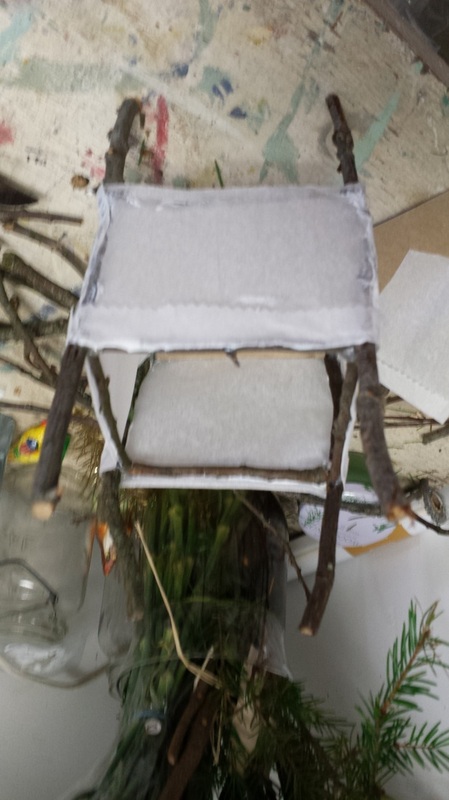 ​Created from nature and found materials. 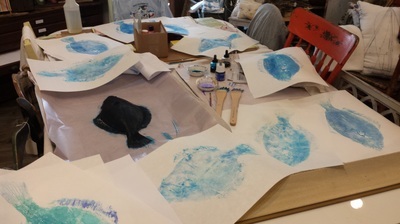 Depending on time, some projects embraced last summer...blown India ink and water coloring, Jelly fish mania (another version from recycled materials) solar printing may be revisited. 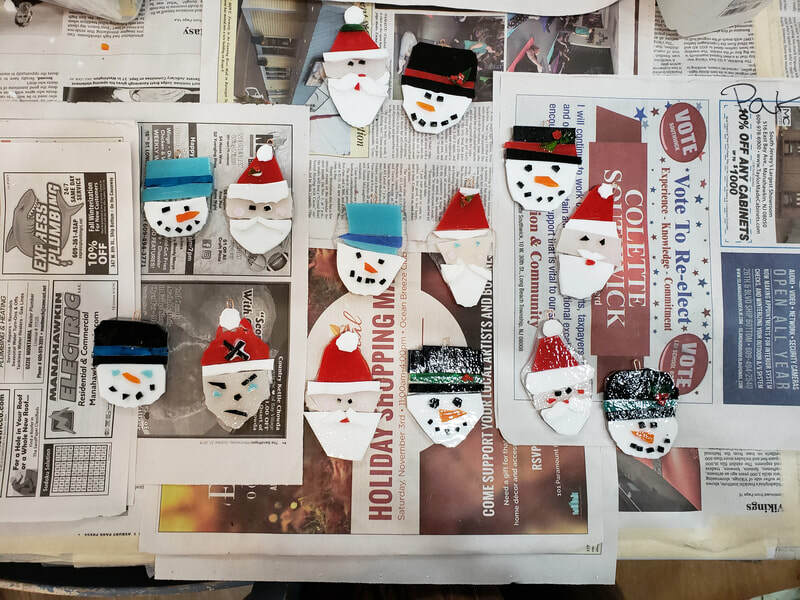 They were so fun to do...ask those who participated last year. 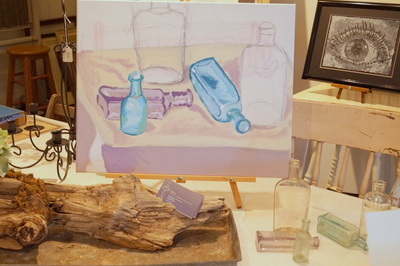 Art Sharing at it sneakiest! Create a work of art, no matter the medium or level of talent-can be anything from an inspirational message to a doodle to a painting...art is art in many forms- and leave it somewhere for an unsuspecting person to find. Whether it's at a park, shopping cart, bench, tree limb,vacation destination, local coffee shop...anywhere you want to take it and leave it. 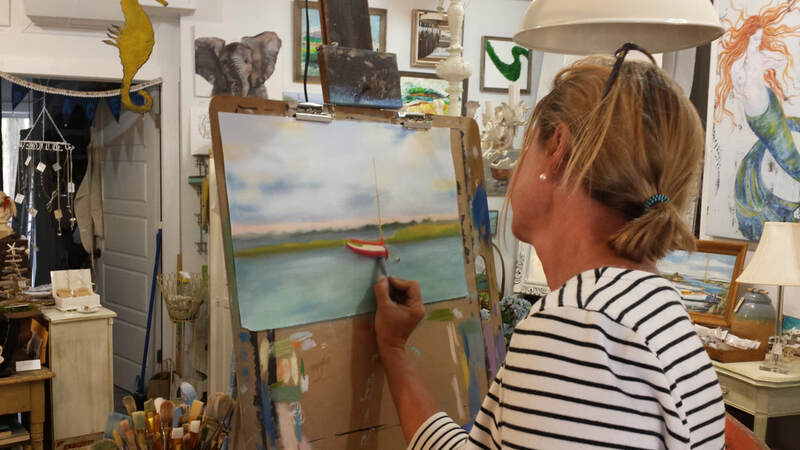 Let go of your art and let someone discover it. 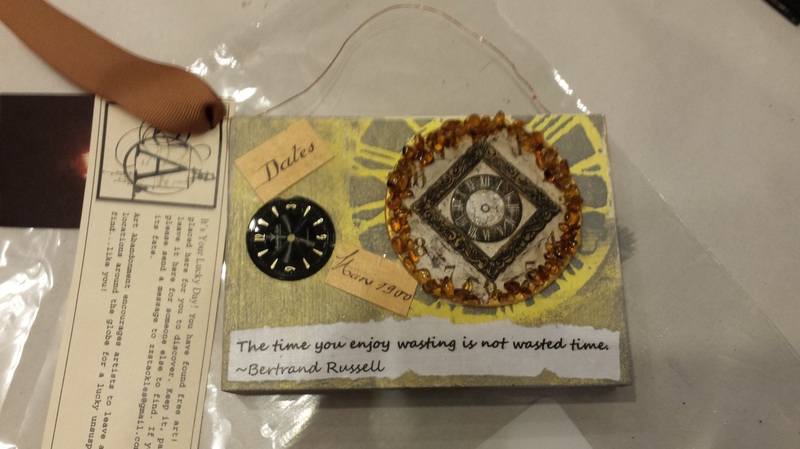 Time spent is up to you! 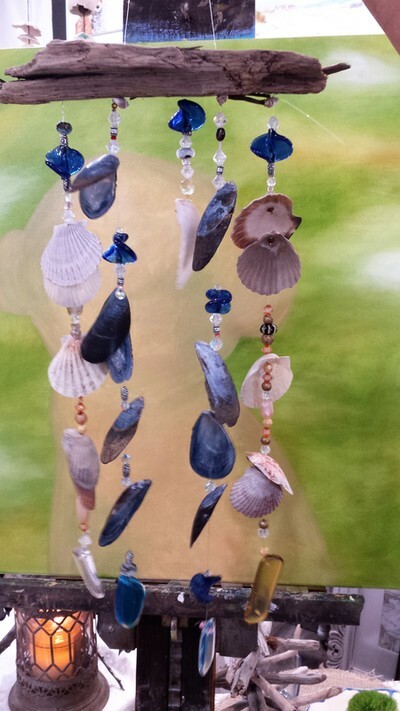 Sea chime mixed with some fins! 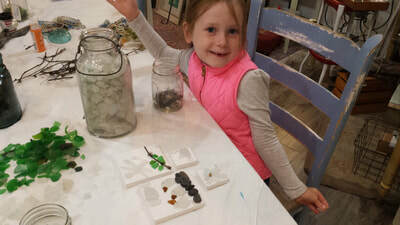 Even wee little ones create here...with the help of mom! 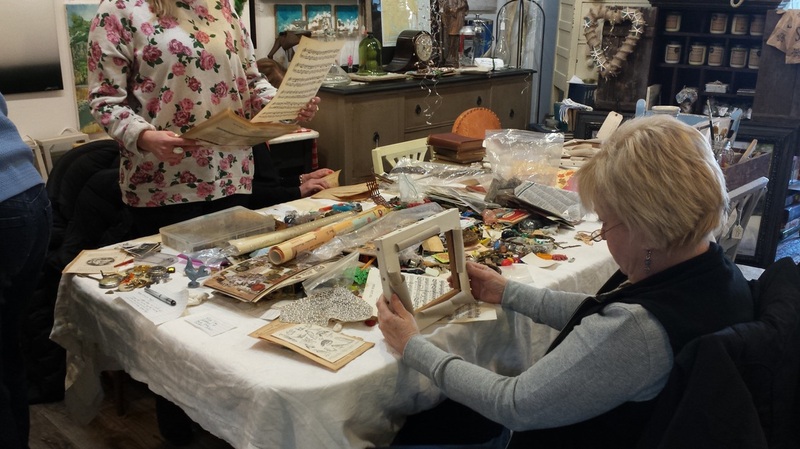 An array of workshops available at ReFind! 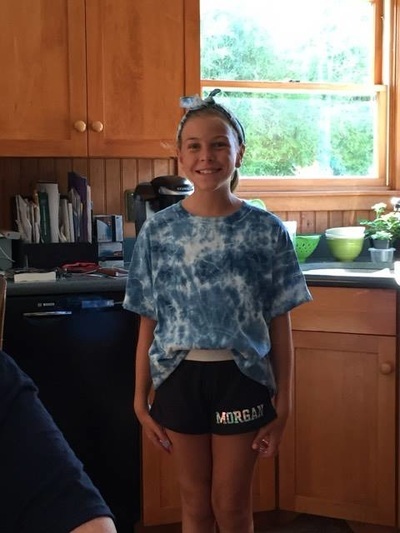 Shoreline Memories for all ages! 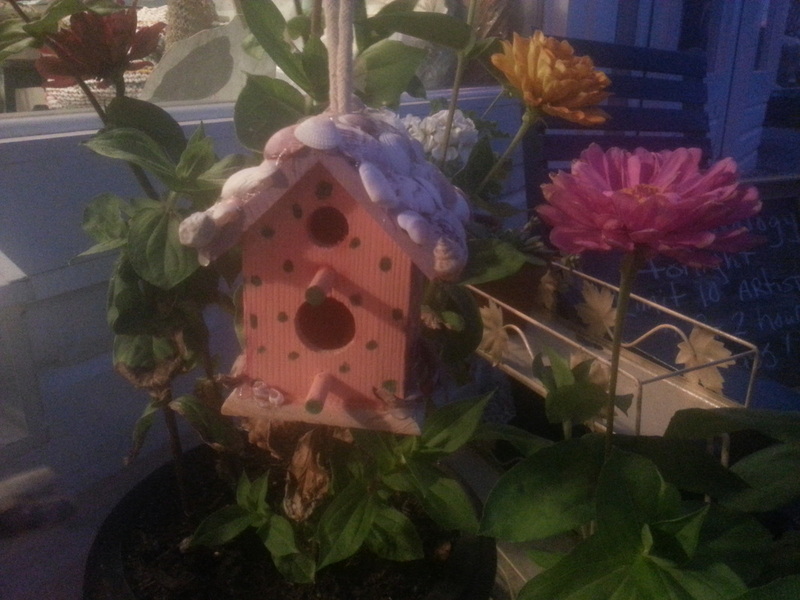 "Won't you come into the garden? I would like my flowers to see you." 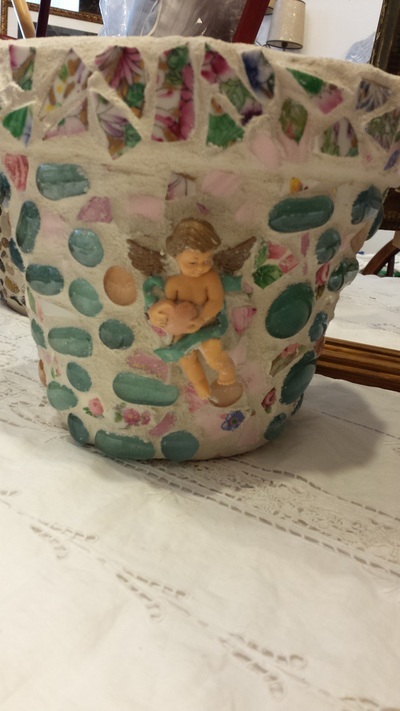 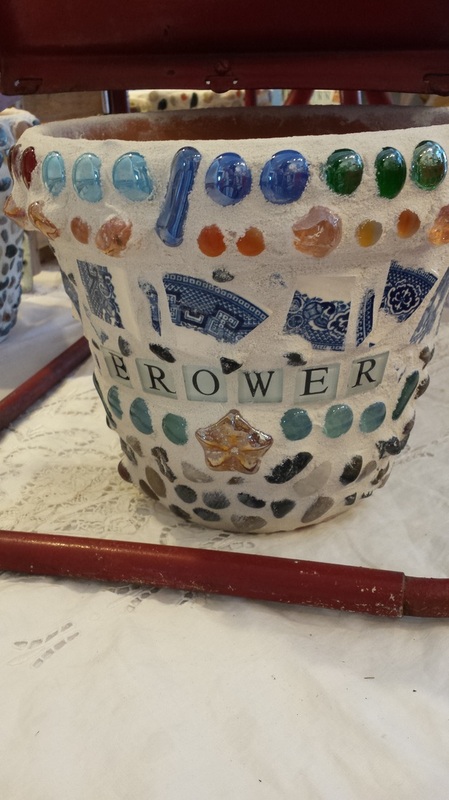 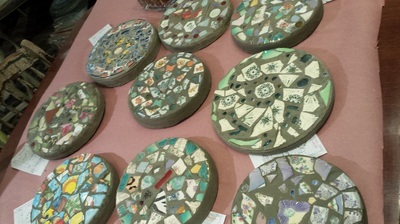 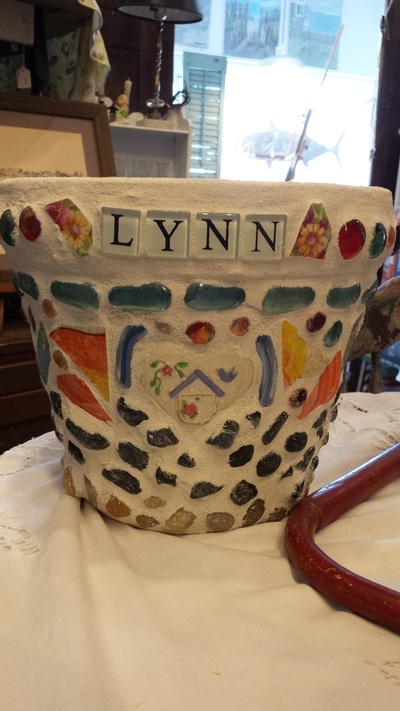 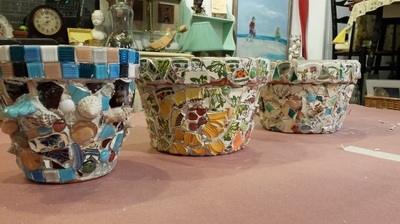 Enhance your garden path with a hand made mosaic stepping stone or flower pot. 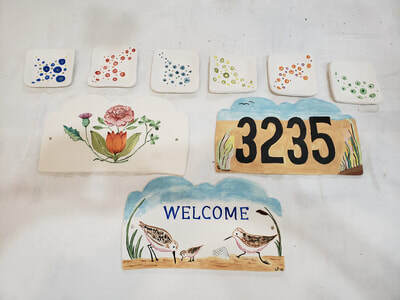 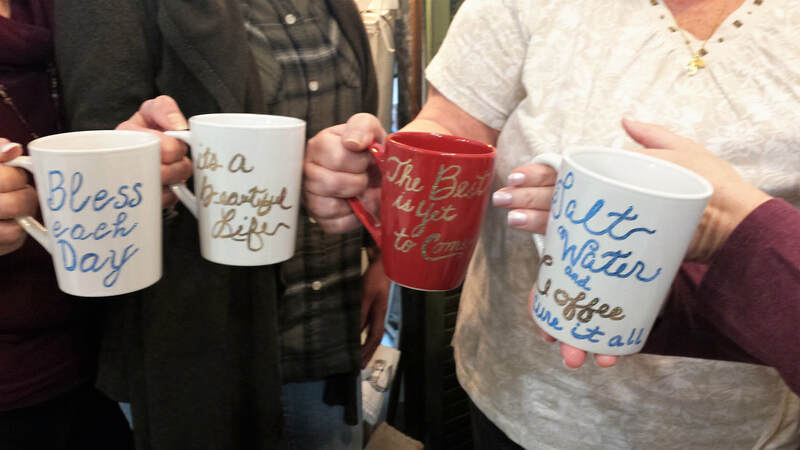 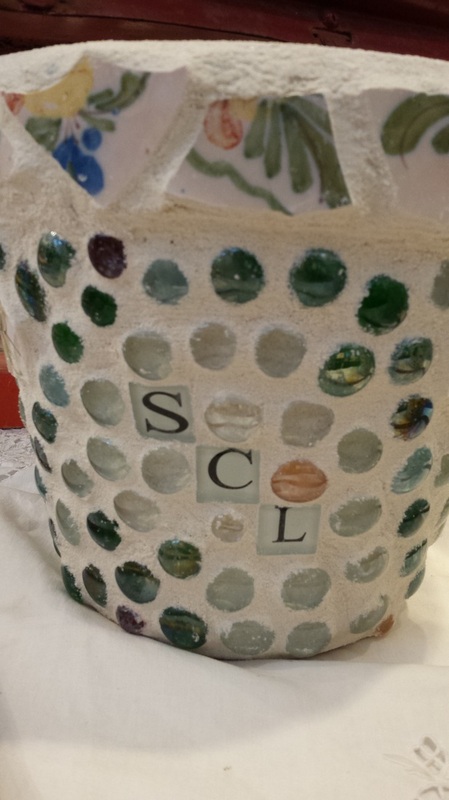 Personalize your creation with a special plate or memento. 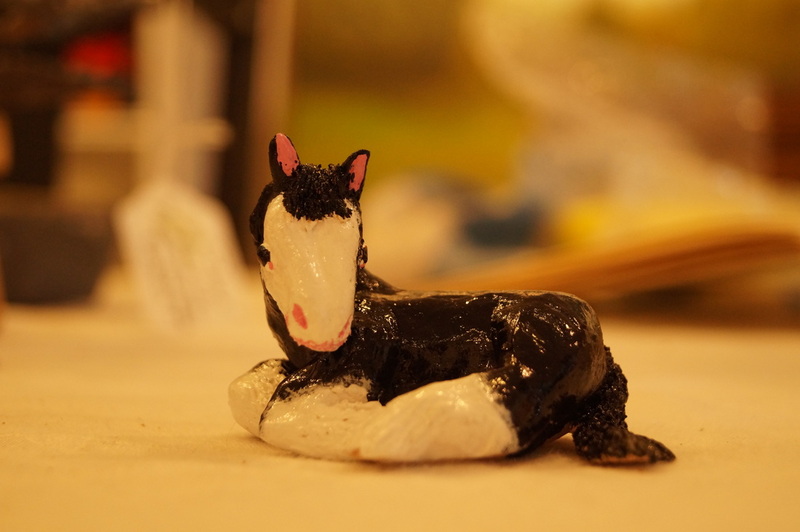 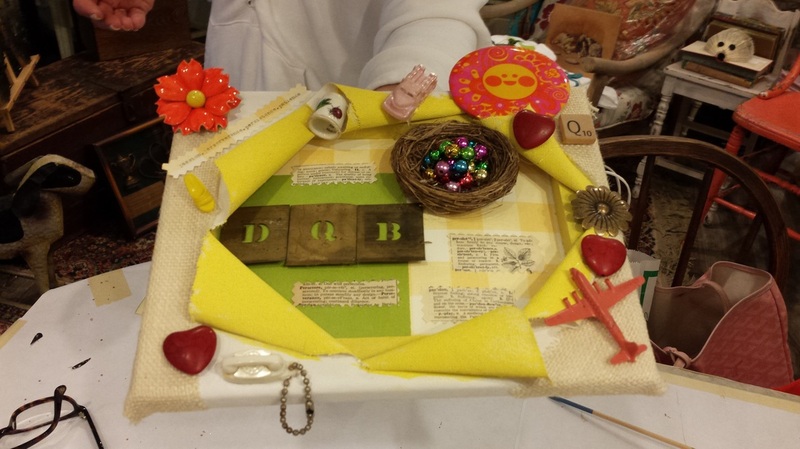 Stretch your creative wings by breaking away from the restrictions of a single art medium! 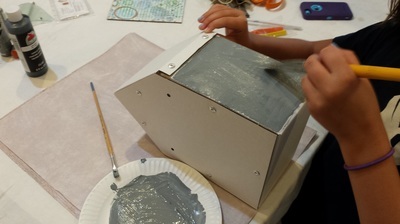 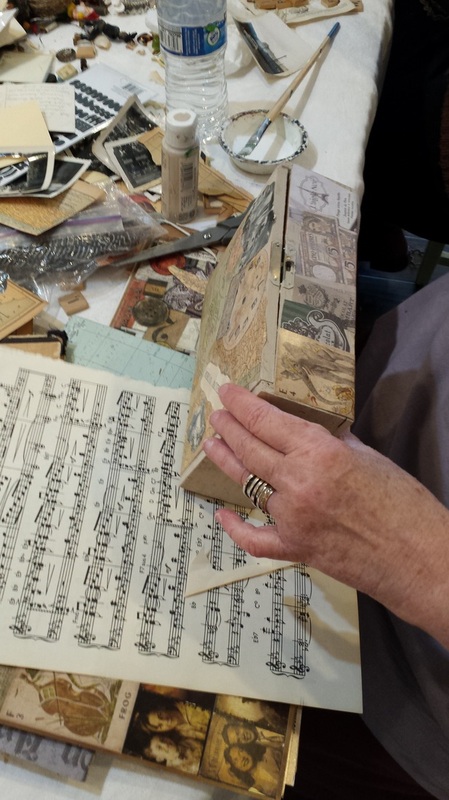 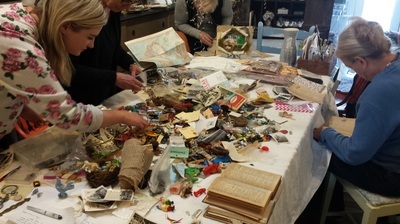 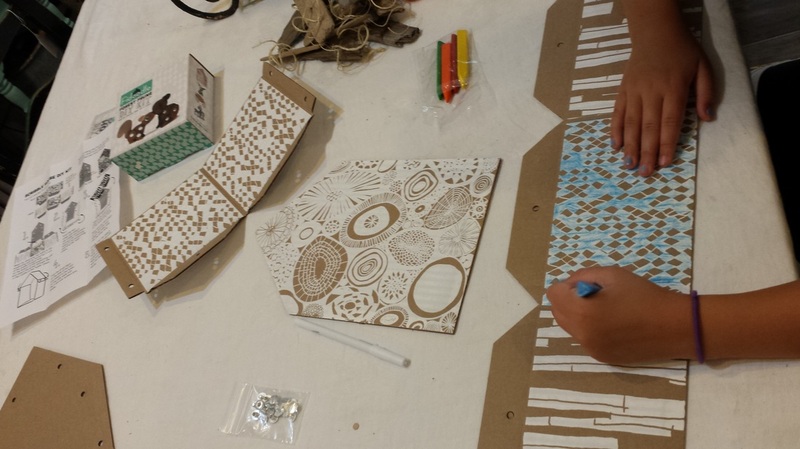 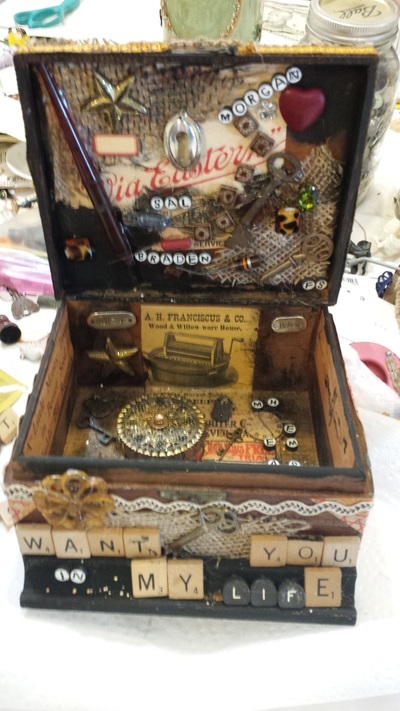 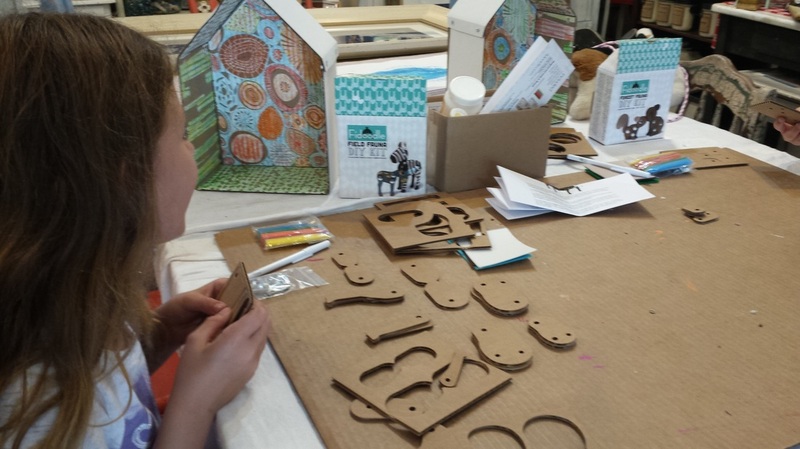 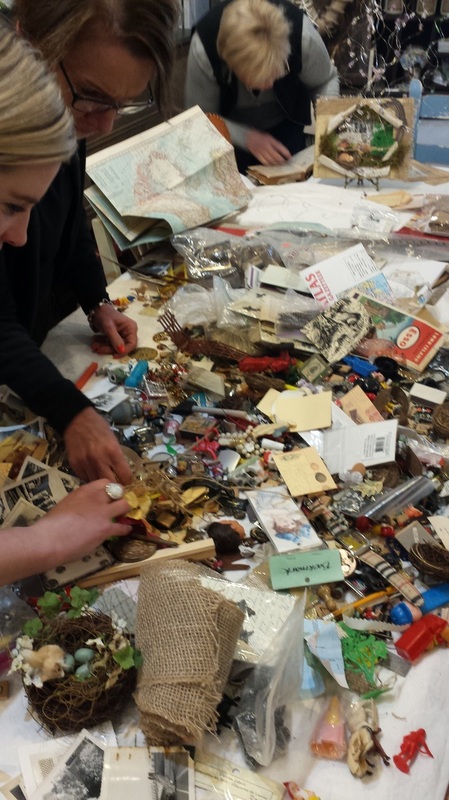 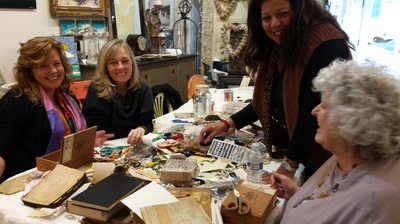 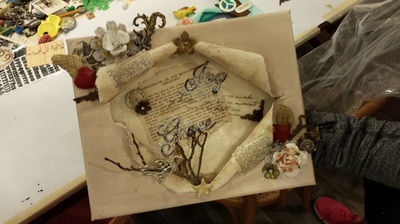 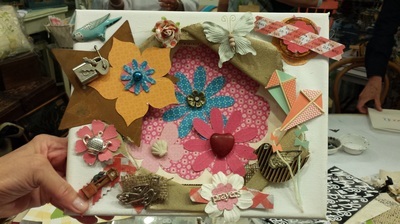 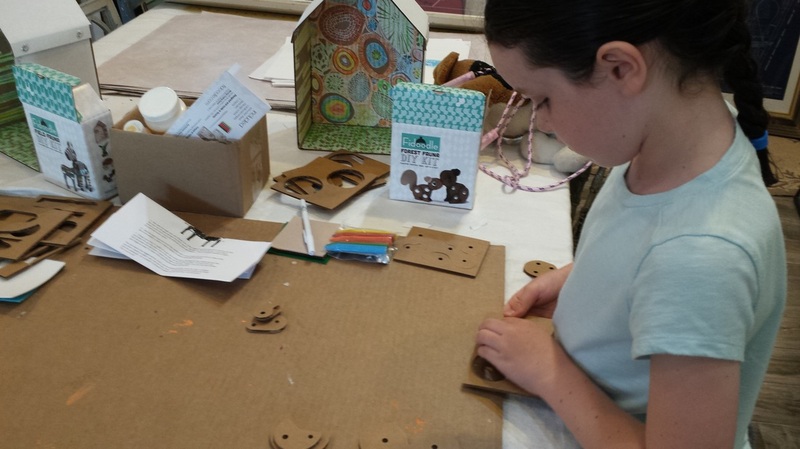 Mixed-media workshops provide artists of all levels the chance to explore the elaborate and multidimensional world of collage by combining vintage trinkets and original flea market finds with materials like canvas, shadow boxes, paper, fabric, paint, free-hand drawing, and more — in new and unlikely ways. Bring a favorite quote / personal image and build a unique vignette around it. 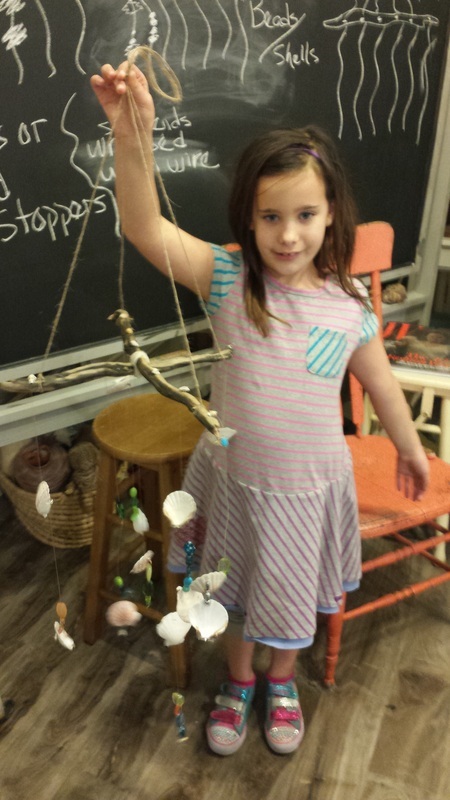 Class size limited. 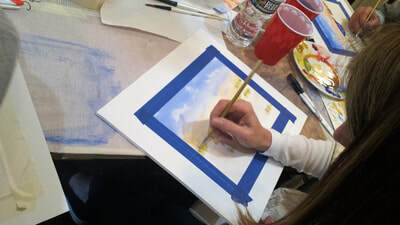 Connect and reserve your place. 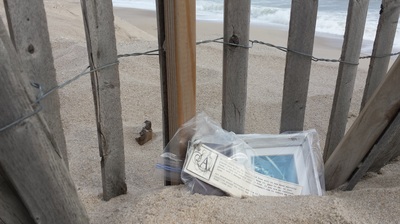 "Serenade your mind....and your outdoor space." 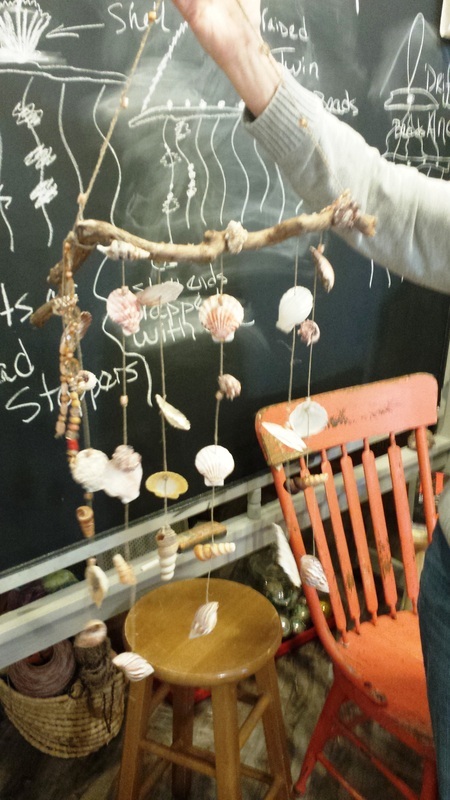 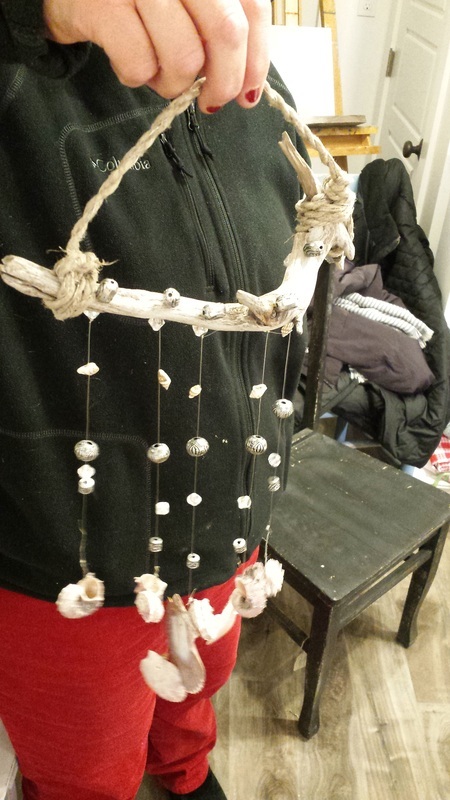 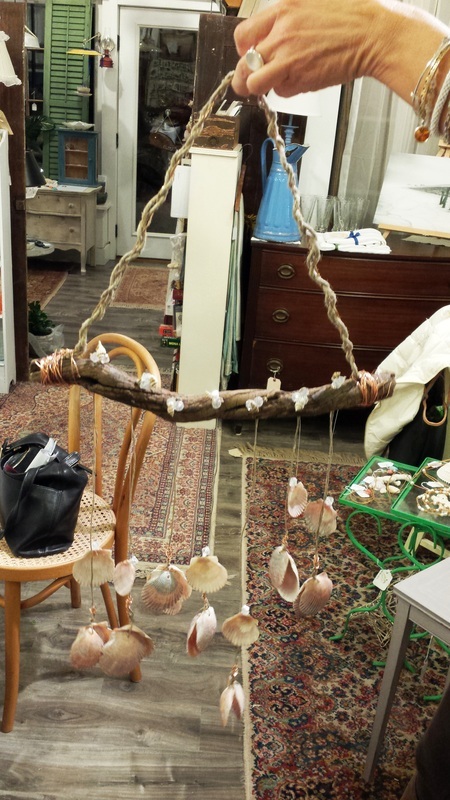 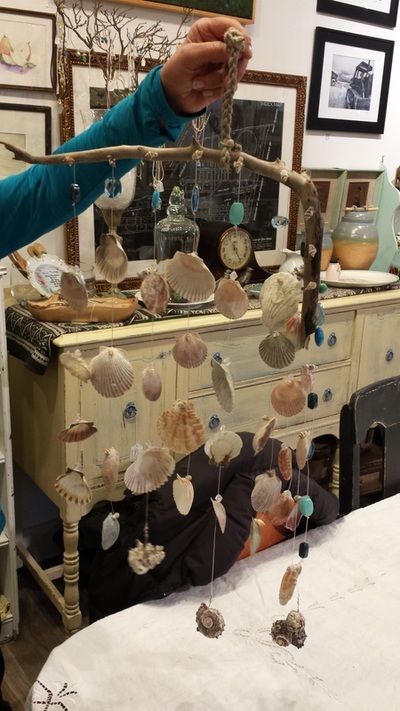 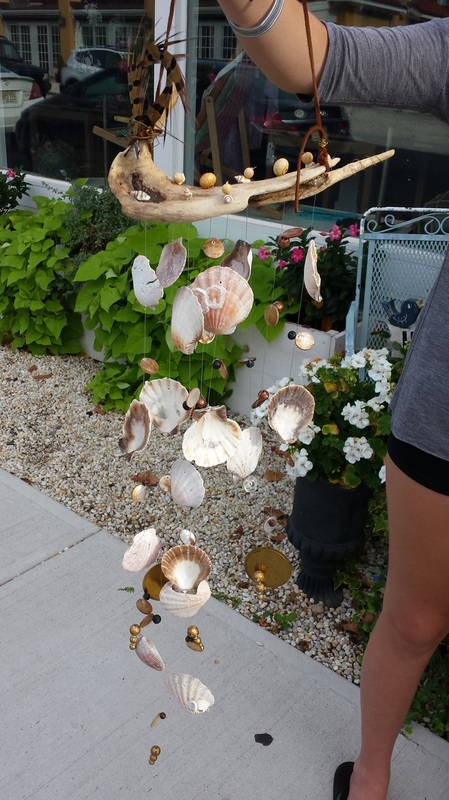 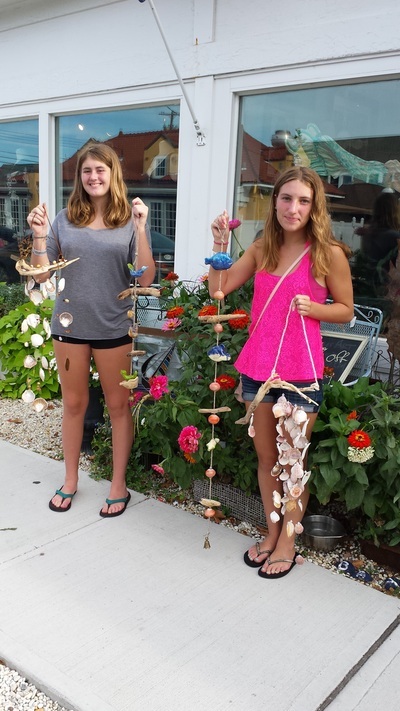 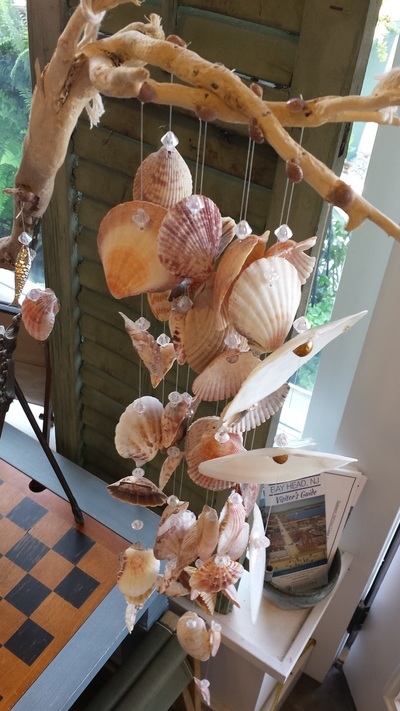 Bring the gifts of the sea together by creating your own sea chime. Seeking something to do on a rainy day? 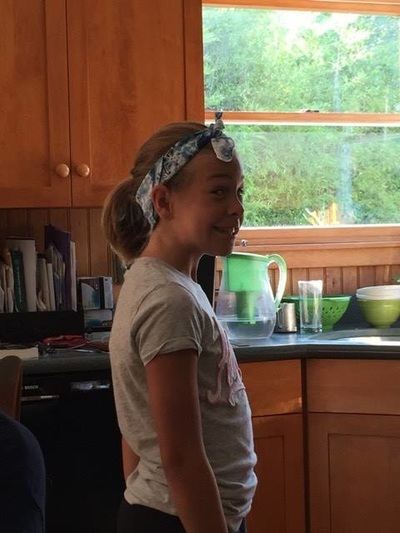 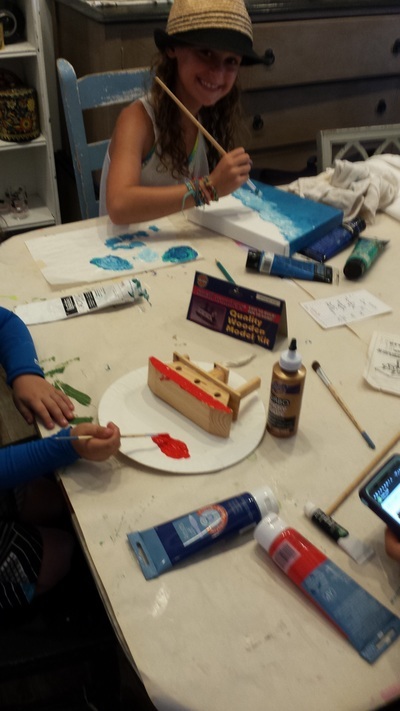 How about a budding artist birthday party? 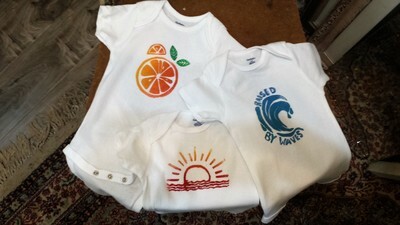 The possibilities are endless....Contact ReFind! 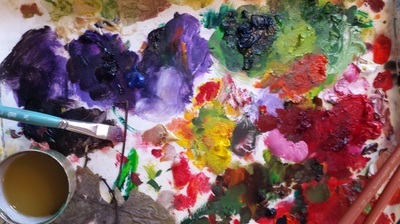 Color theory for our feathered friends. Asian inspired watercolor and printing. Express yourself with recycled materials, inspiration, reflection and basic hand stitching. 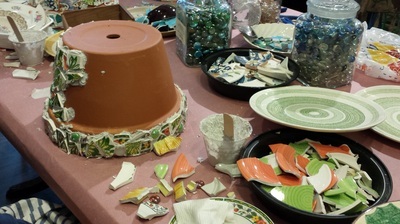 An array of materials on premises. If there is something special you want to incorporate, just bring in. 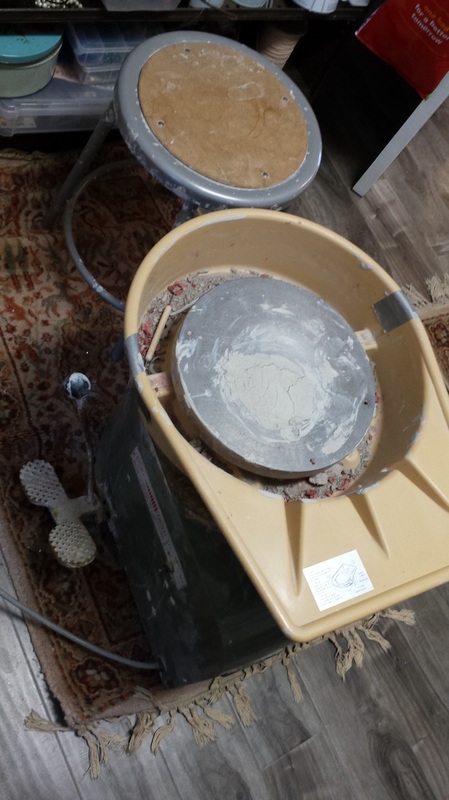 Dry time is 24/72 hours. Then grouted on premises and ready for pick up.